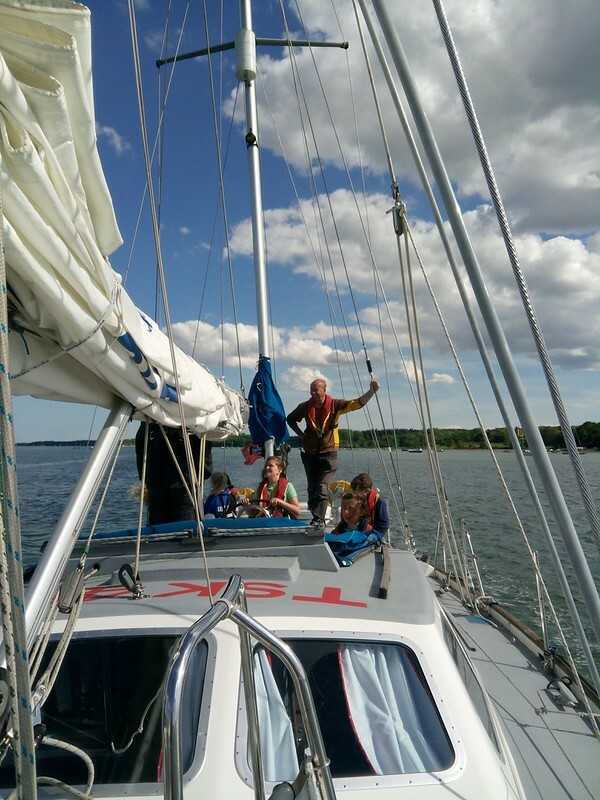 Canada 2017 - Getting there! 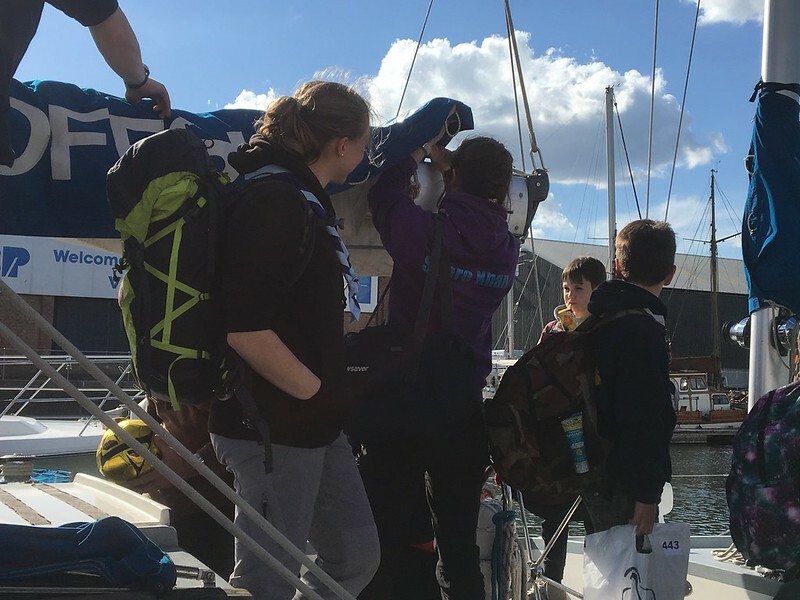 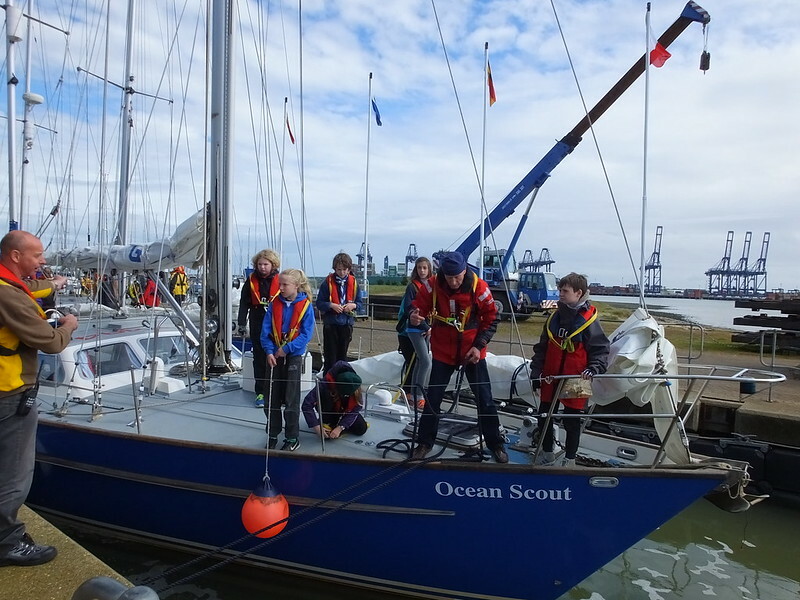 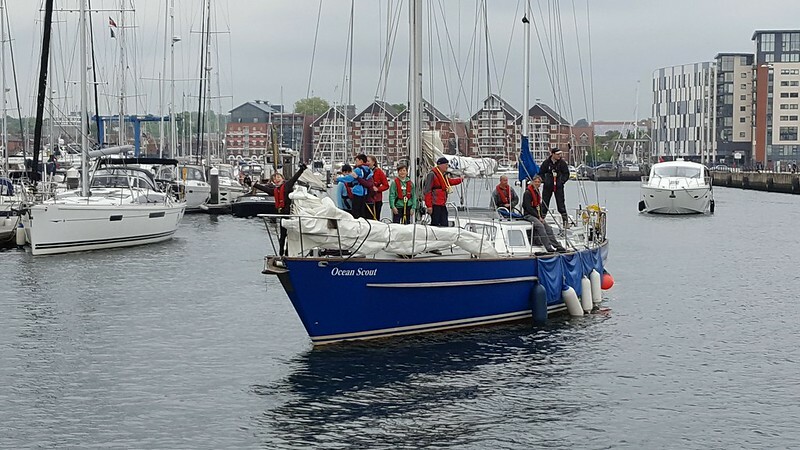 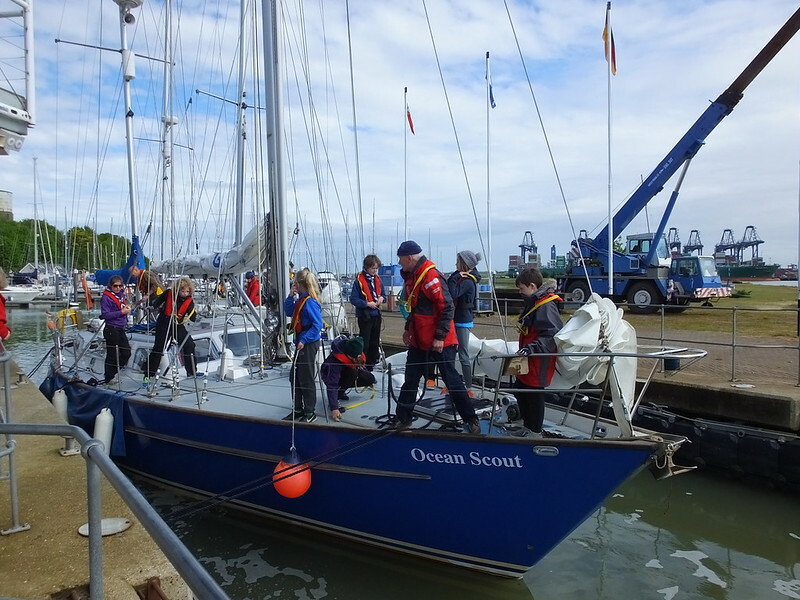 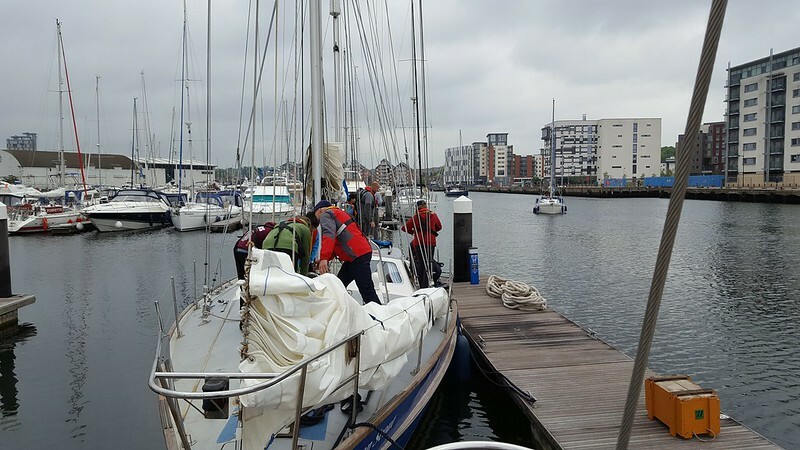 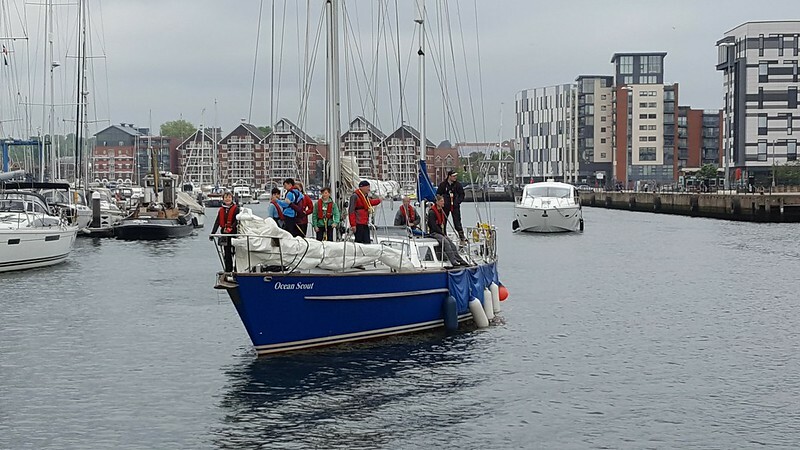 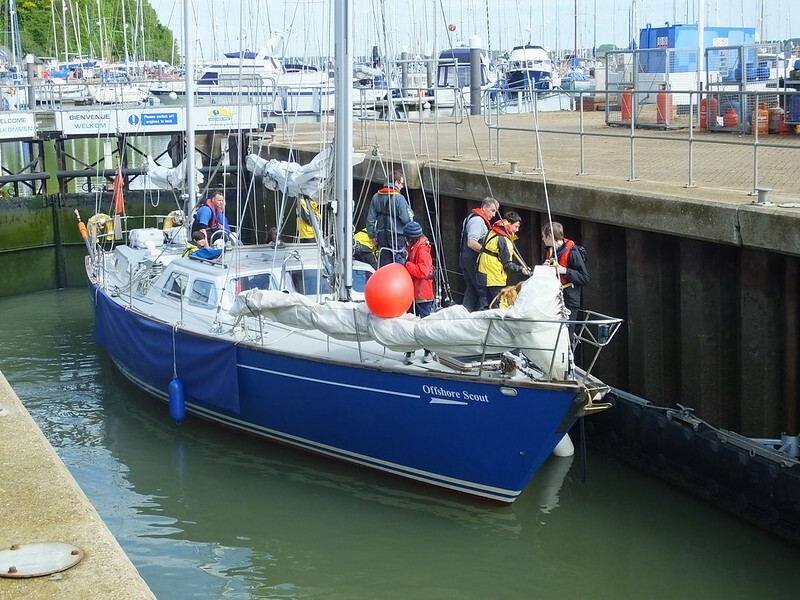 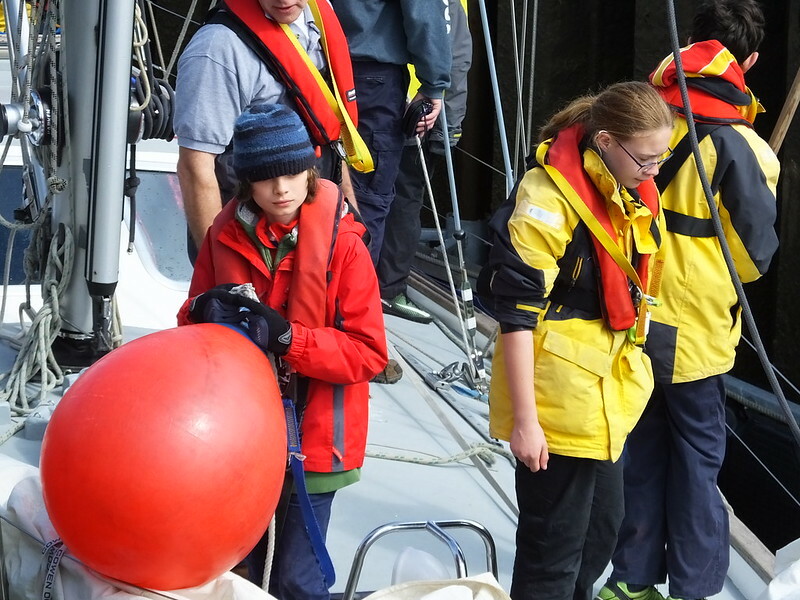 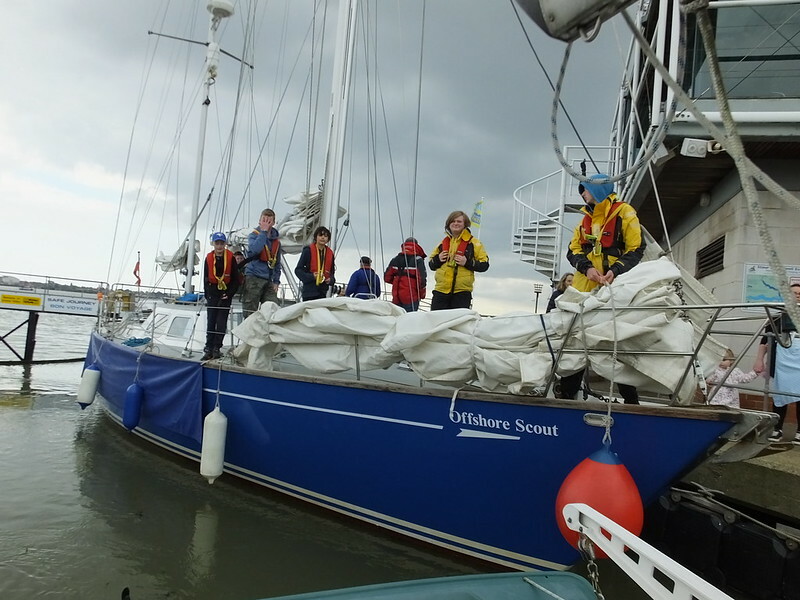 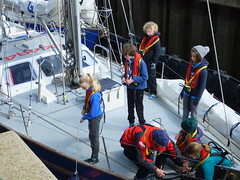 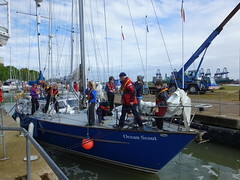 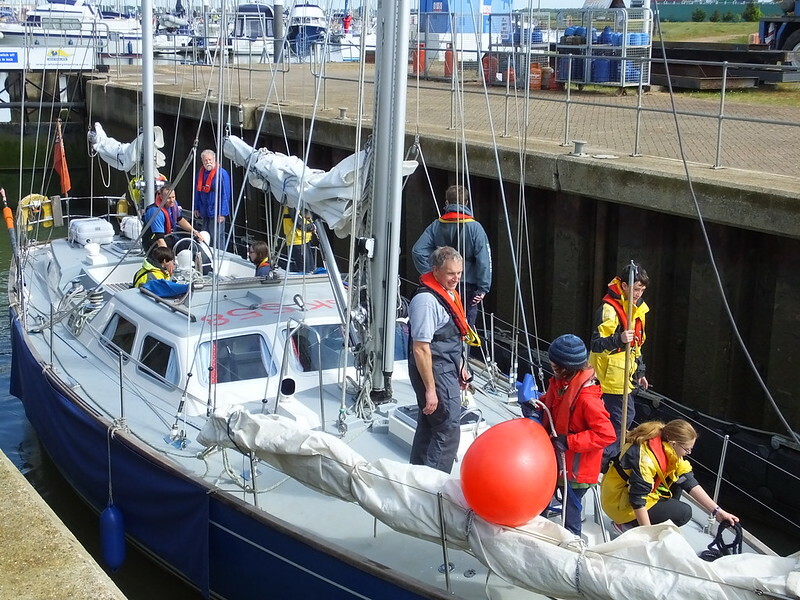 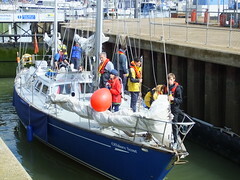 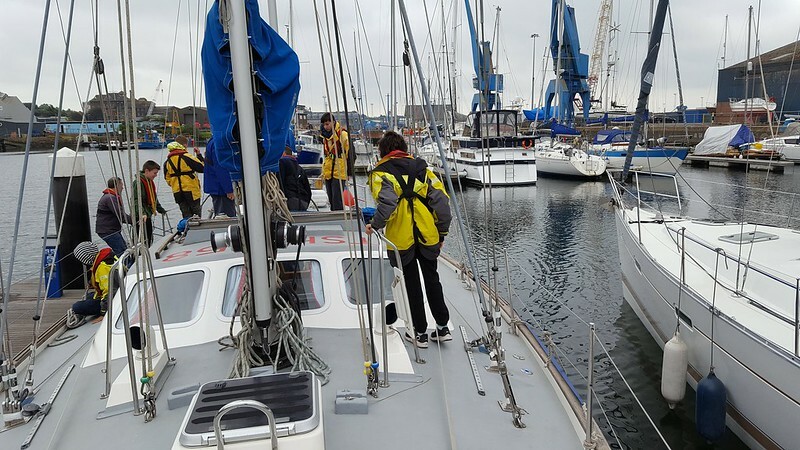 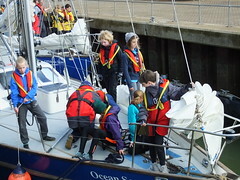 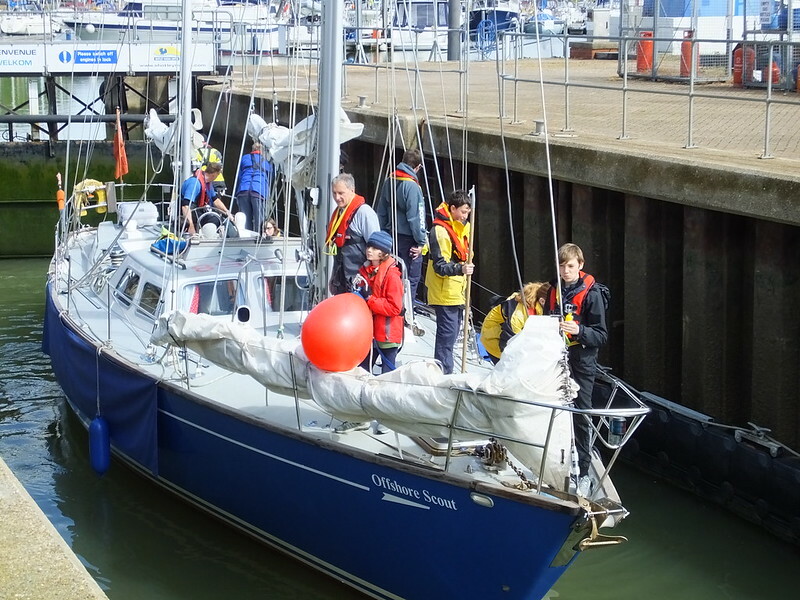 Assembling early morning for a briefing and issuing of waterproofs & life-jackets, 20 scouts and leaders headed out from Ipswich Haven on a pair of 49-foot Oyster yachts. 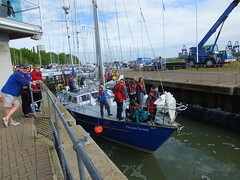 Passing through the lock, they were soon under the Orwell Bridge and powering down the river towards the North Sea at 6 to 7 knots. 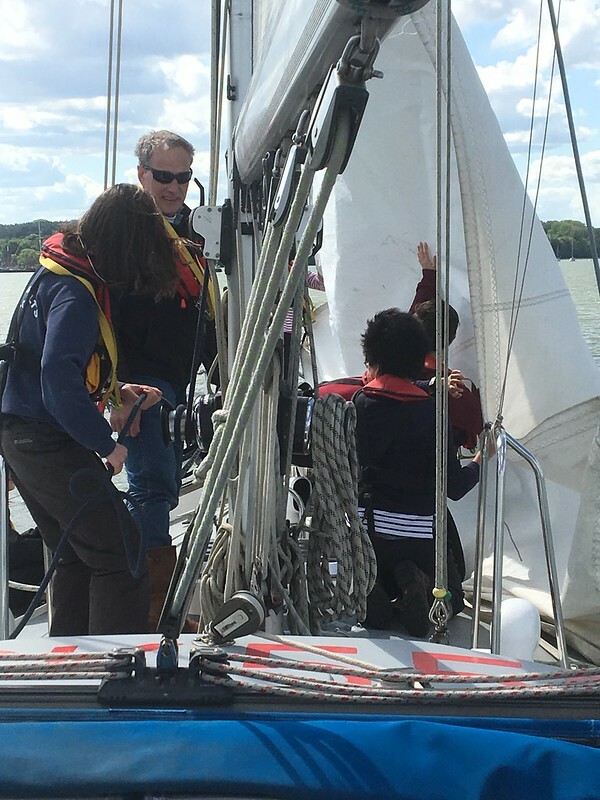 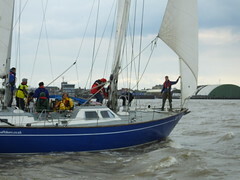 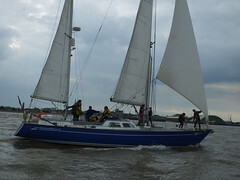 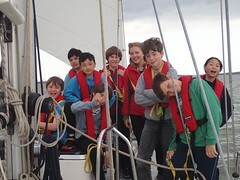 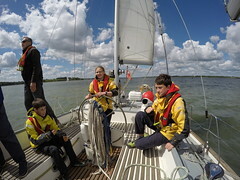 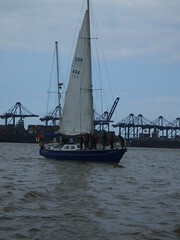 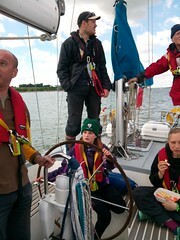 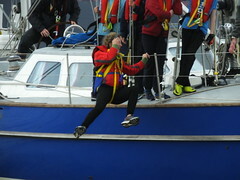 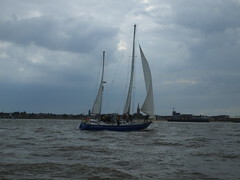 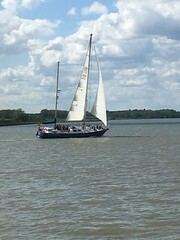 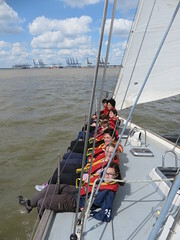 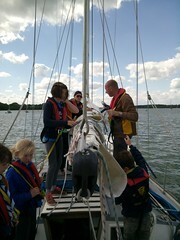 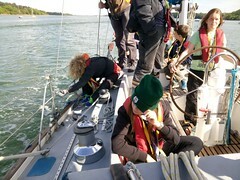 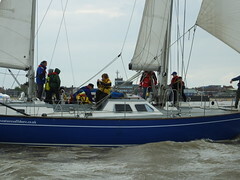 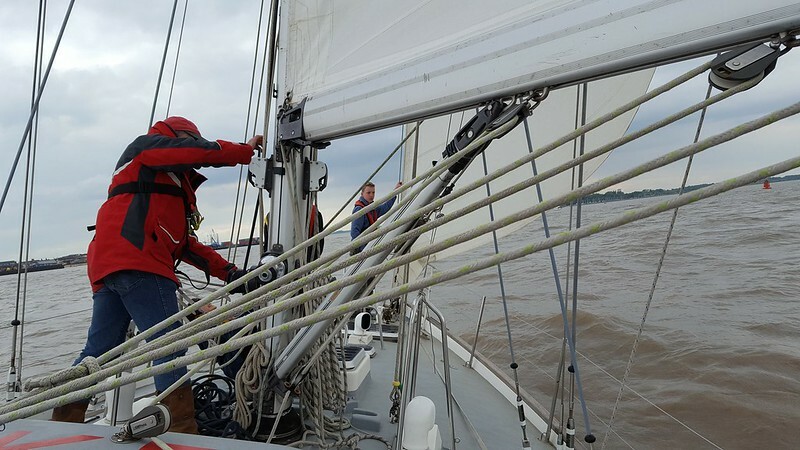 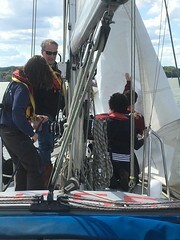 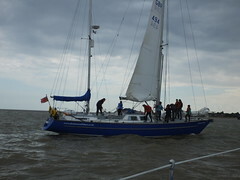 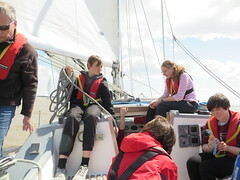 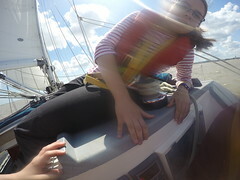 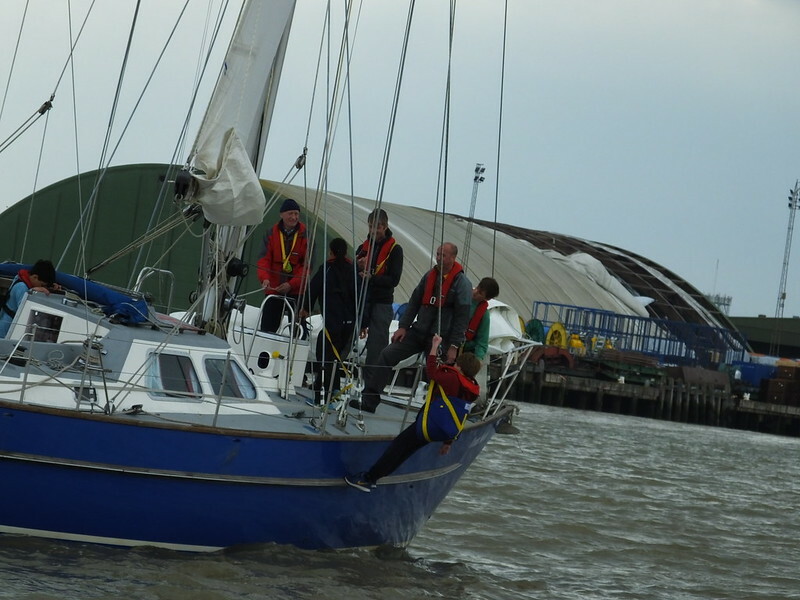 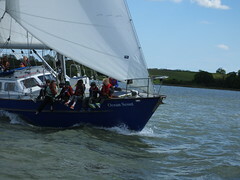 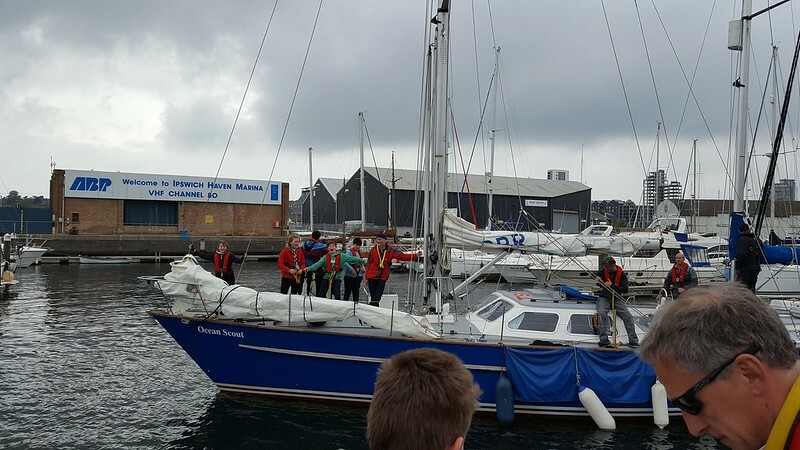 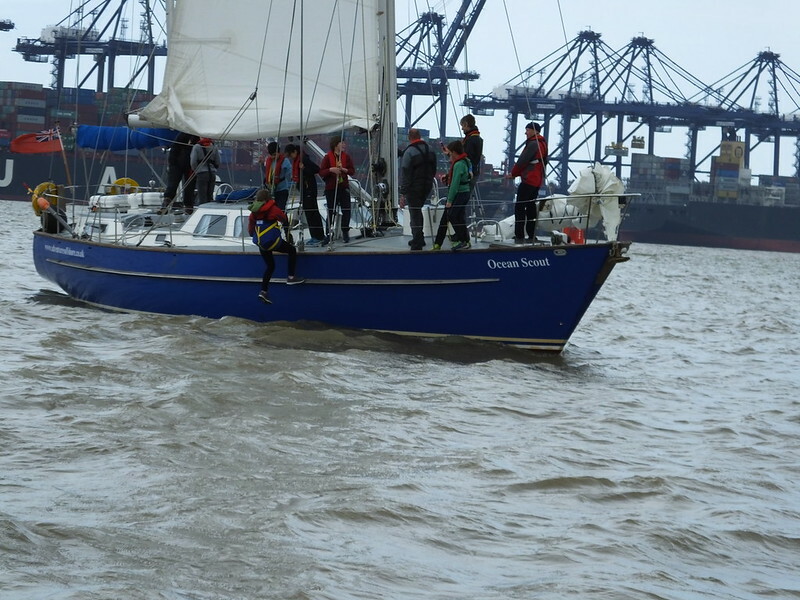 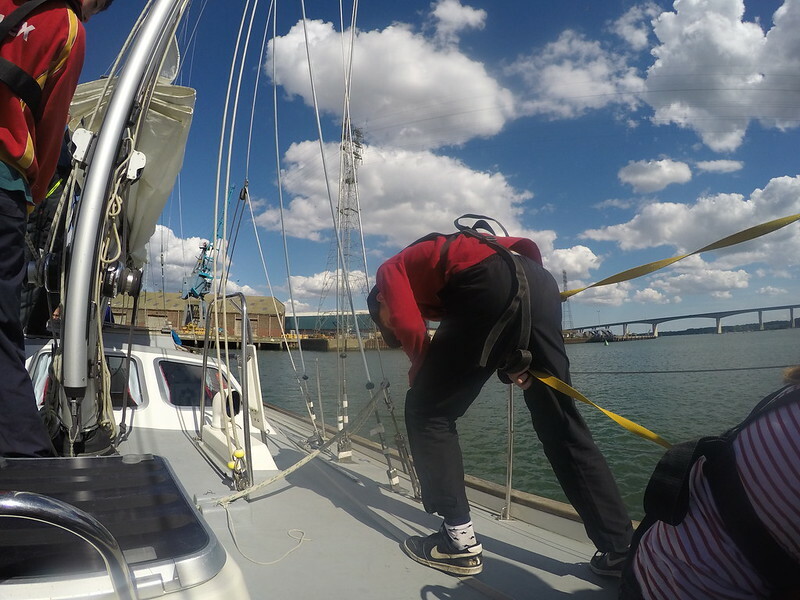 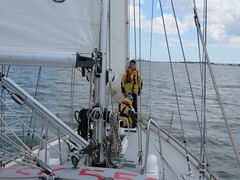 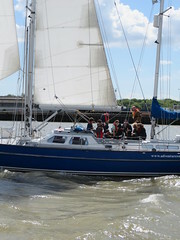 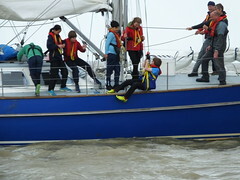 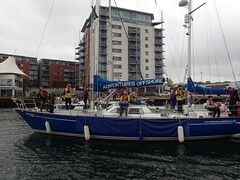 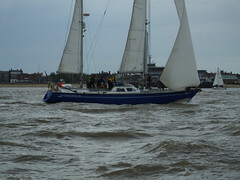 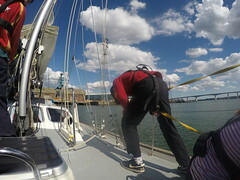 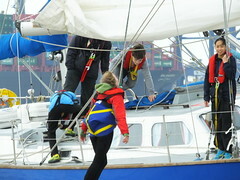 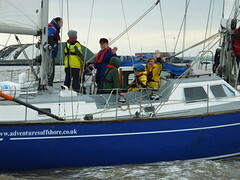 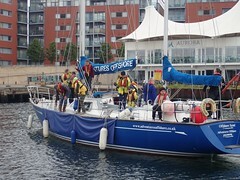 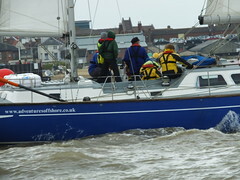 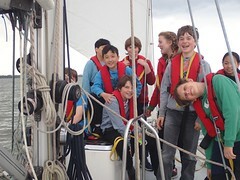 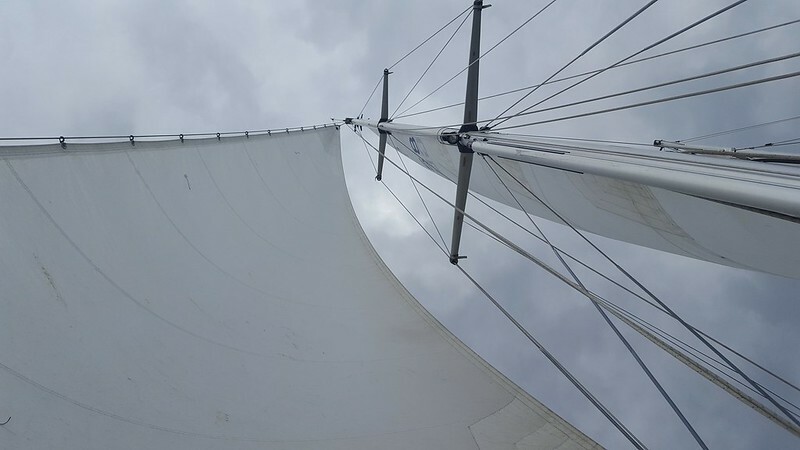 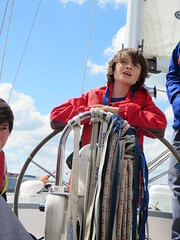 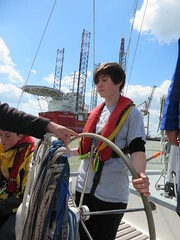 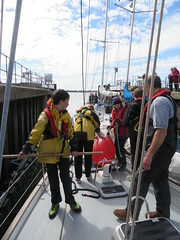 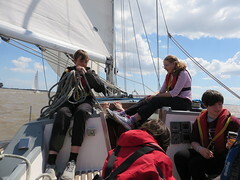 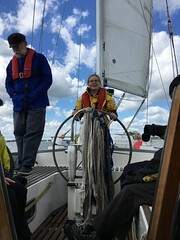 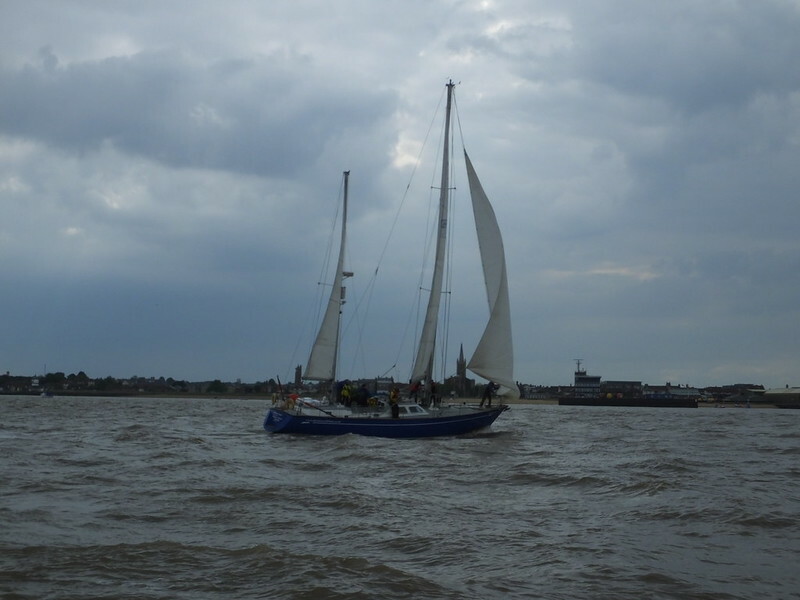 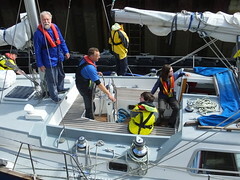 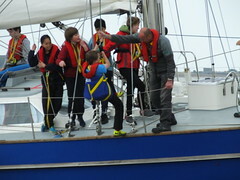 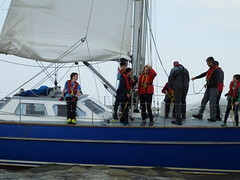 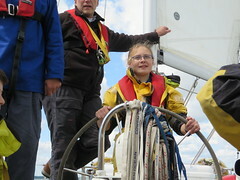 The crews were put through their paces by the skippers, raising & lowering sail, helming and sail-trimming. 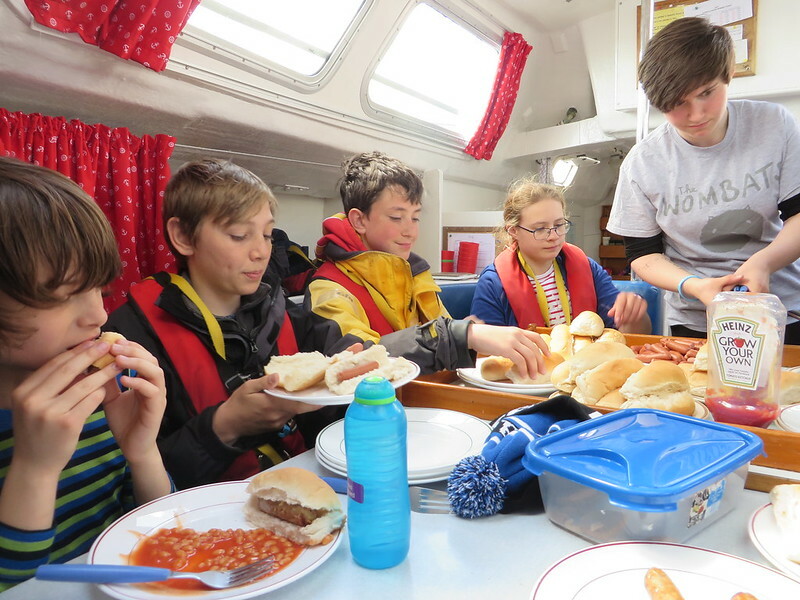 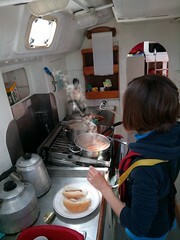 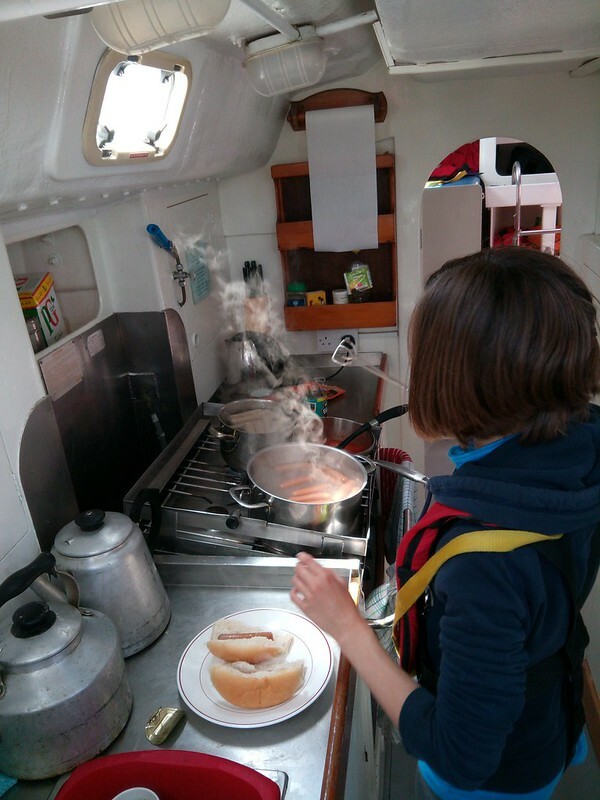 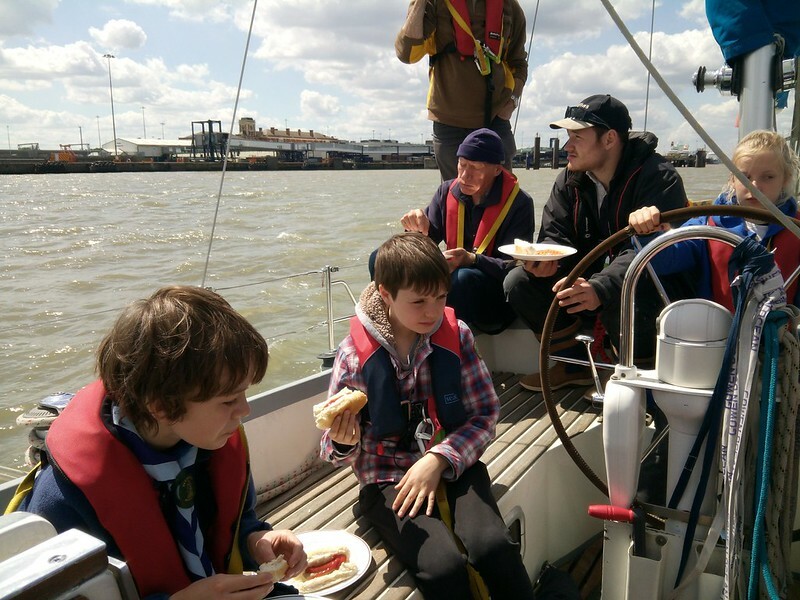 Lunch, cooked by the scouts in the galley below decks, was served in shifts whilst underway. 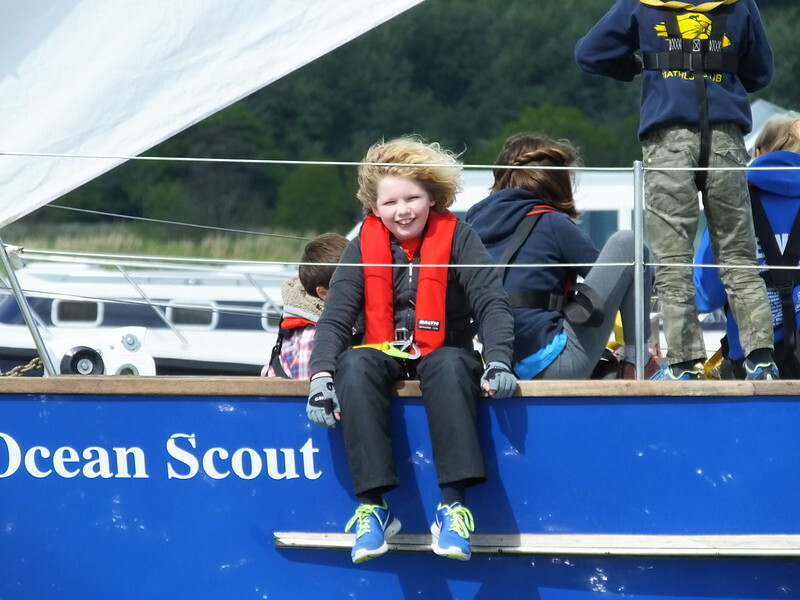 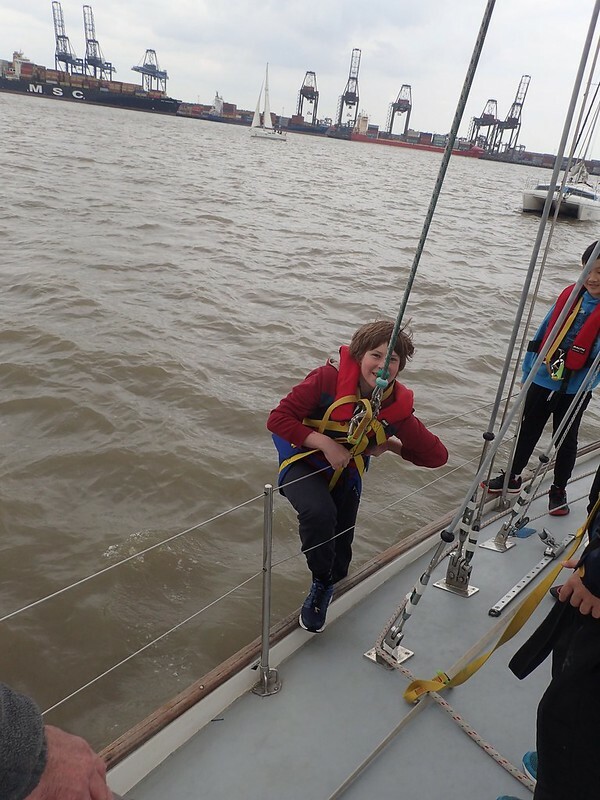 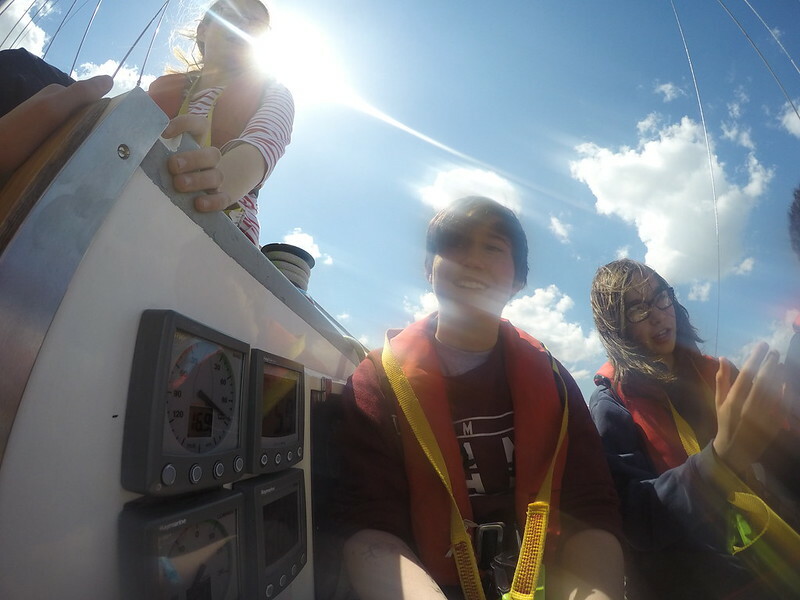 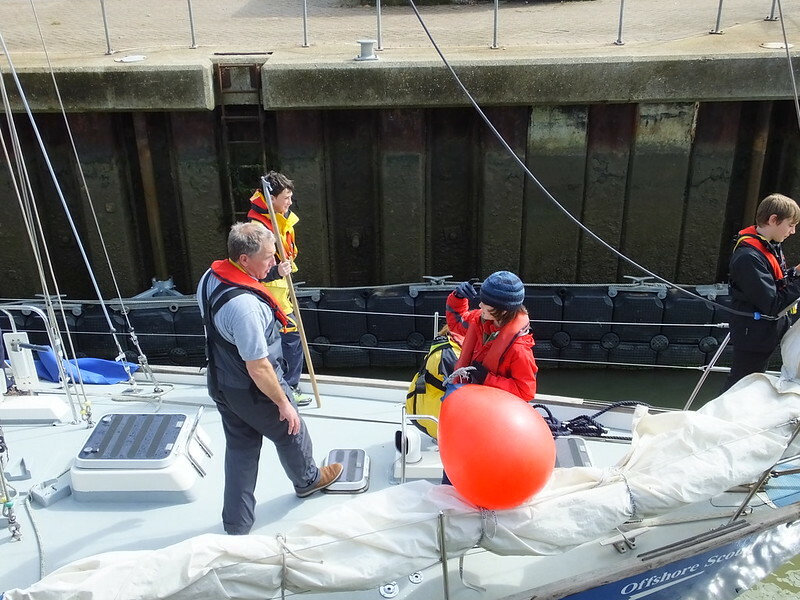 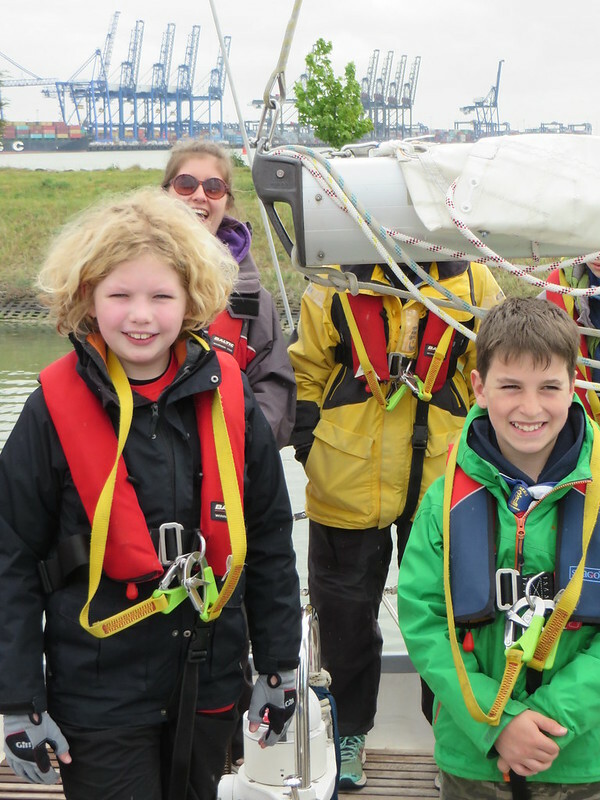 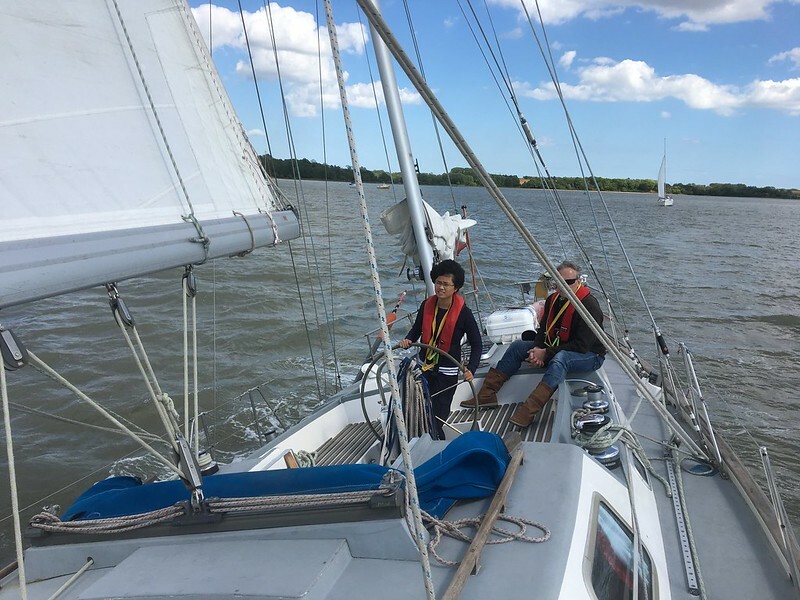 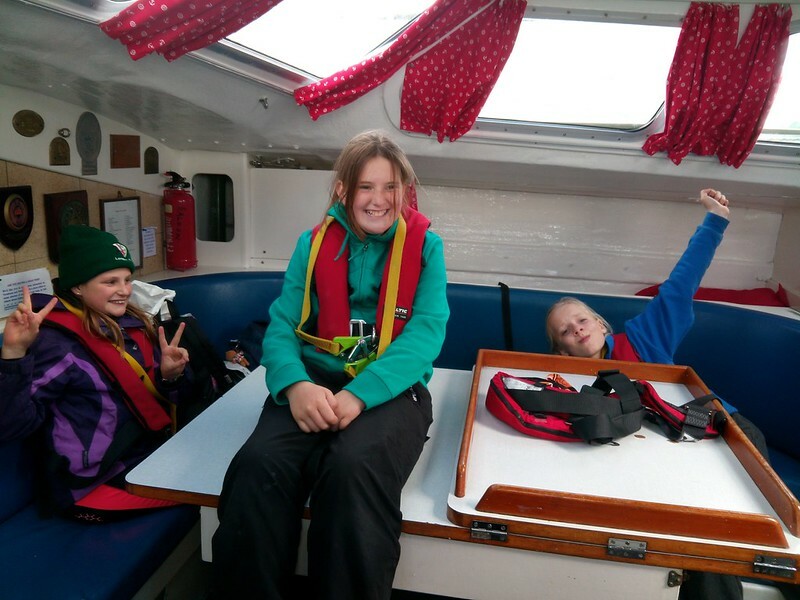 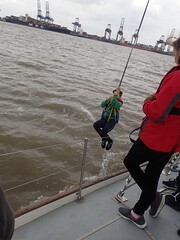 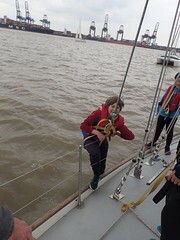 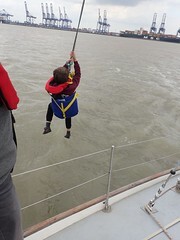 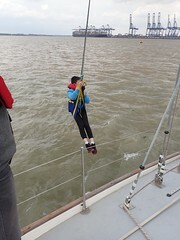 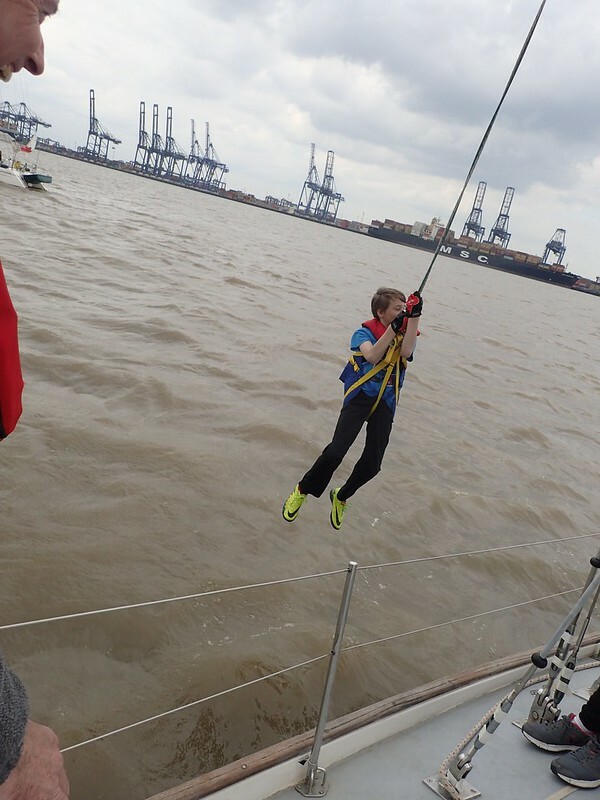 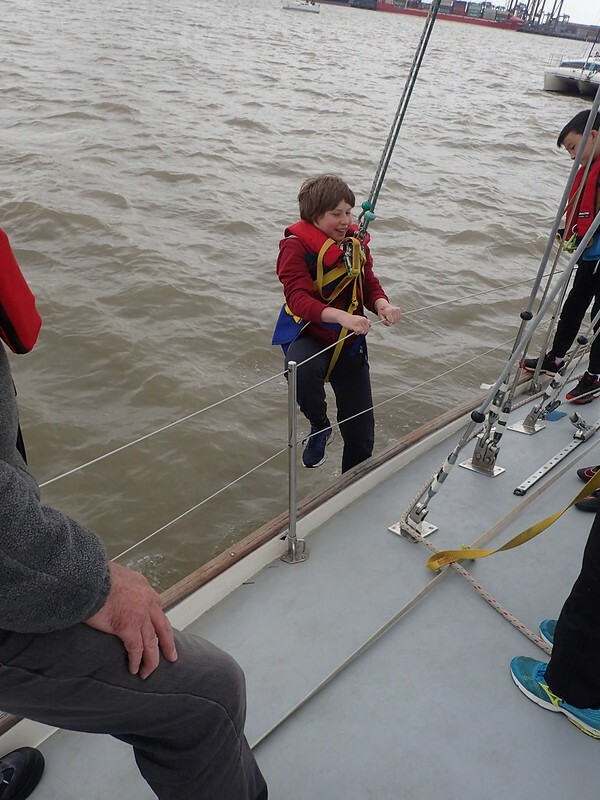 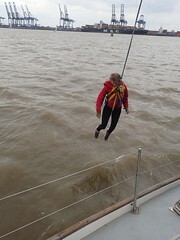 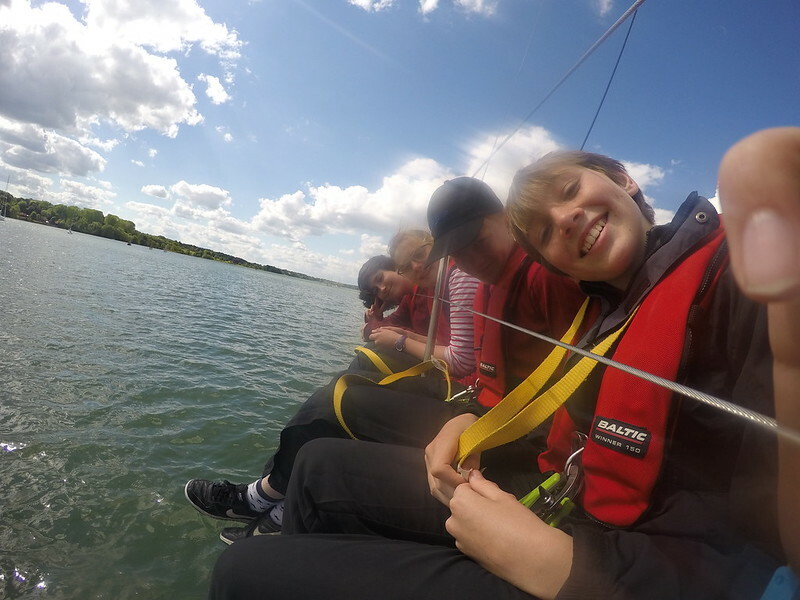 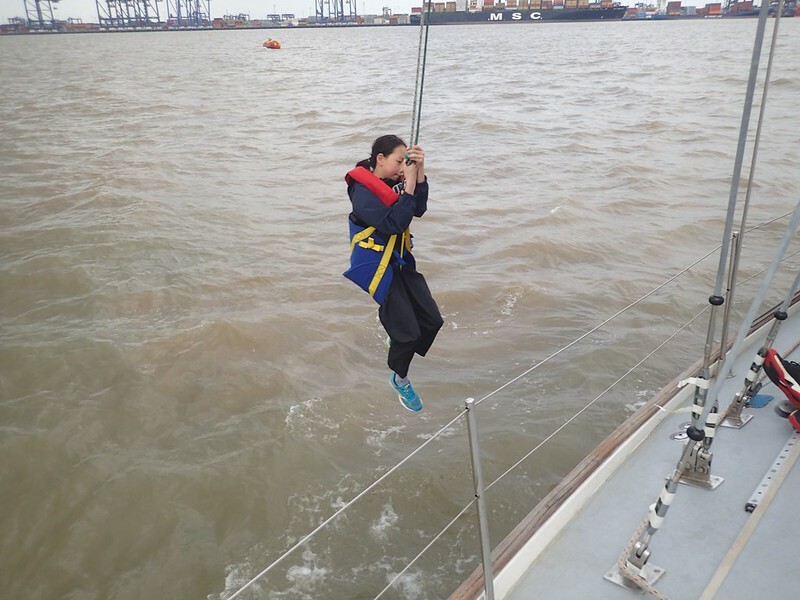 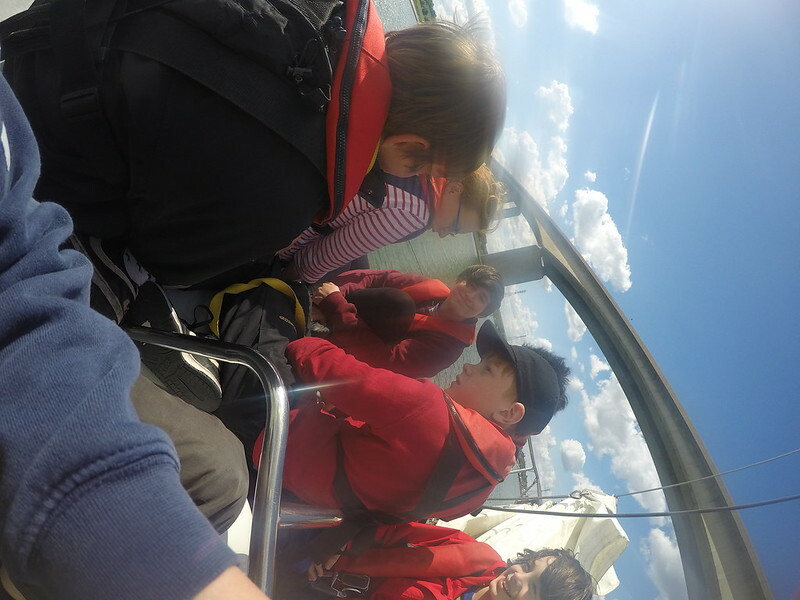 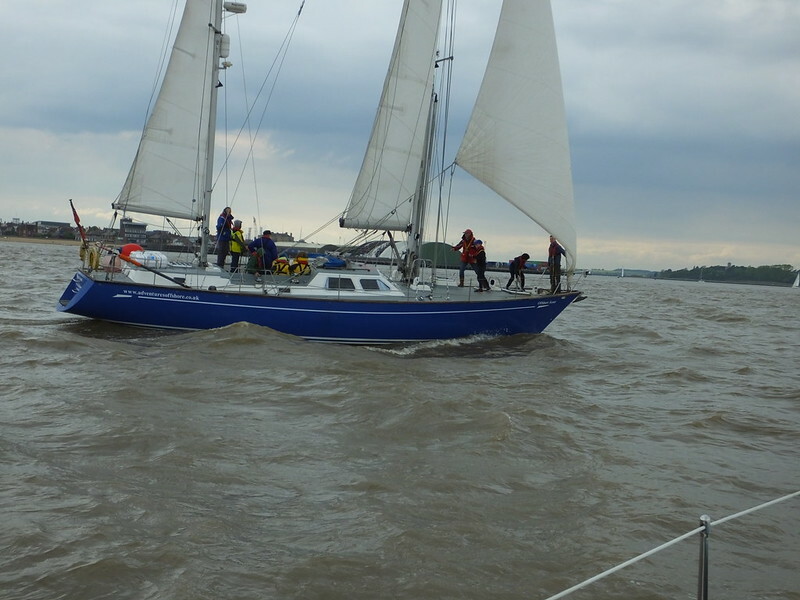 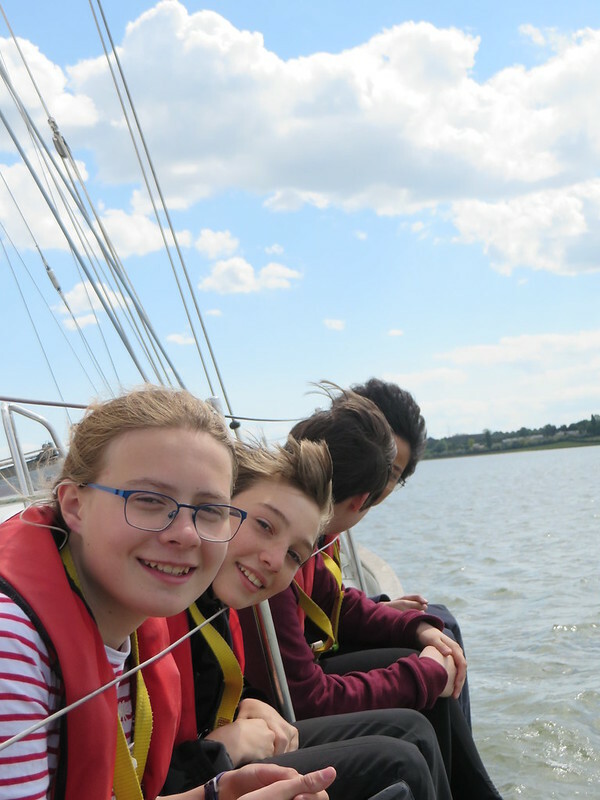 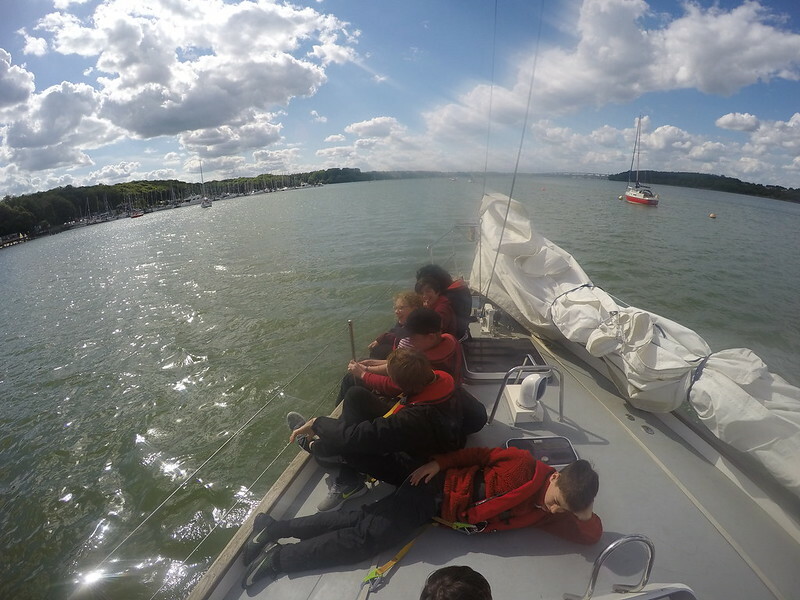 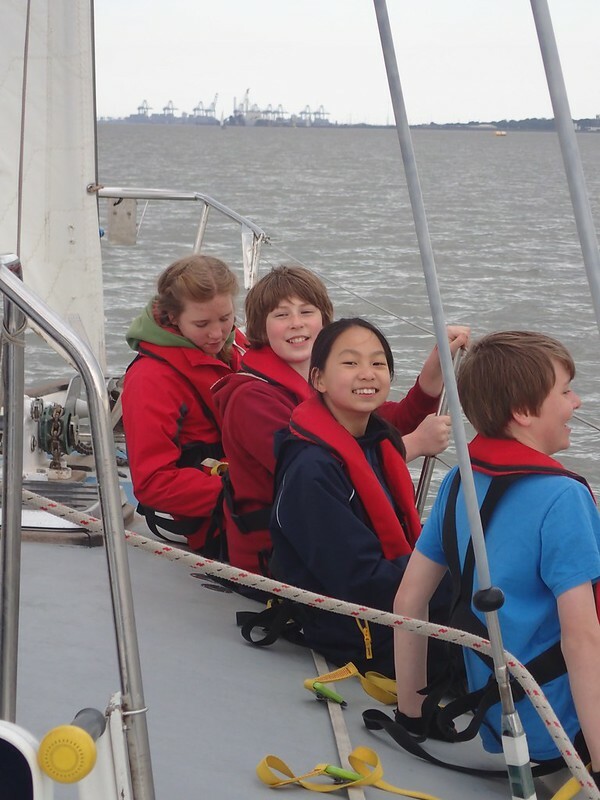 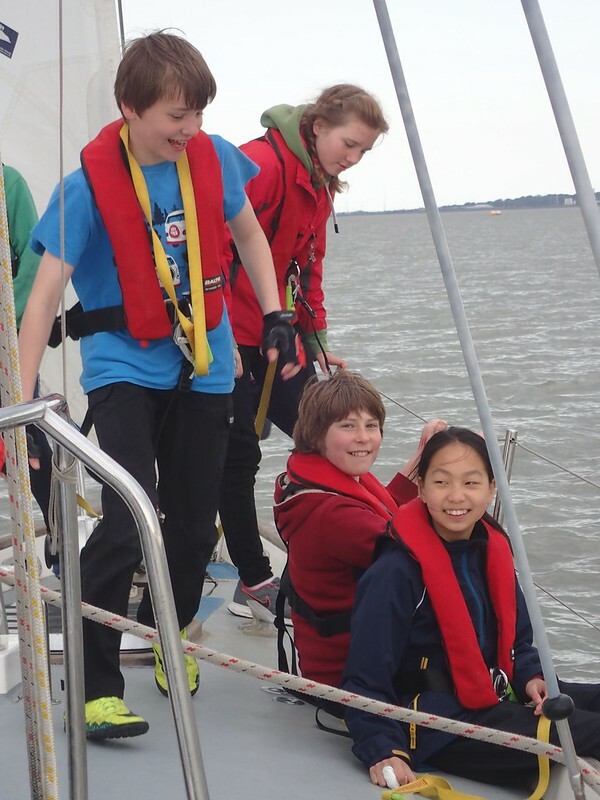 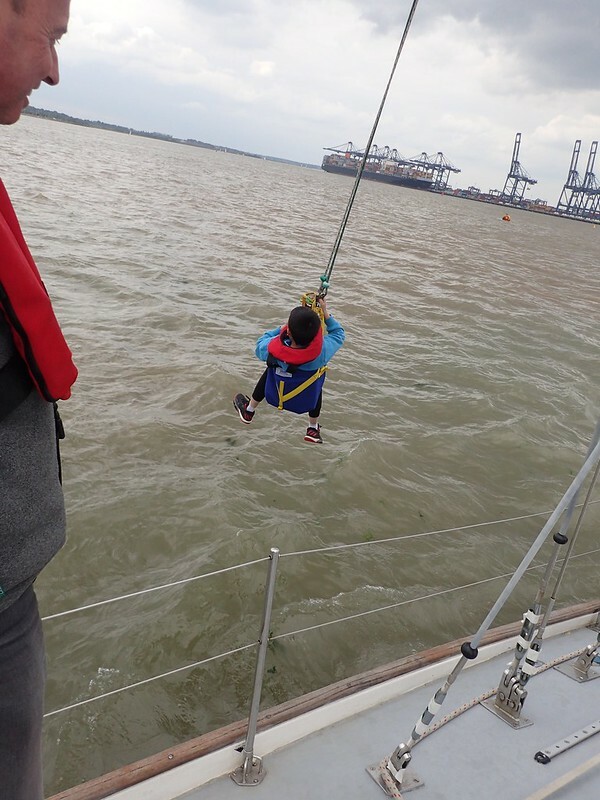 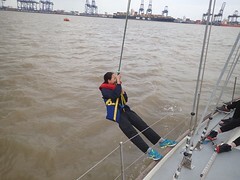 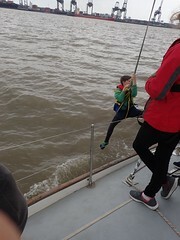 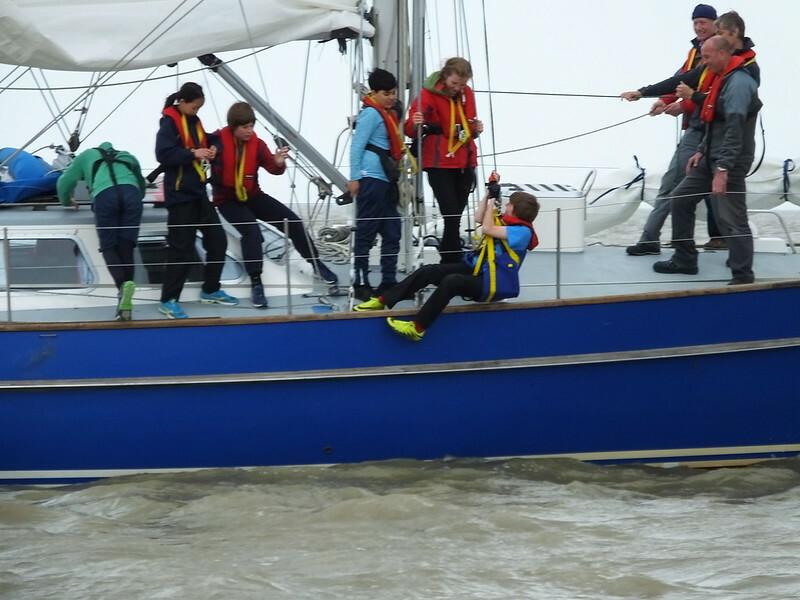 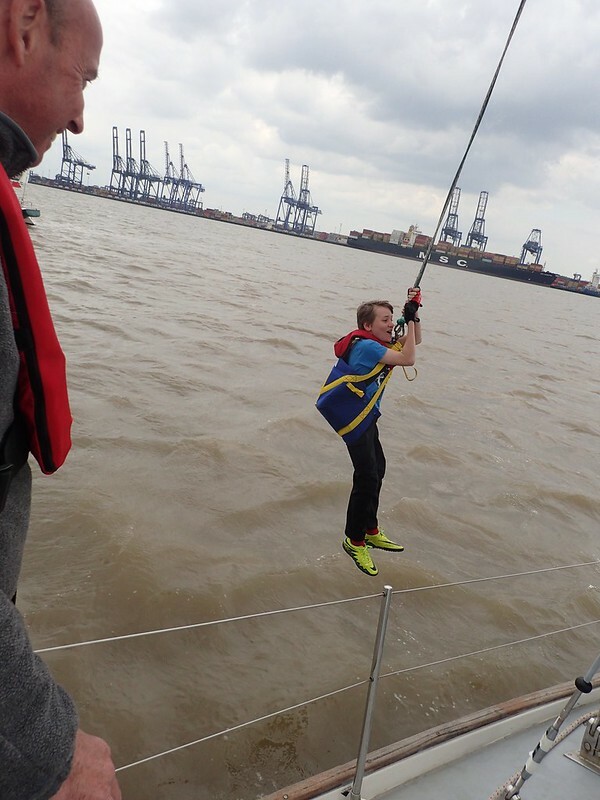 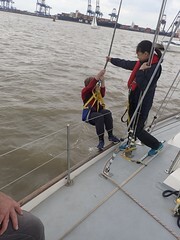 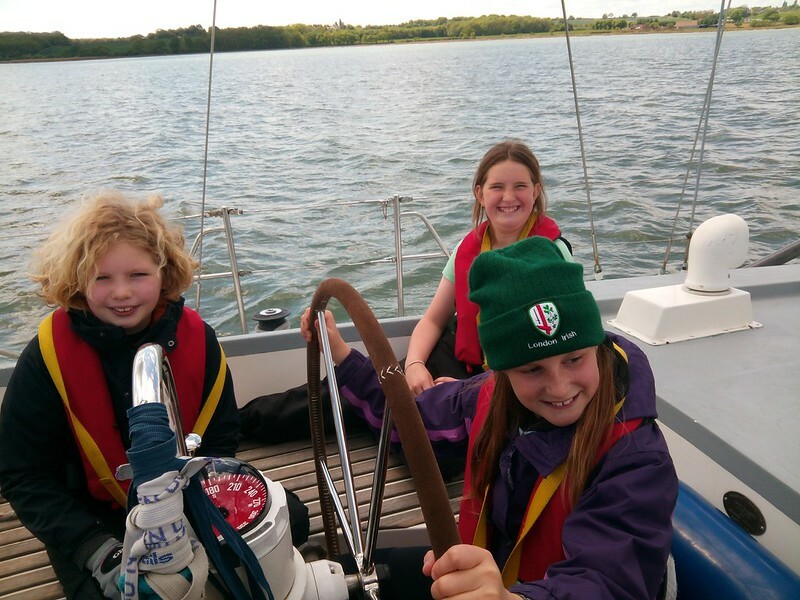 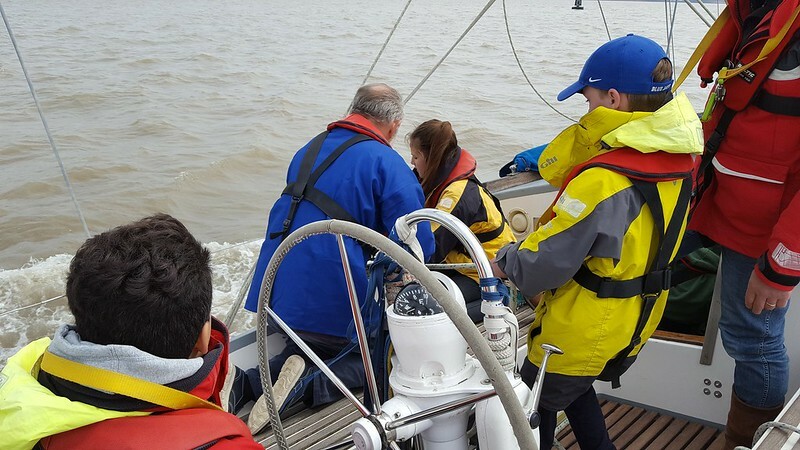 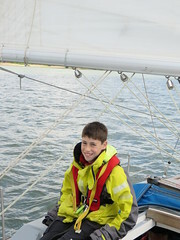 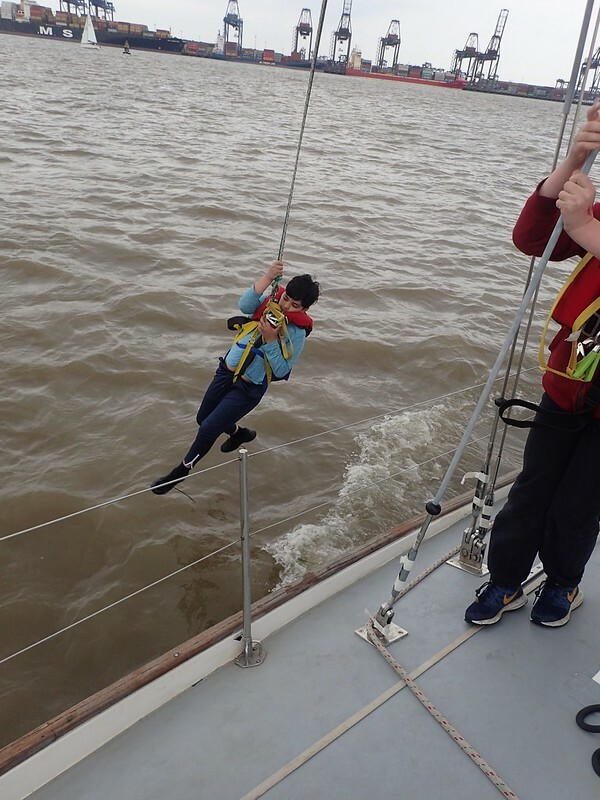 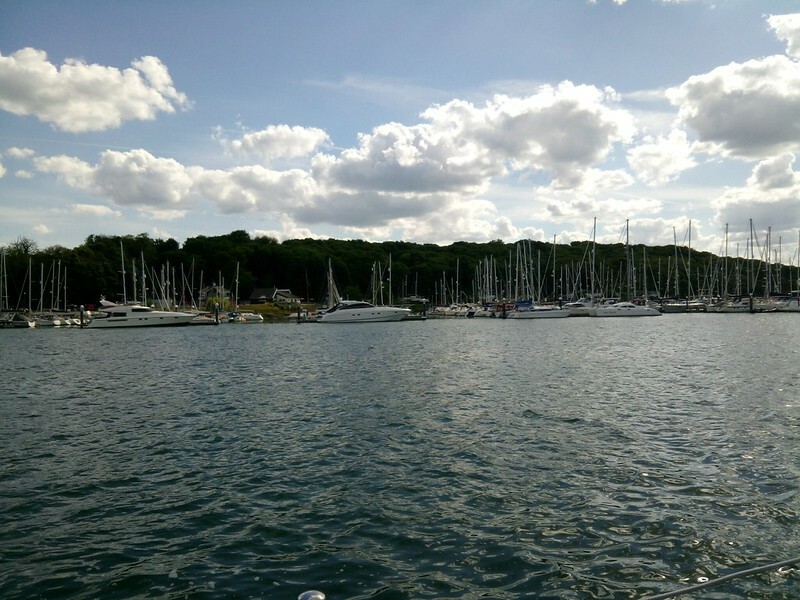 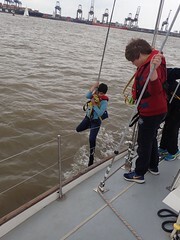 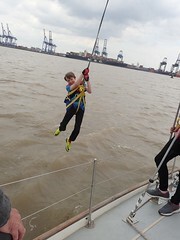 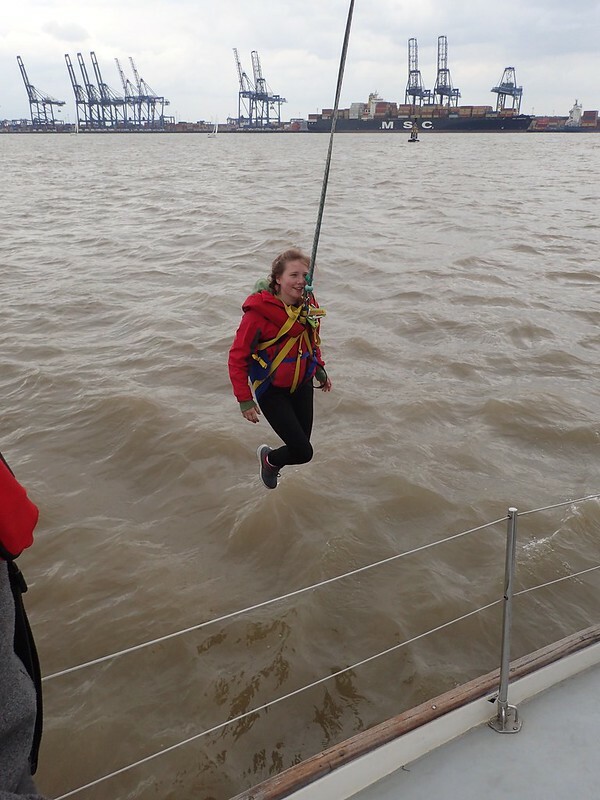 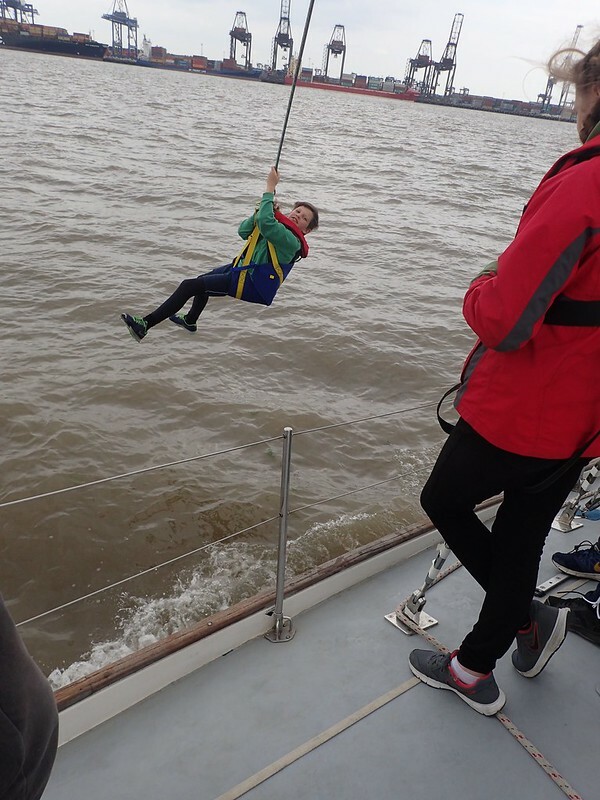 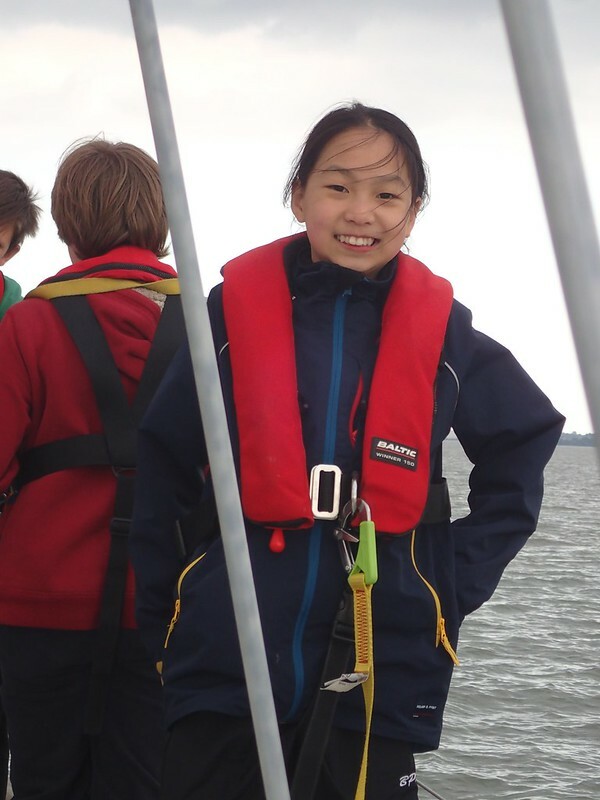 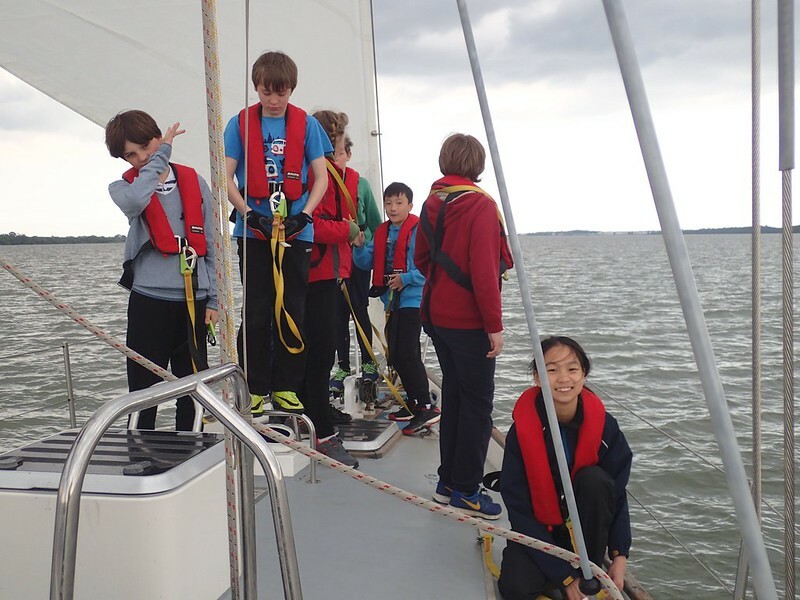 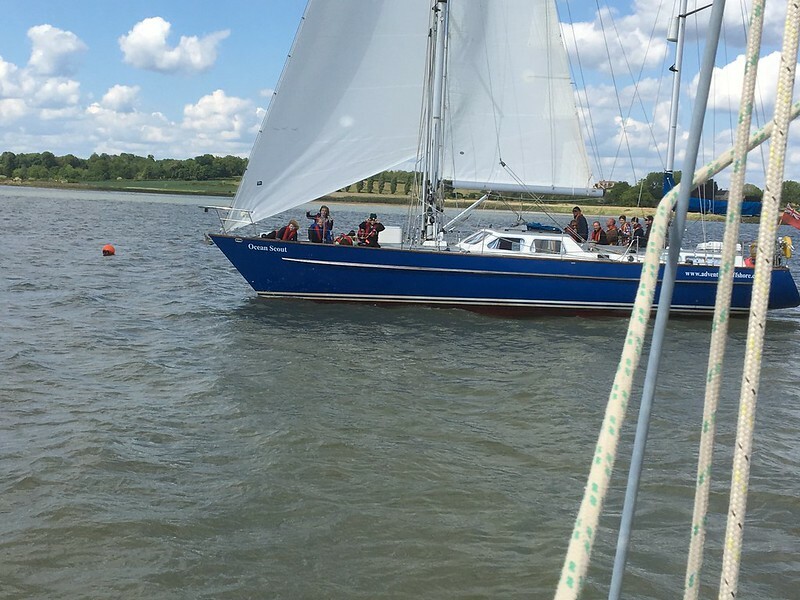 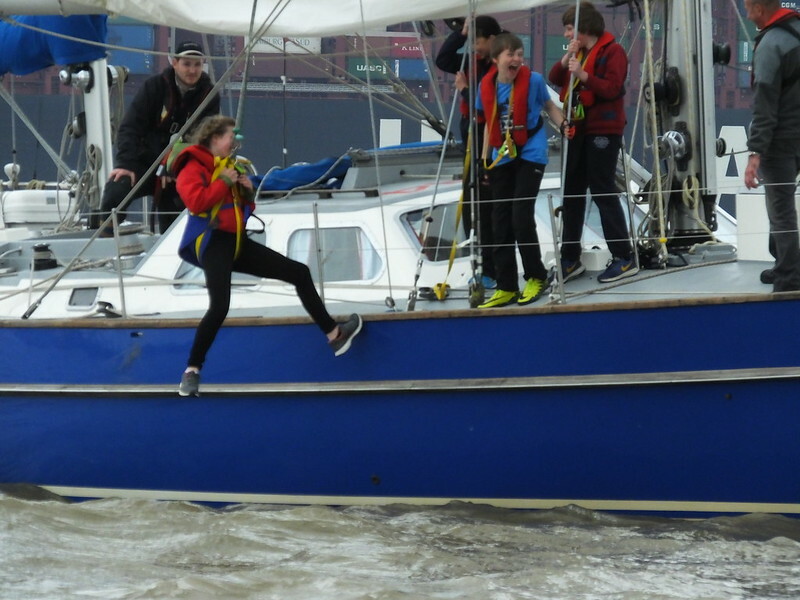 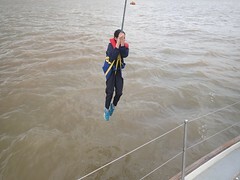 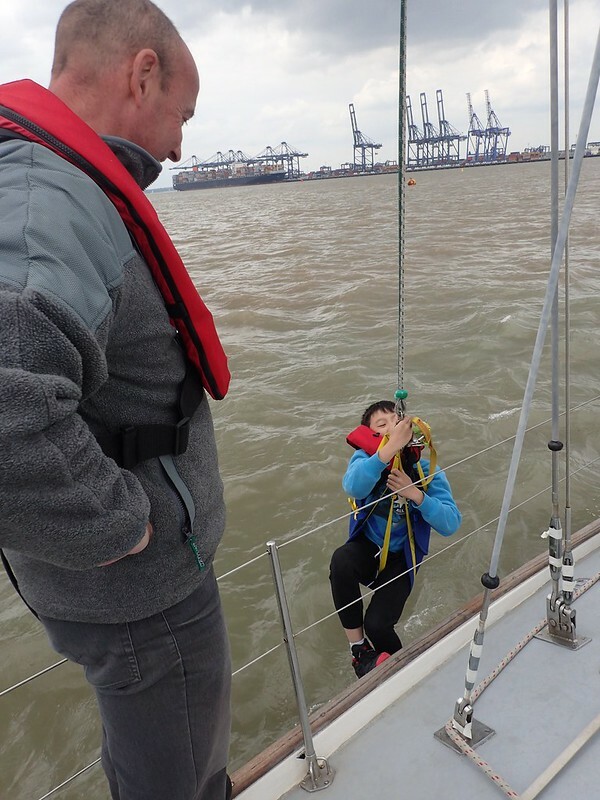 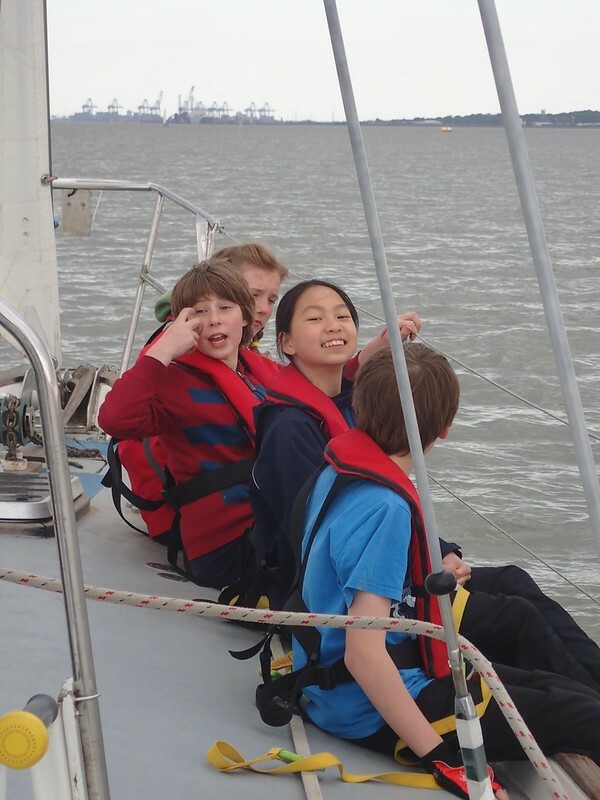 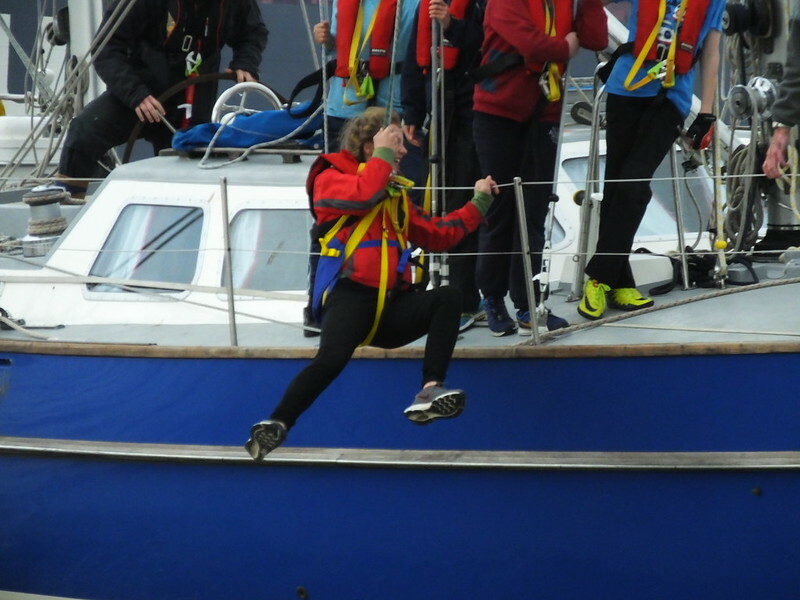 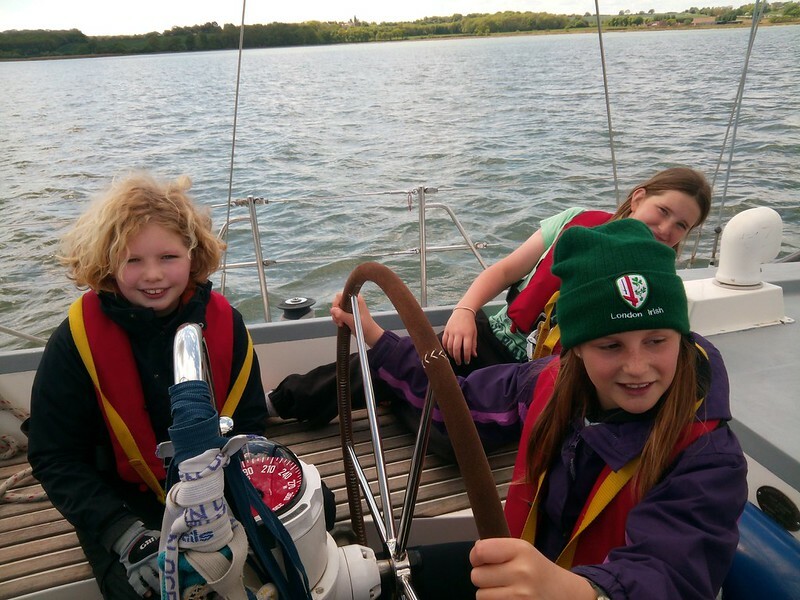 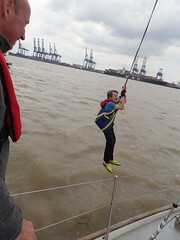 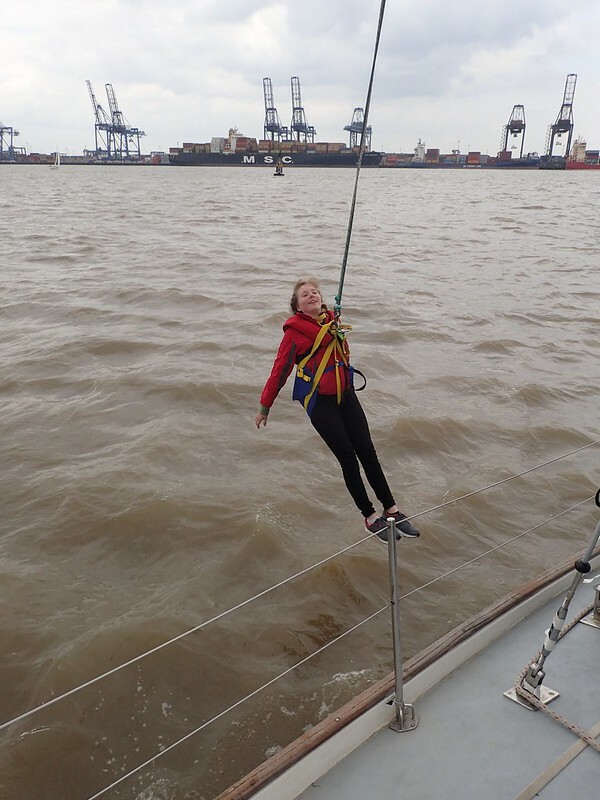 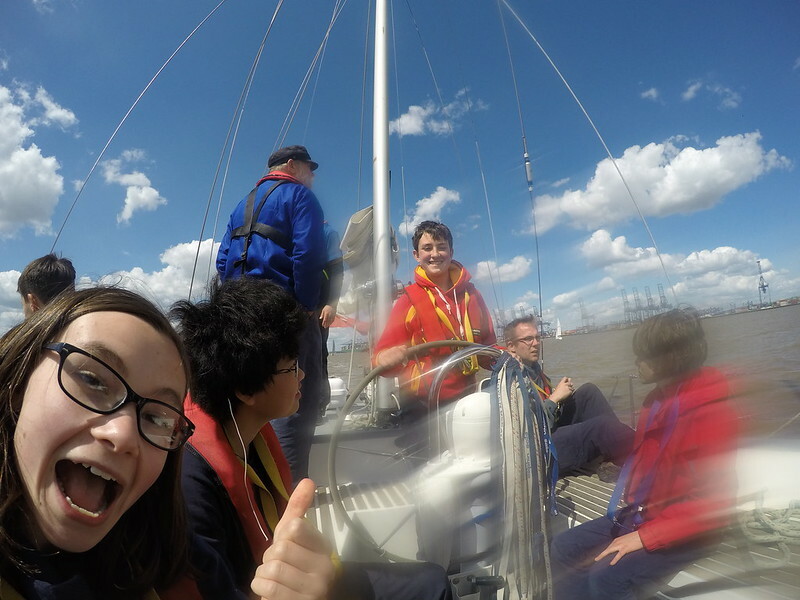 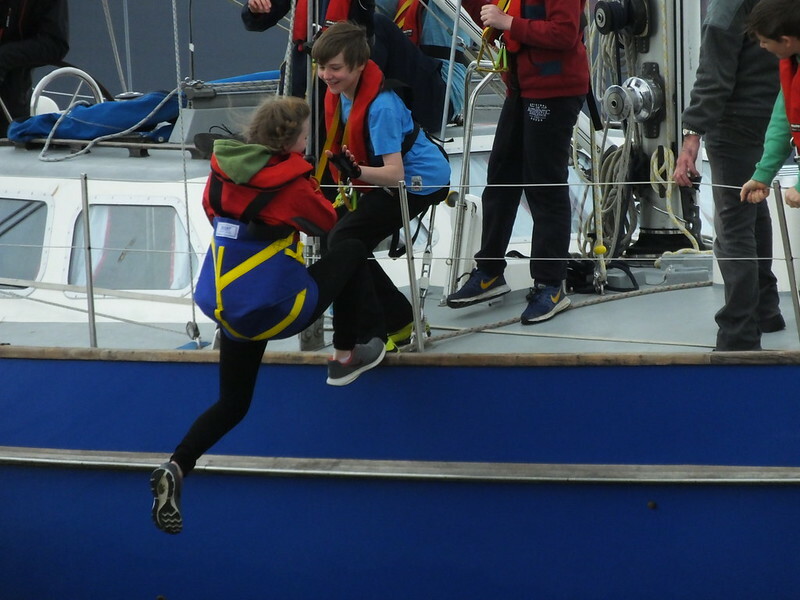 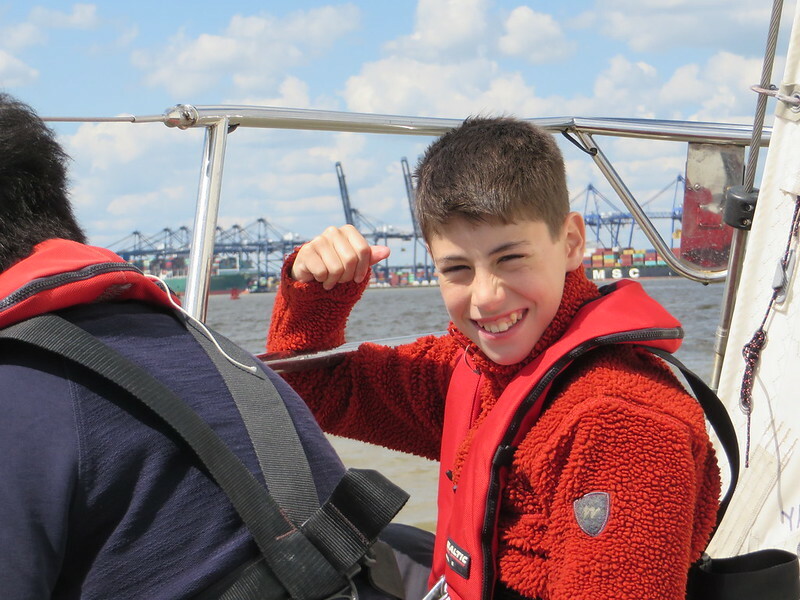 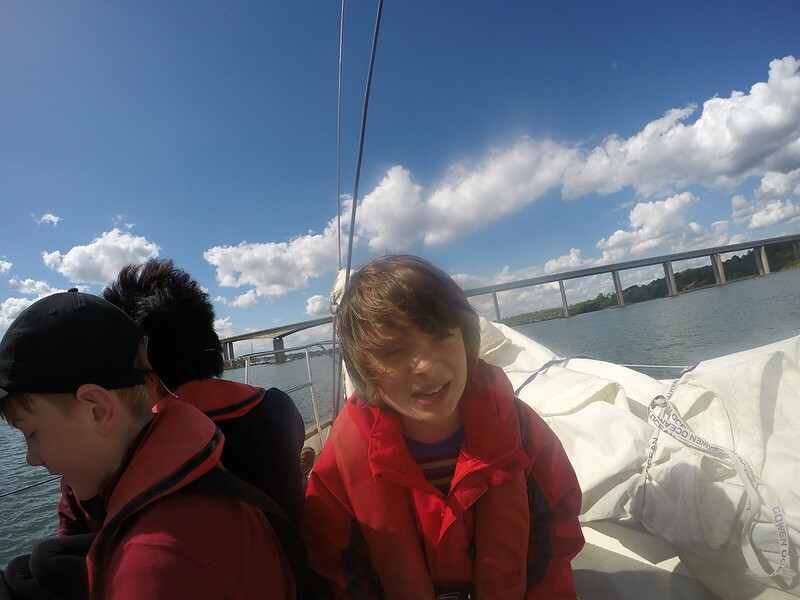 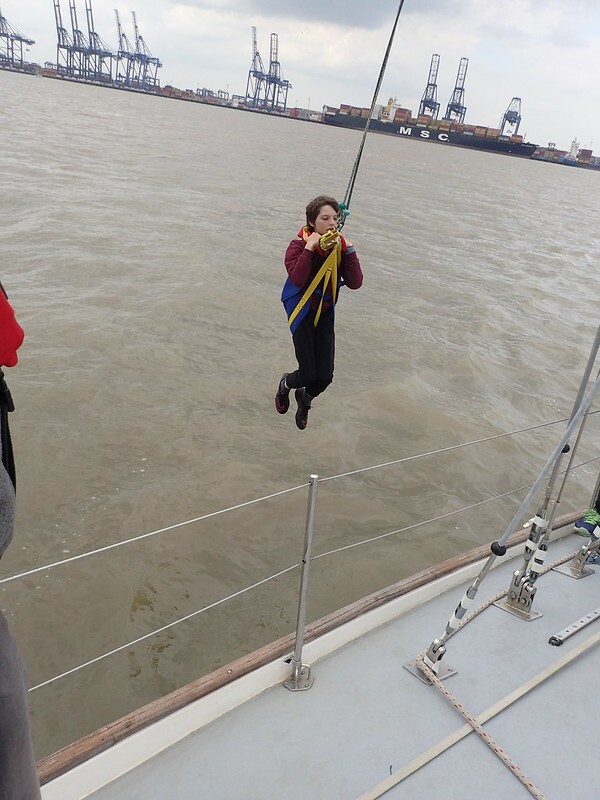 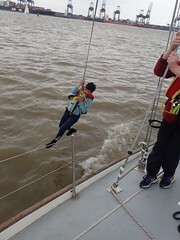 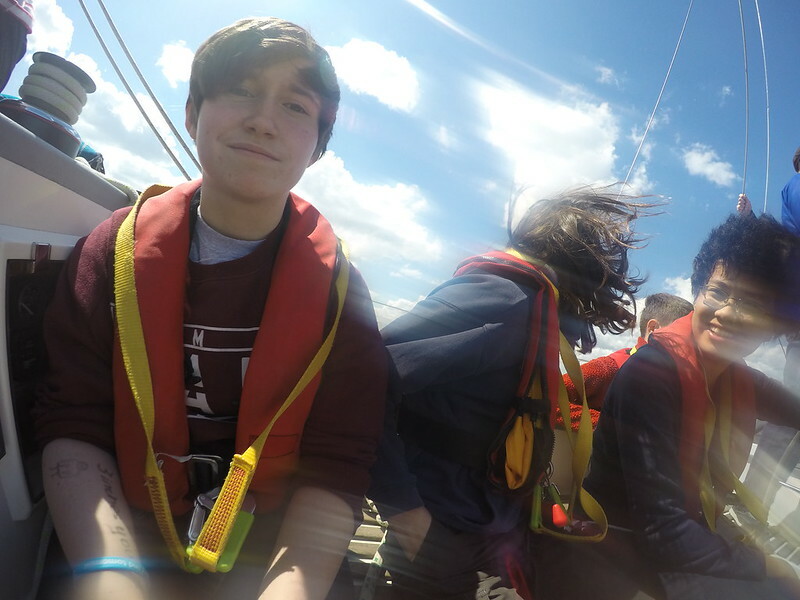 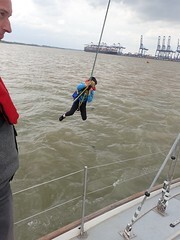 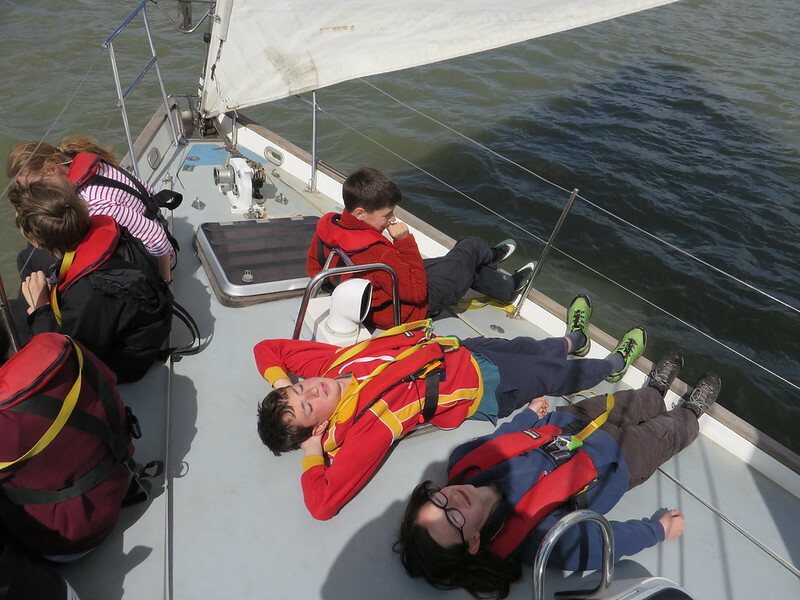 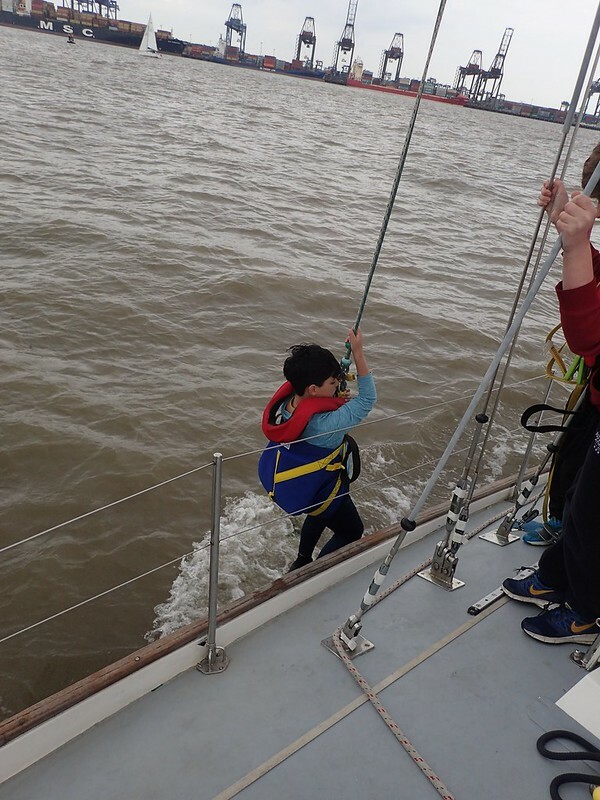 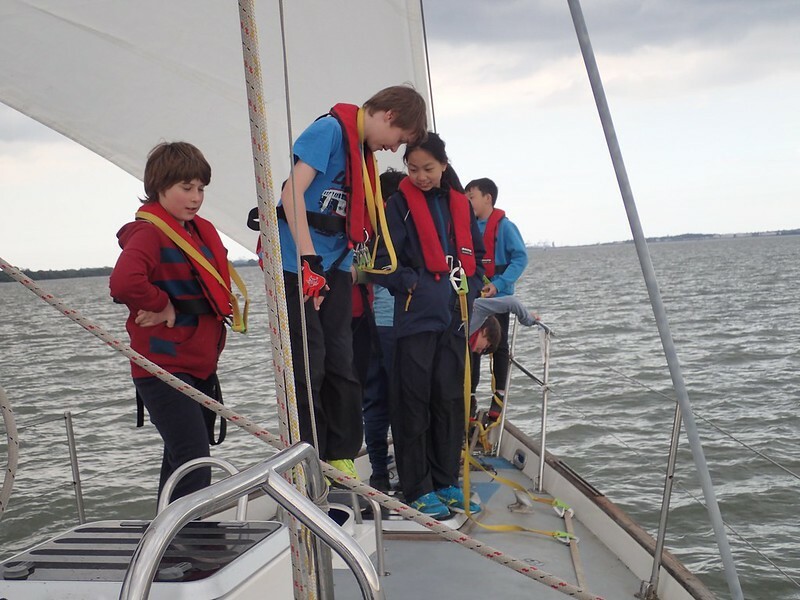 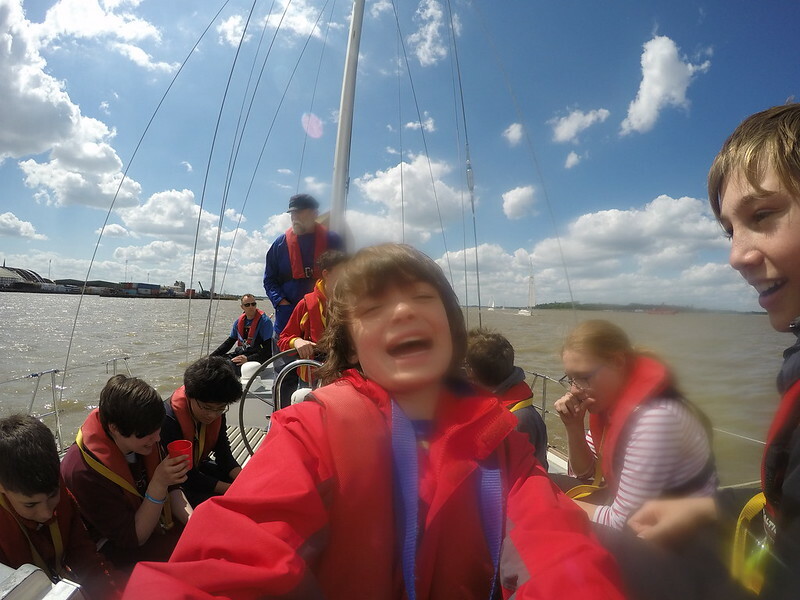 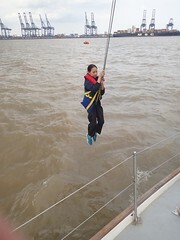 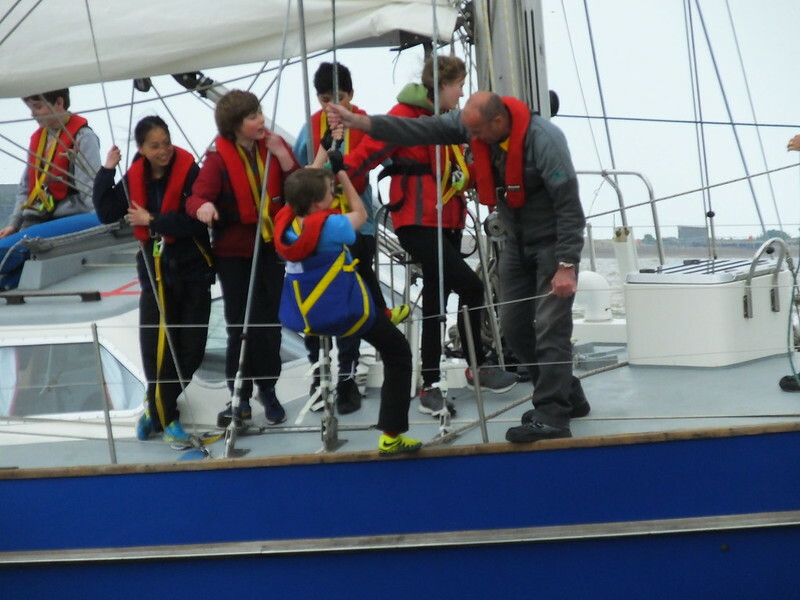 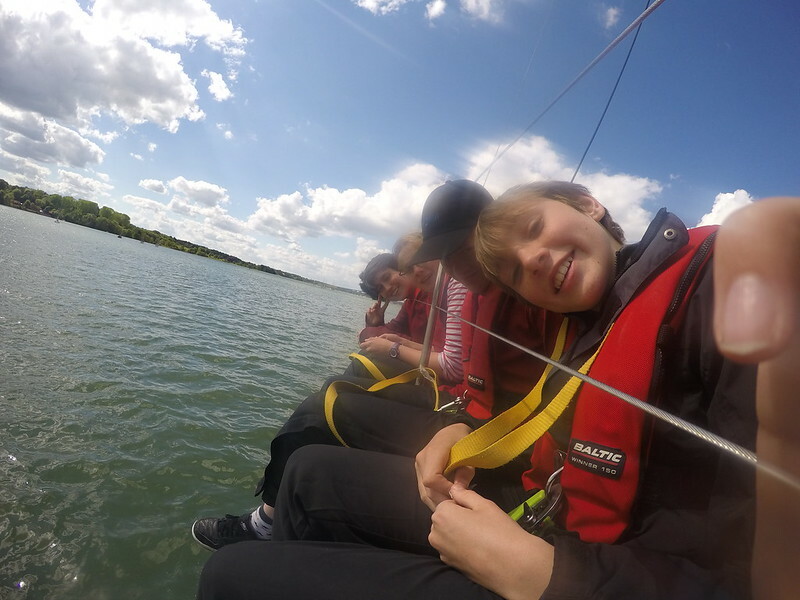 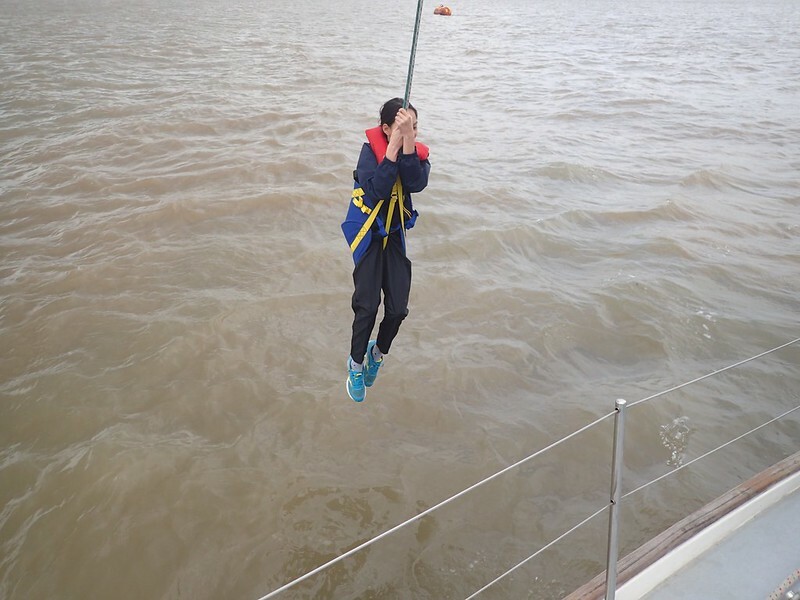 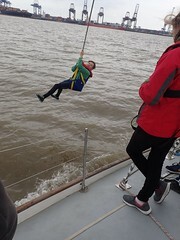 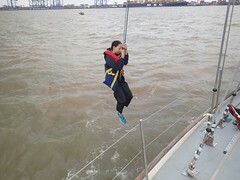 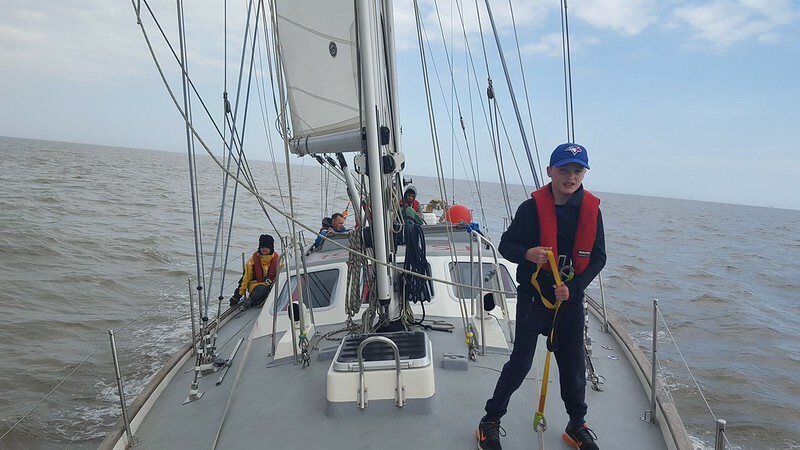 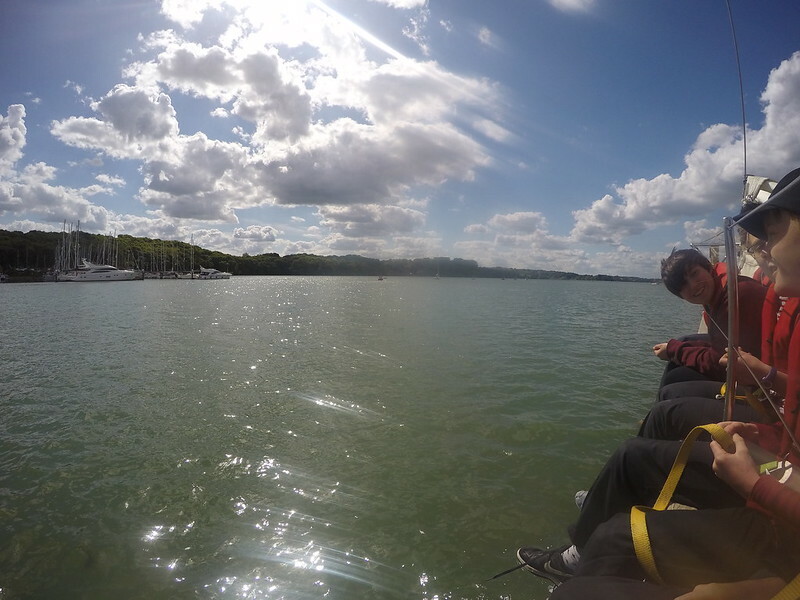 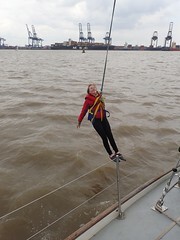 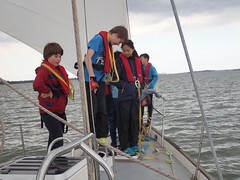 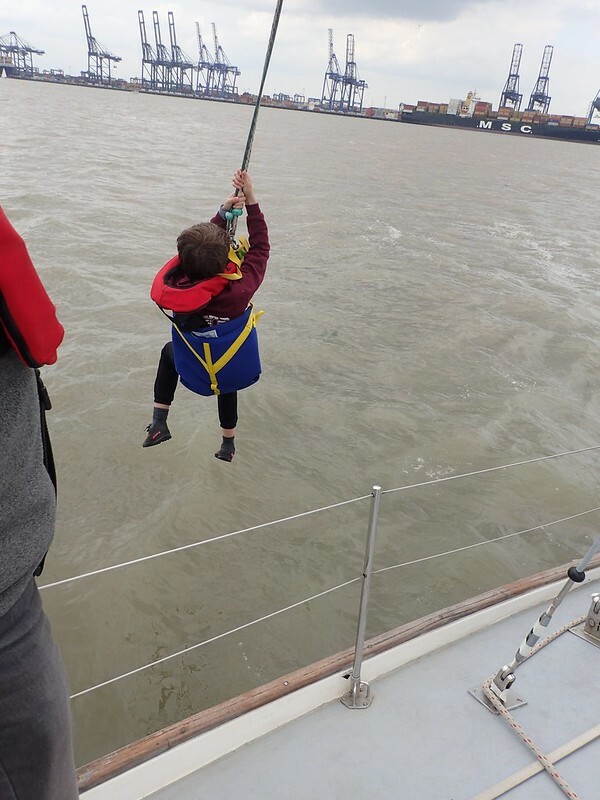 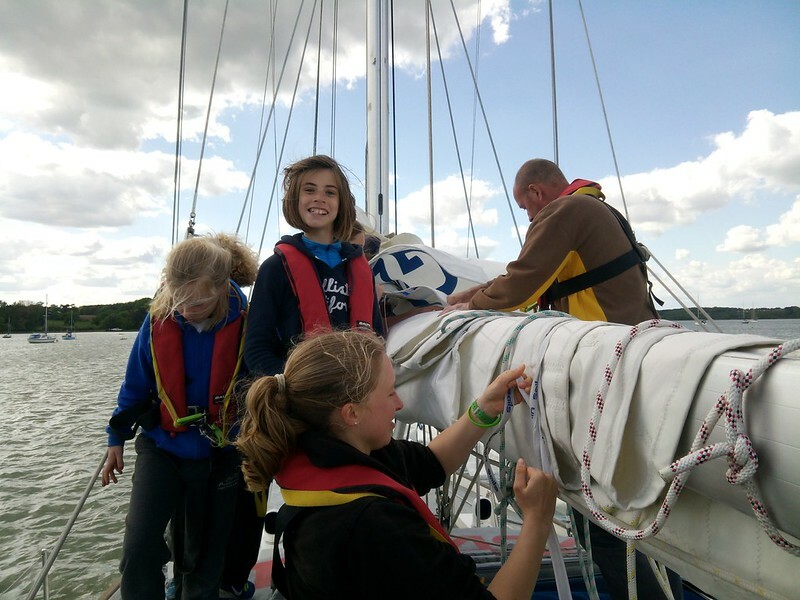 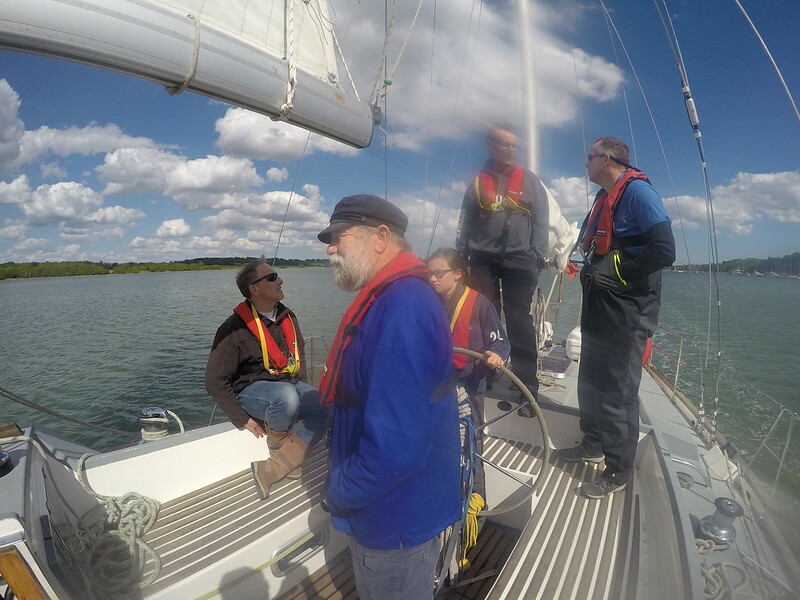 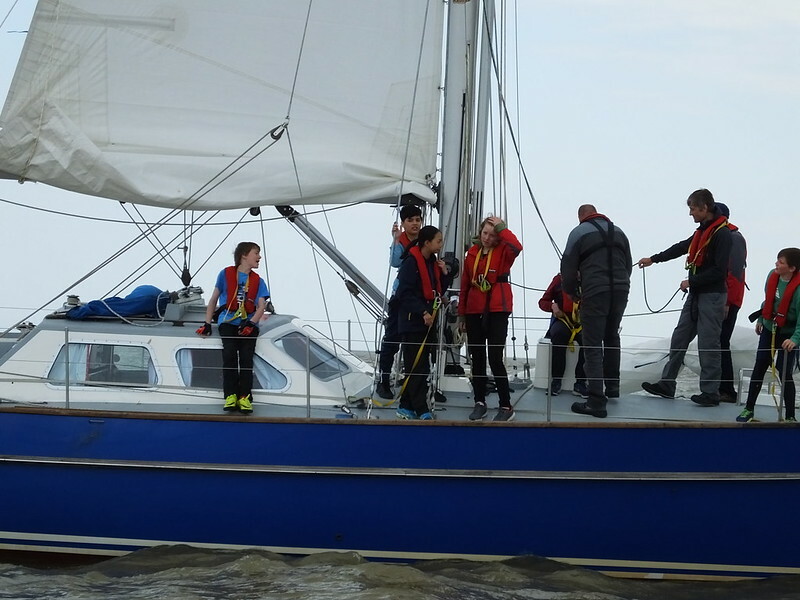 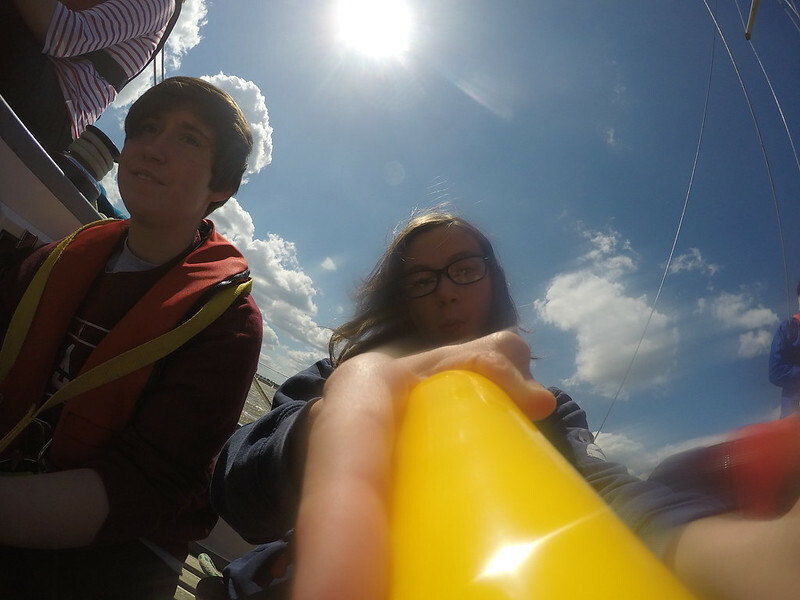 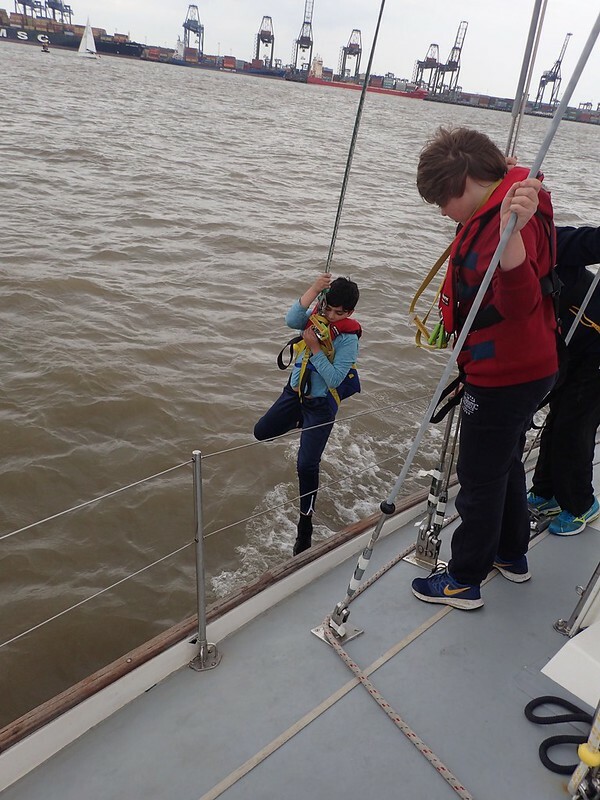 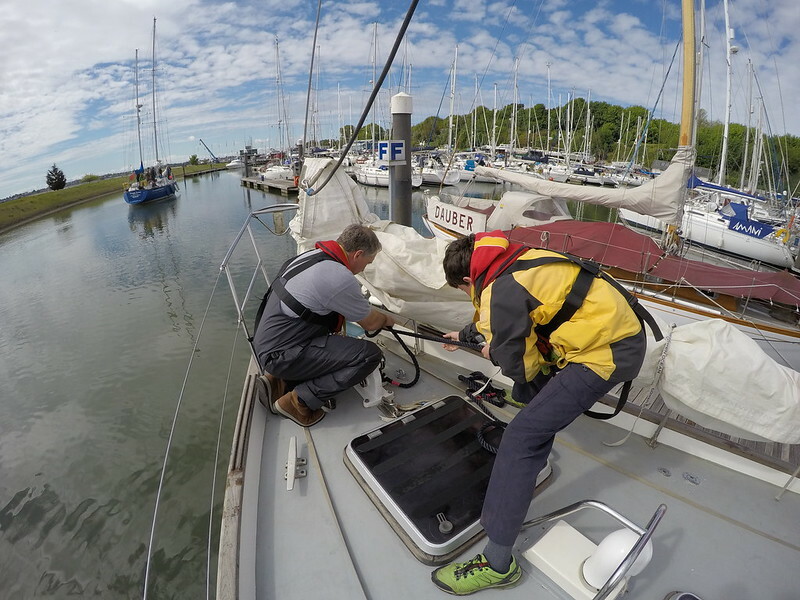 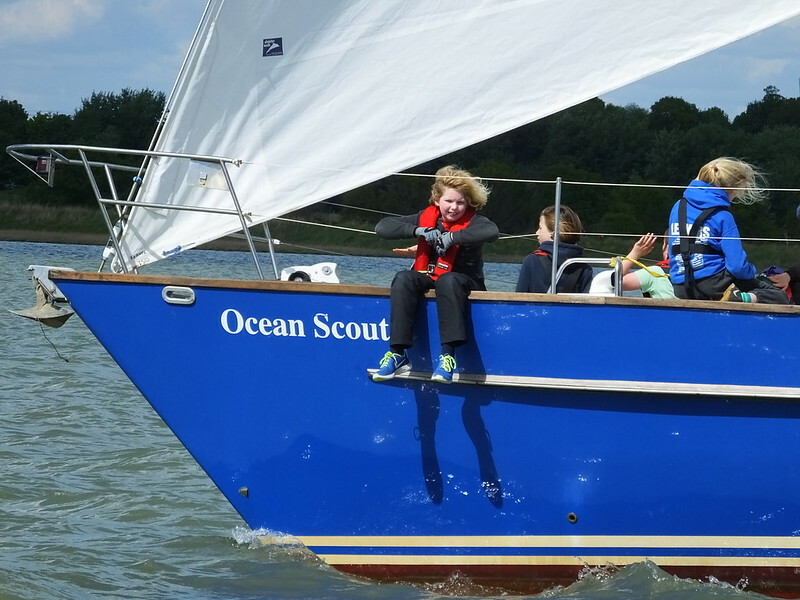 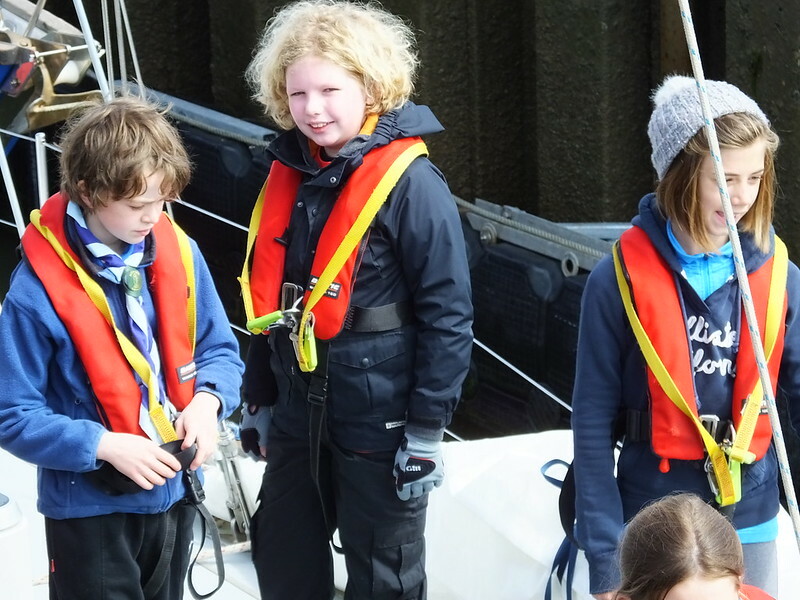 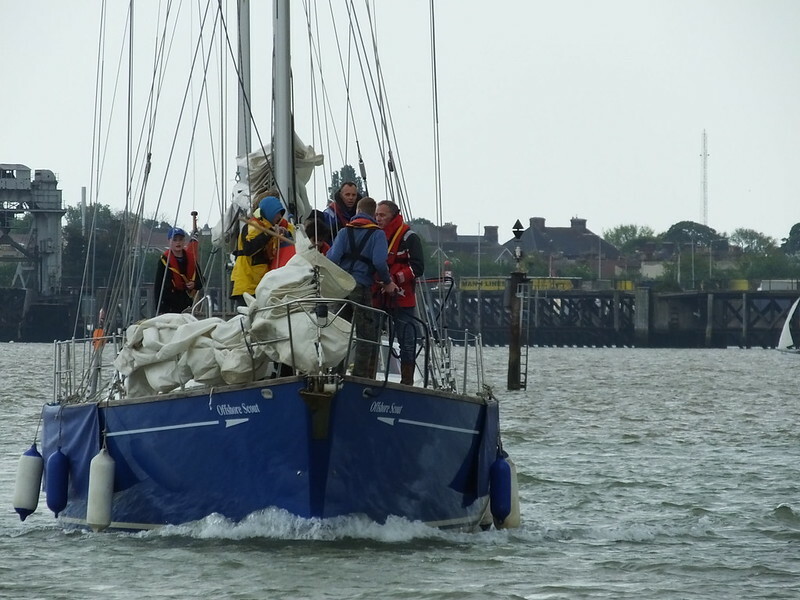 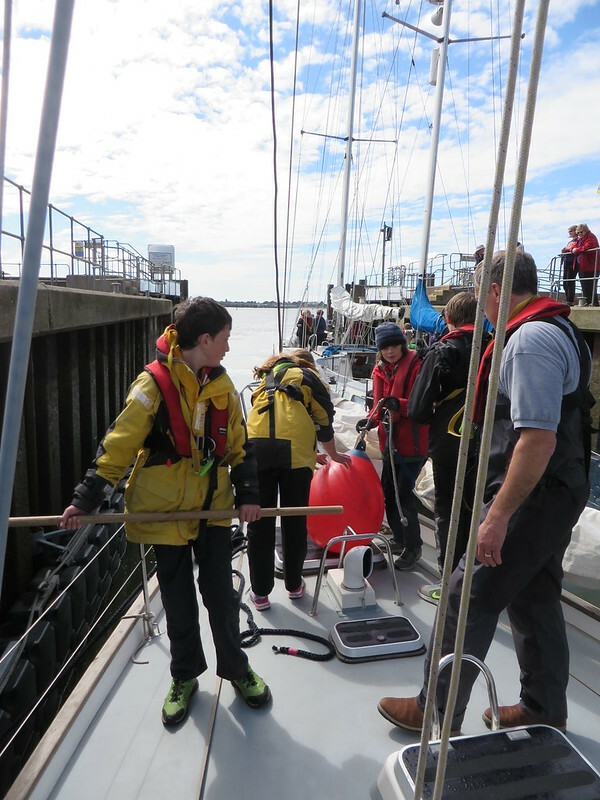 As the boats steered home towards Shotley Point Marina, there was still time for some play – hanging from the halyards over the water always puts smiles on faces! 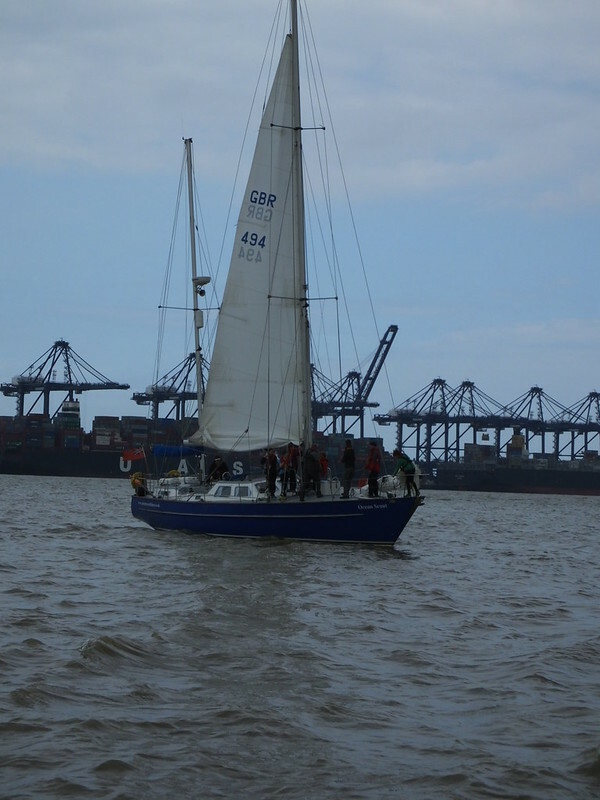 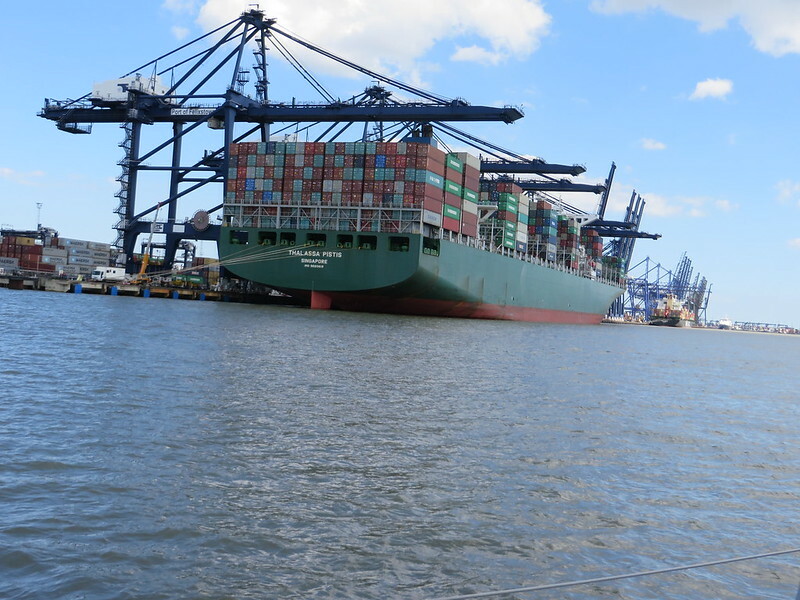 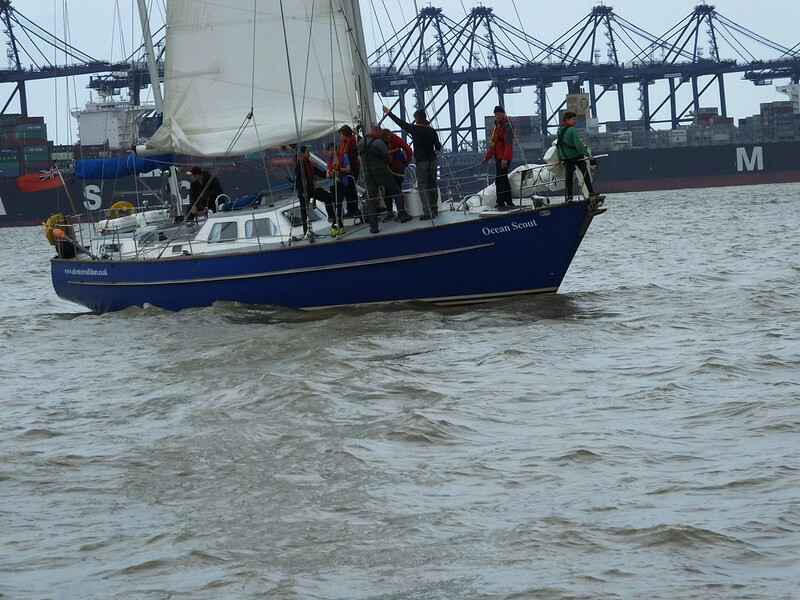 Sunday saw a fresh pair of crews arrive at Shotley. 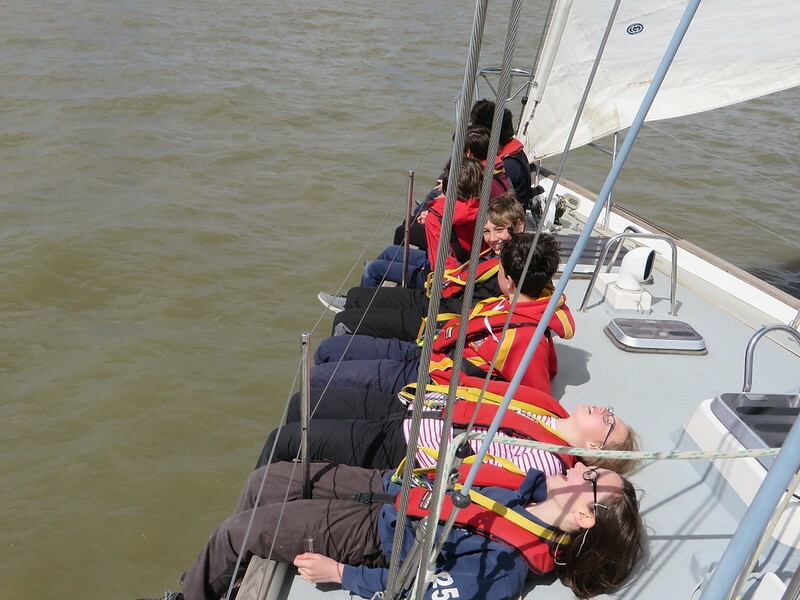 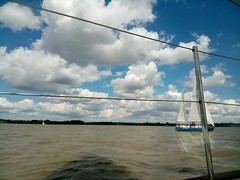 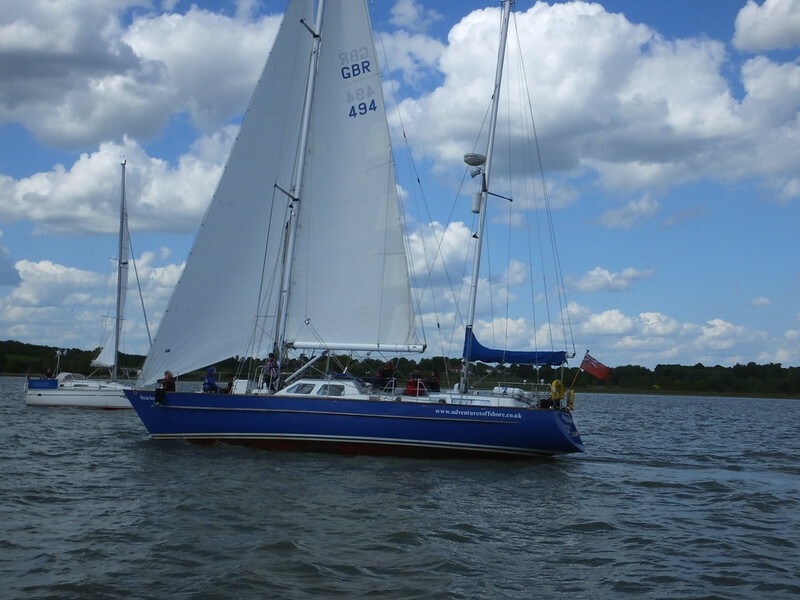 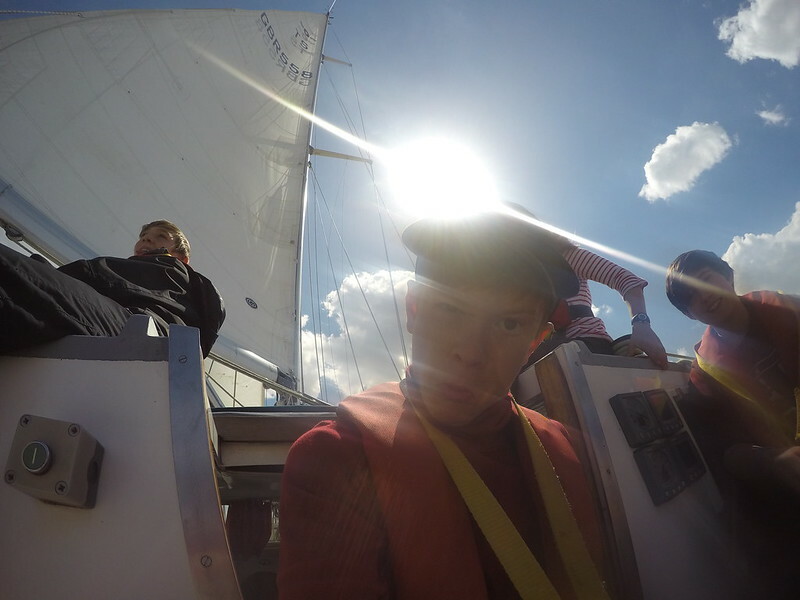 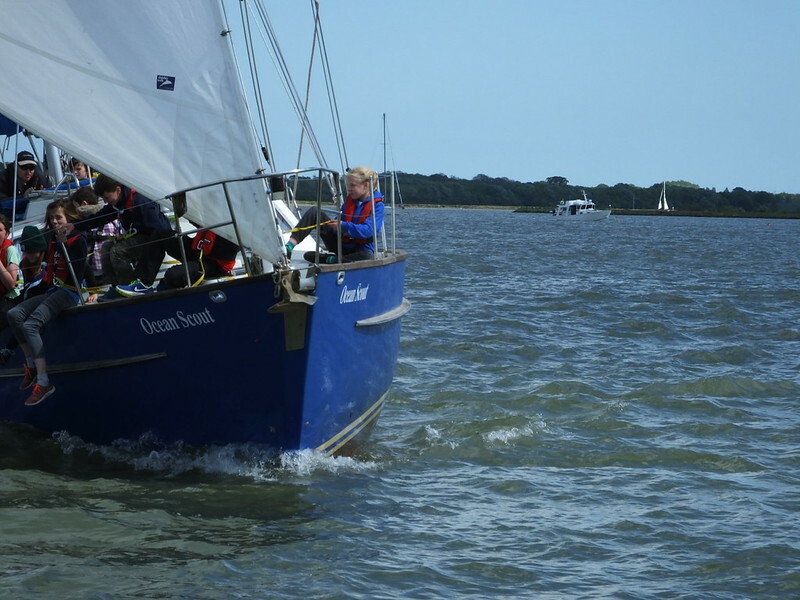 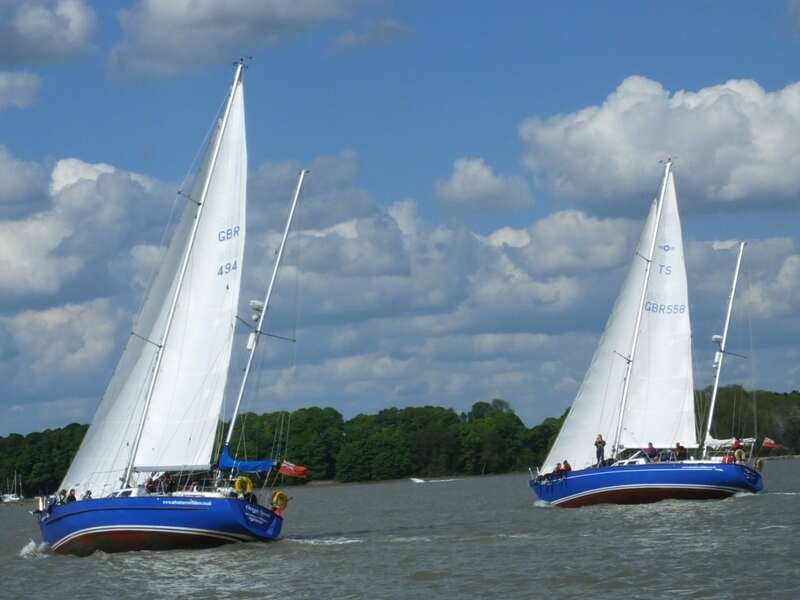 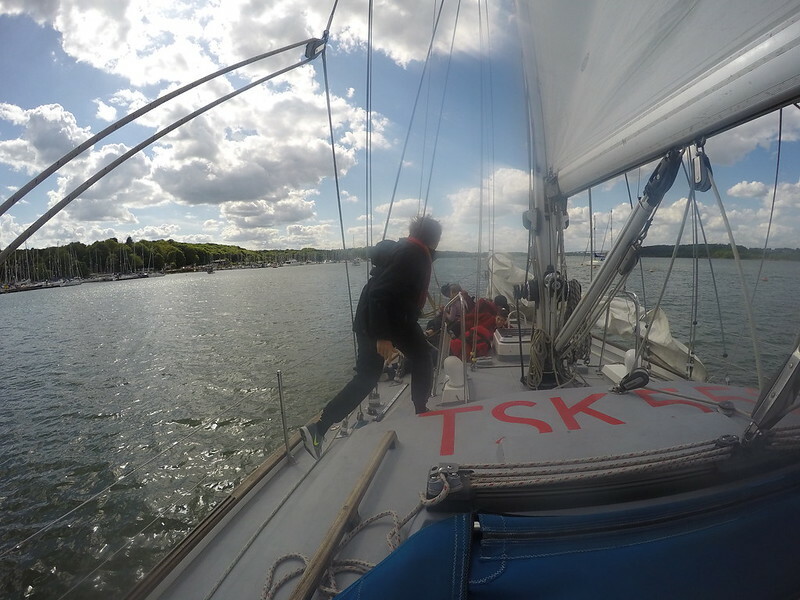 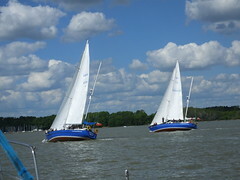 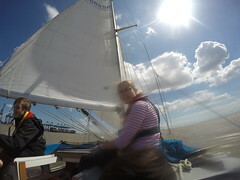 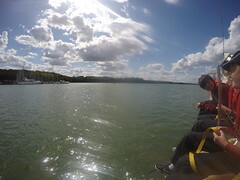 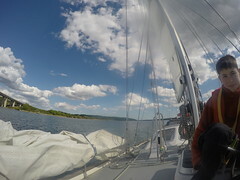 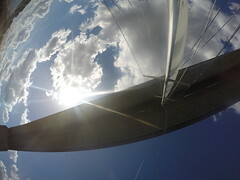 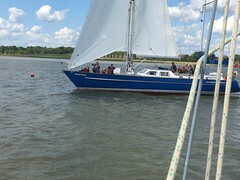 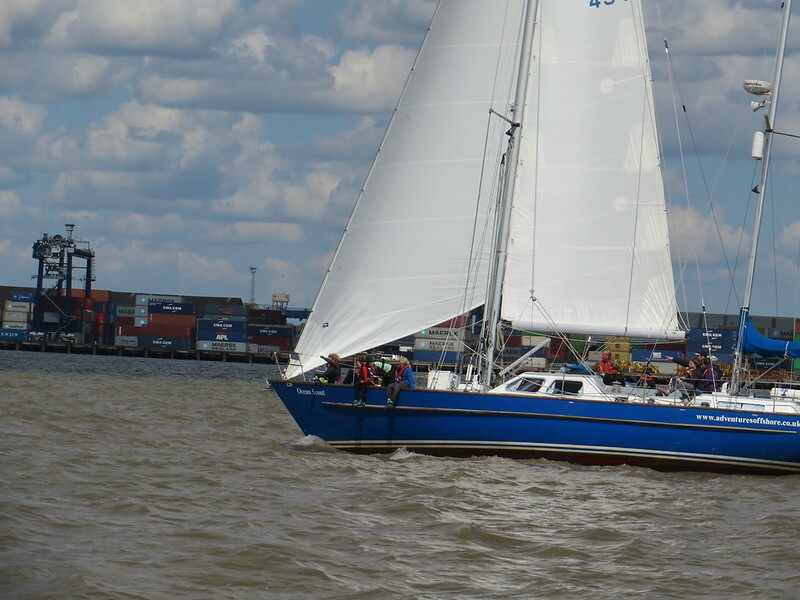 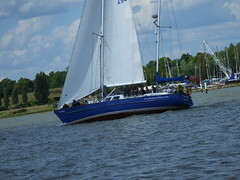 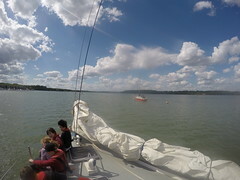 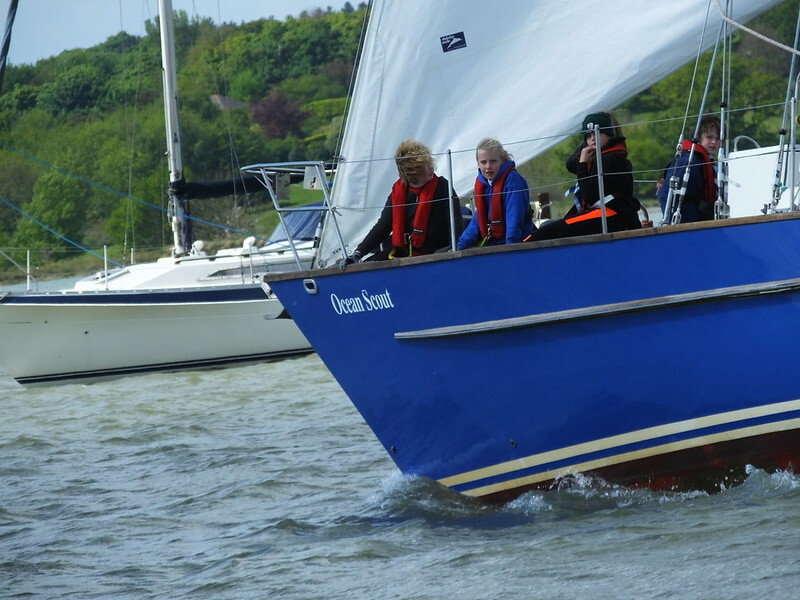 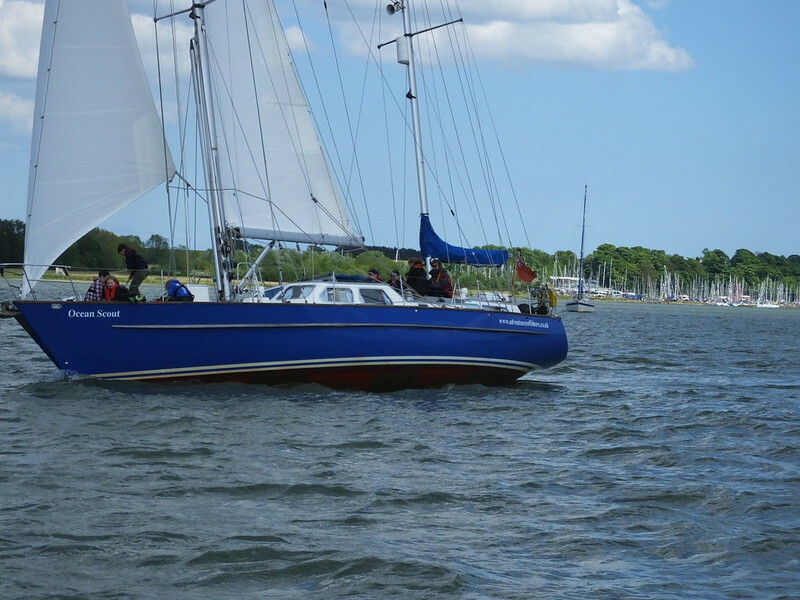 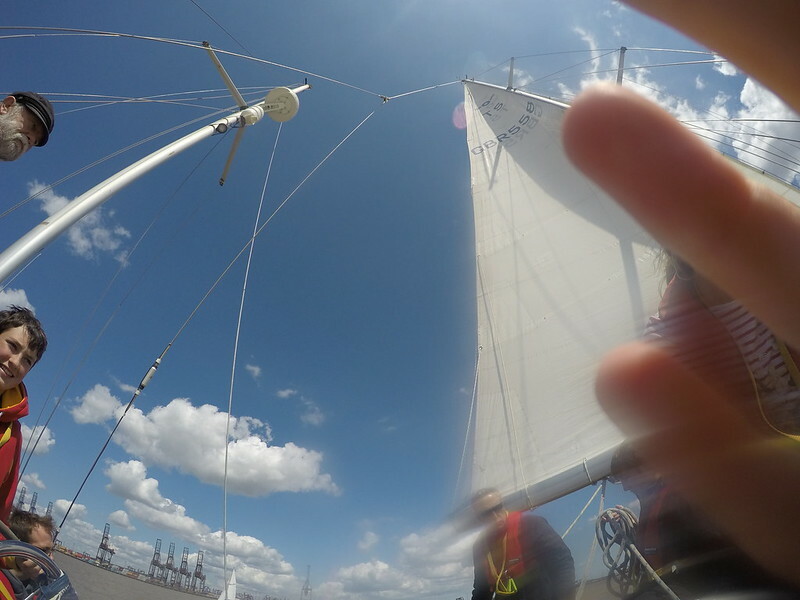 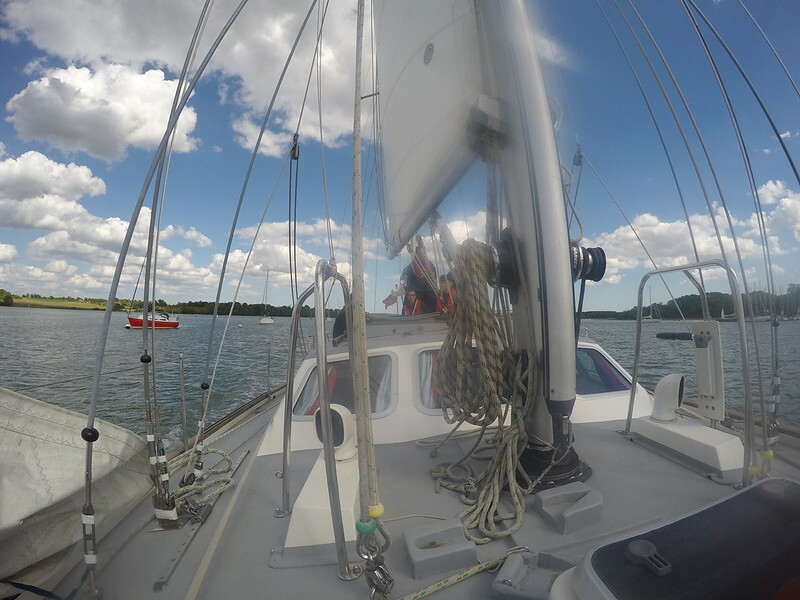 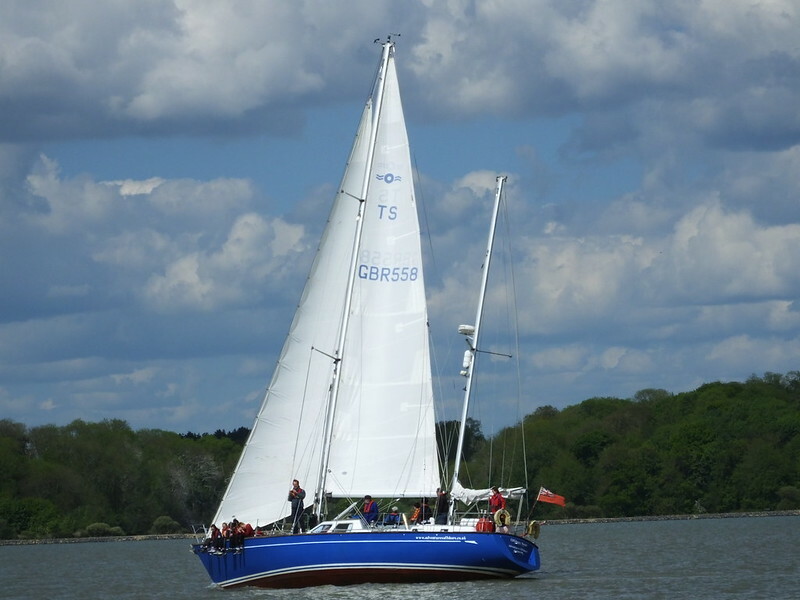 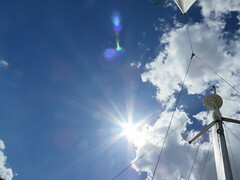 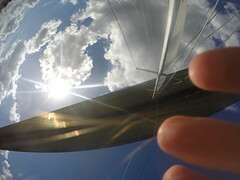 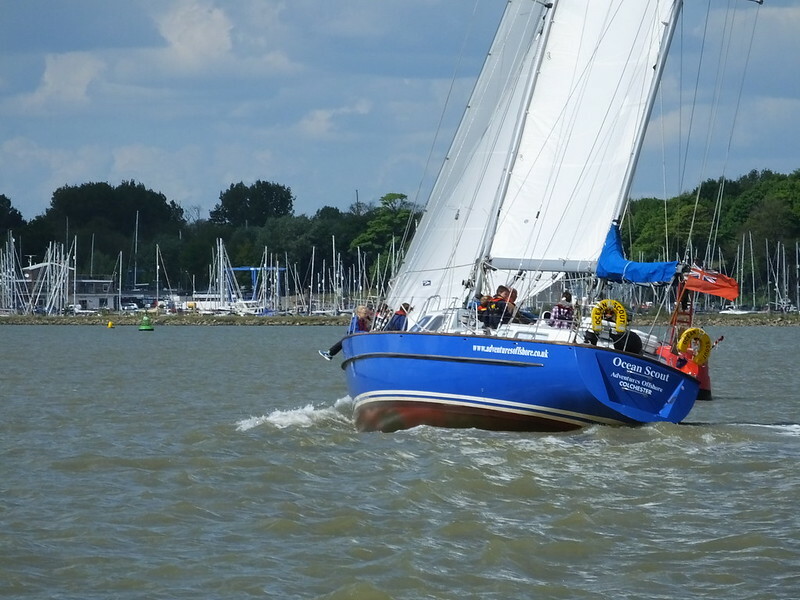 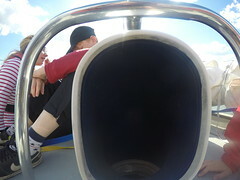 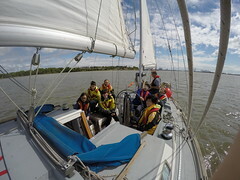 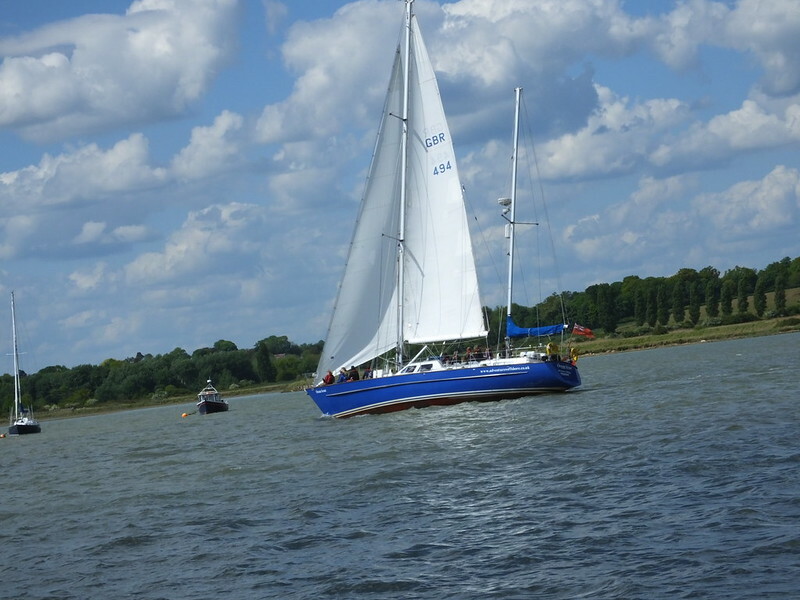 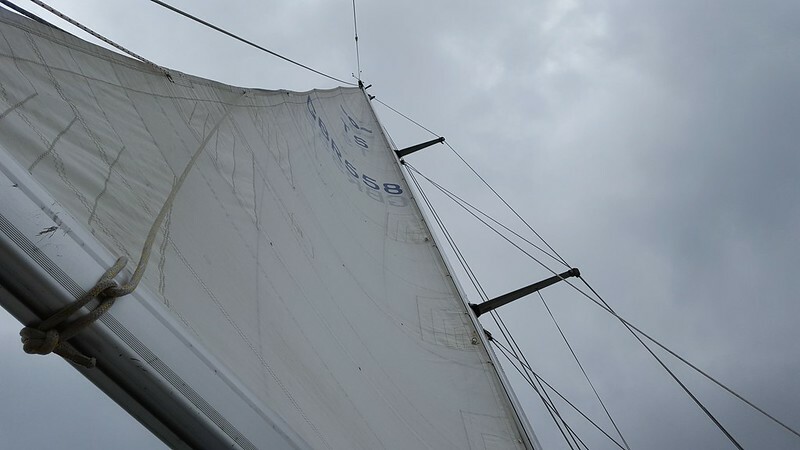 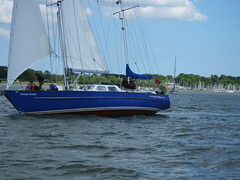 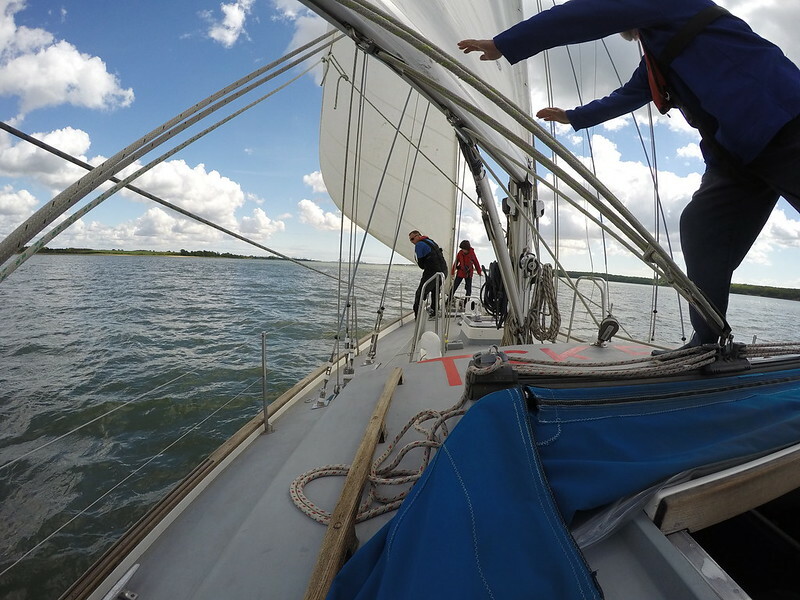 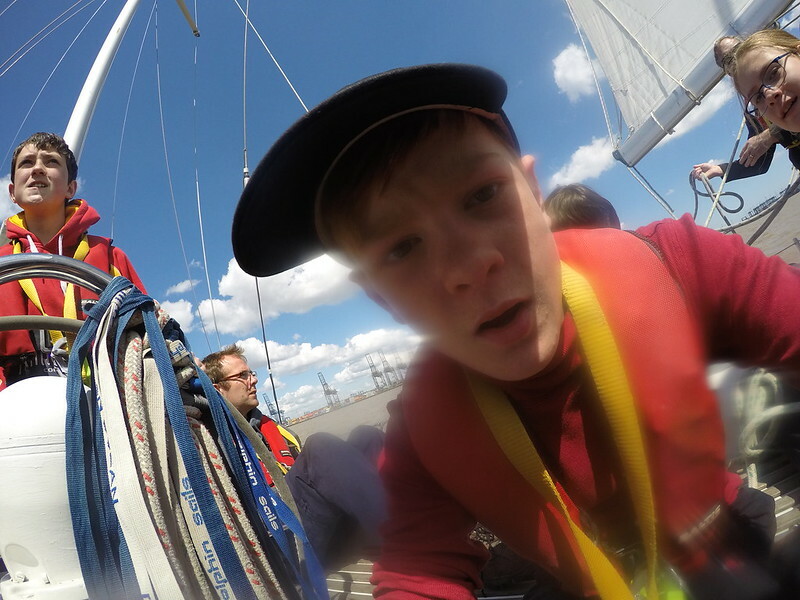 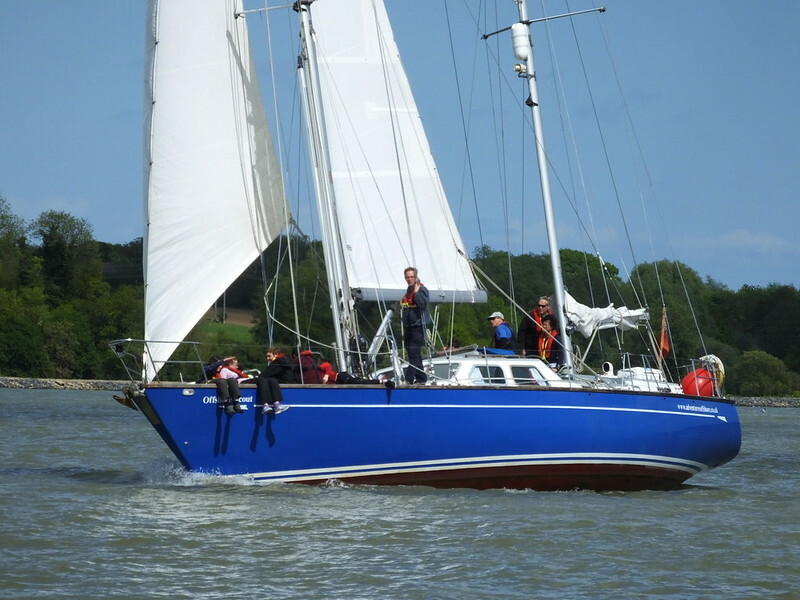 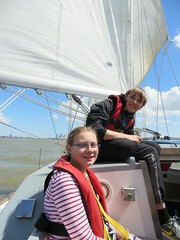 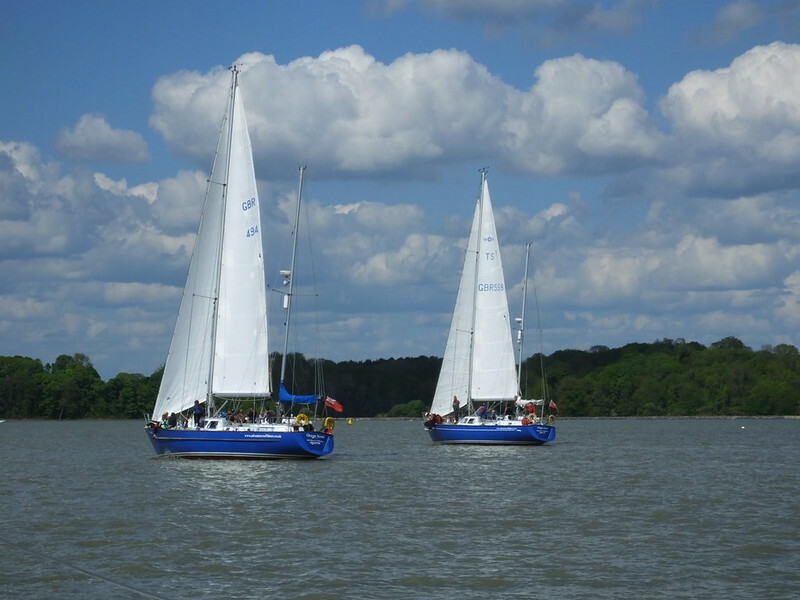 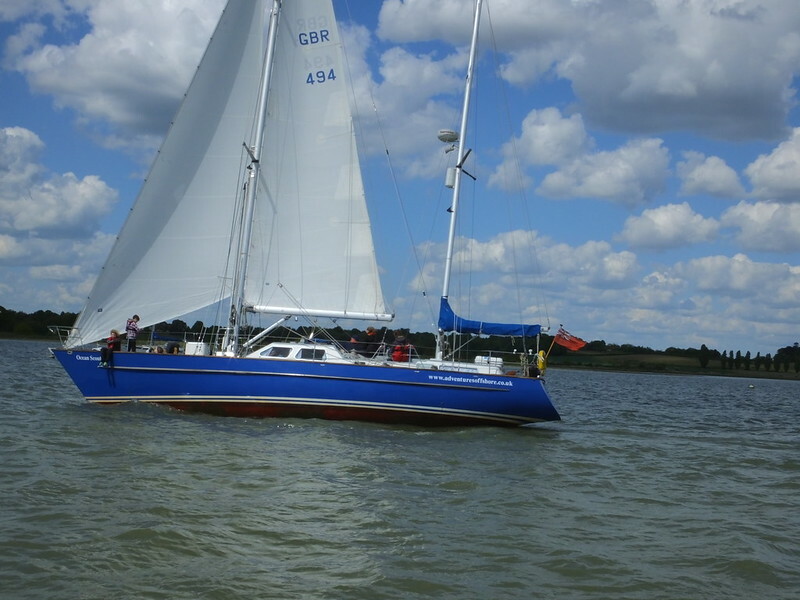 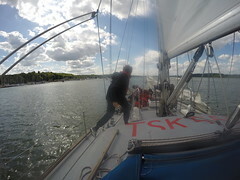 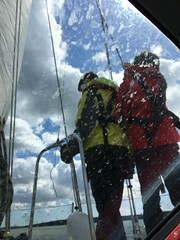 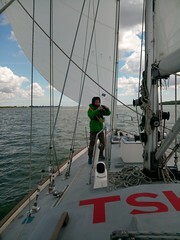 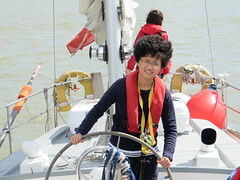 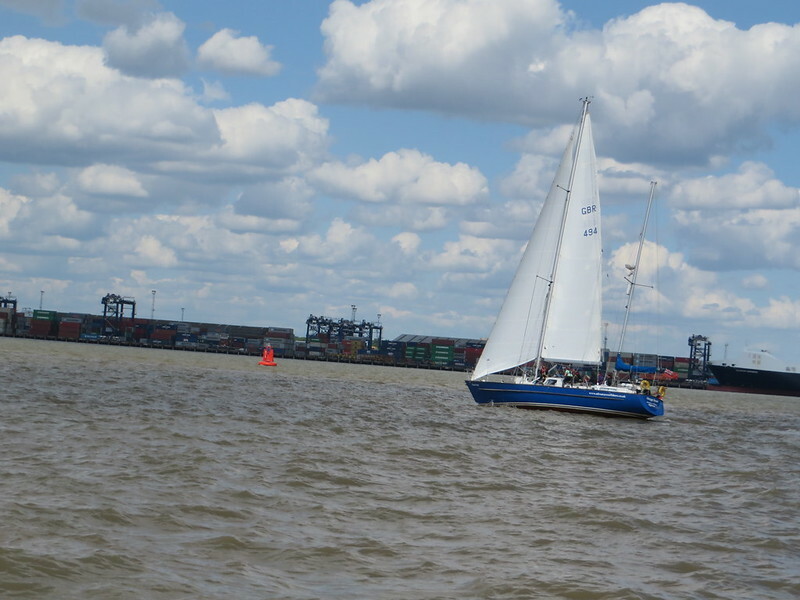 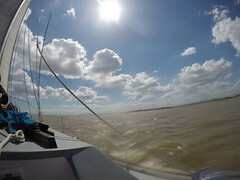 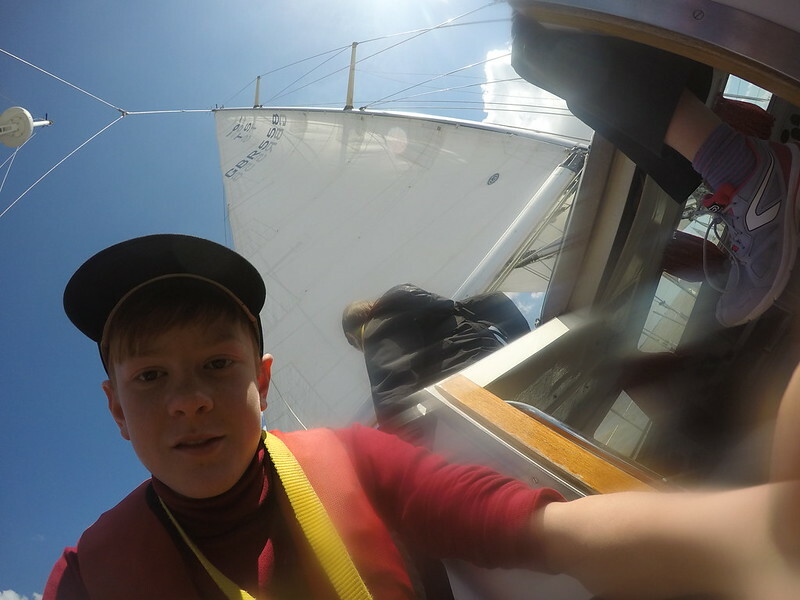 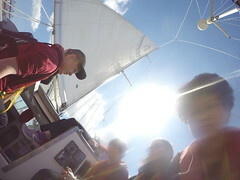 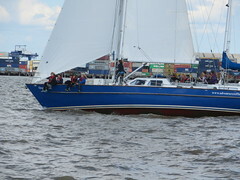 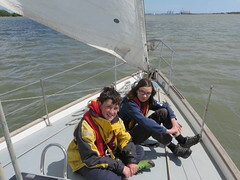 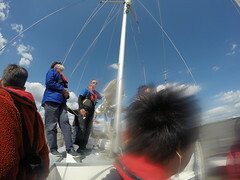 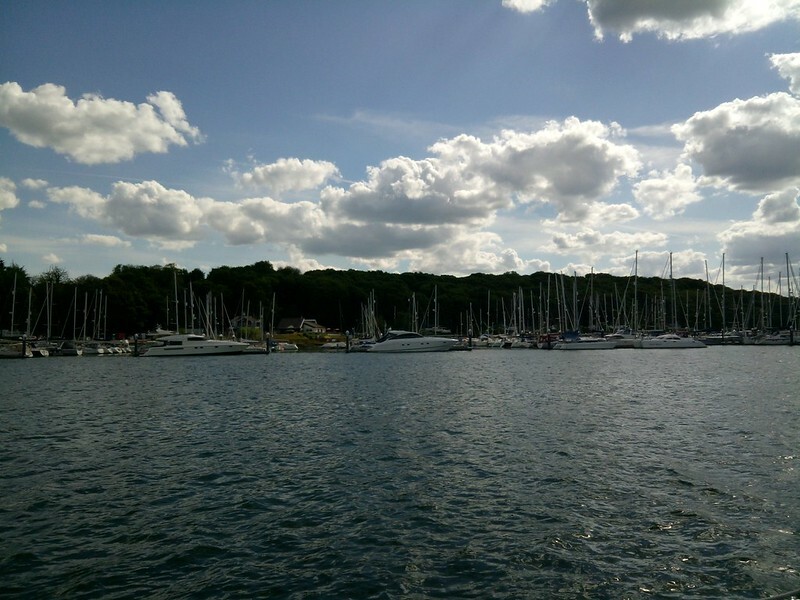 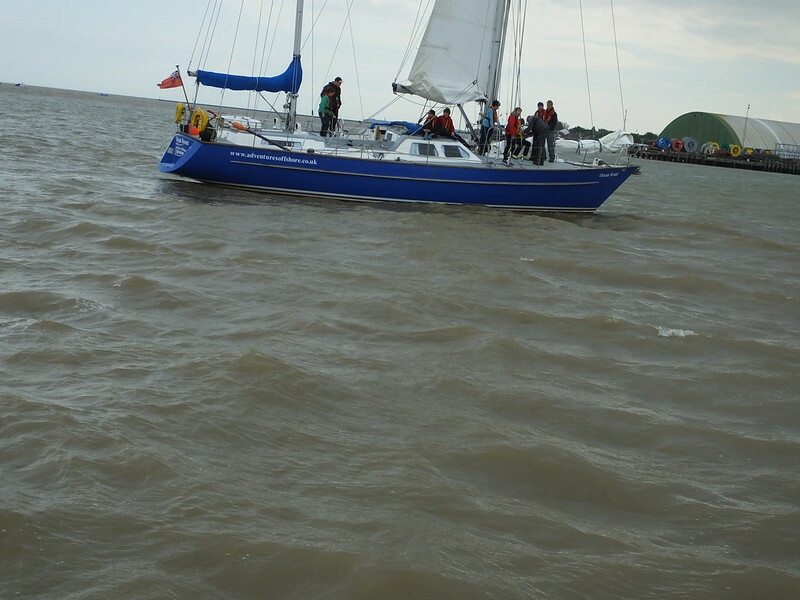 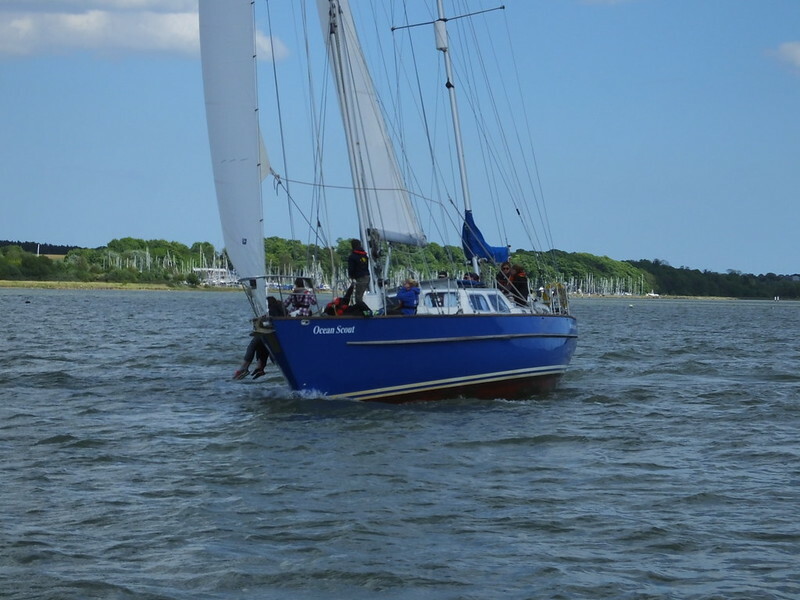 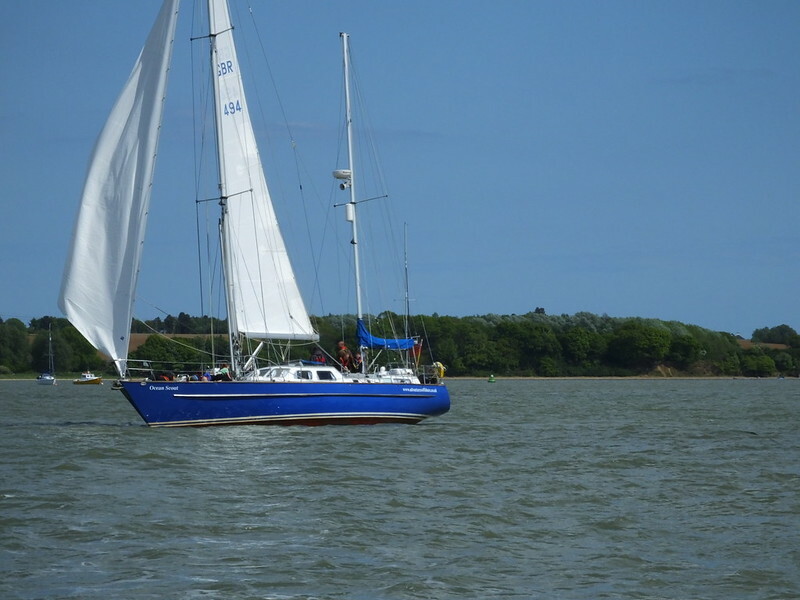 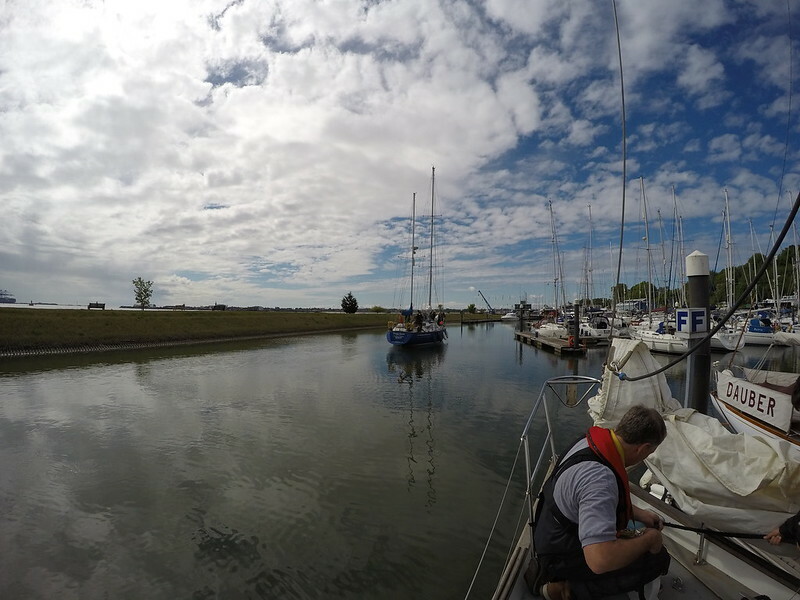 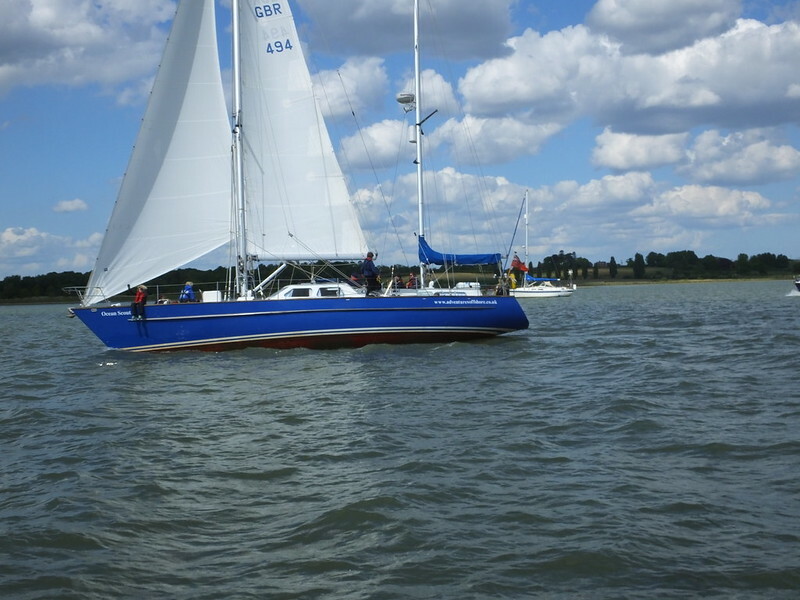 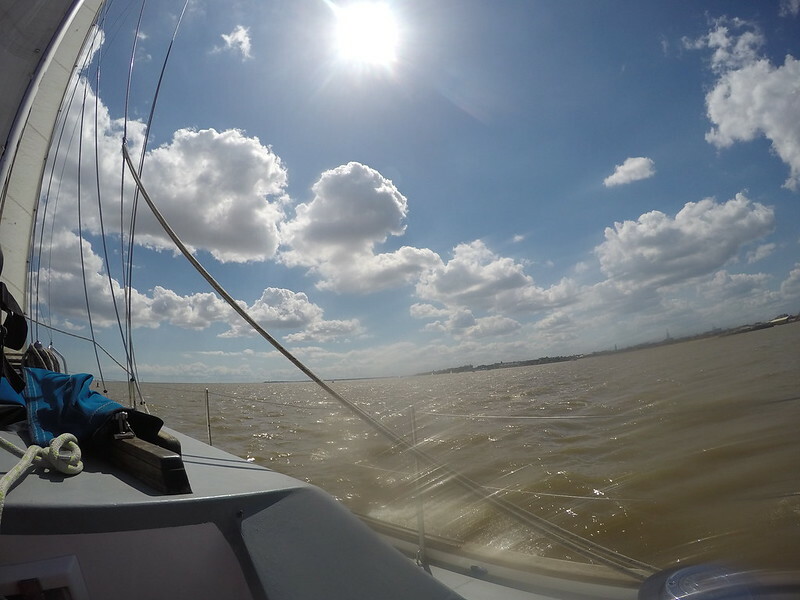 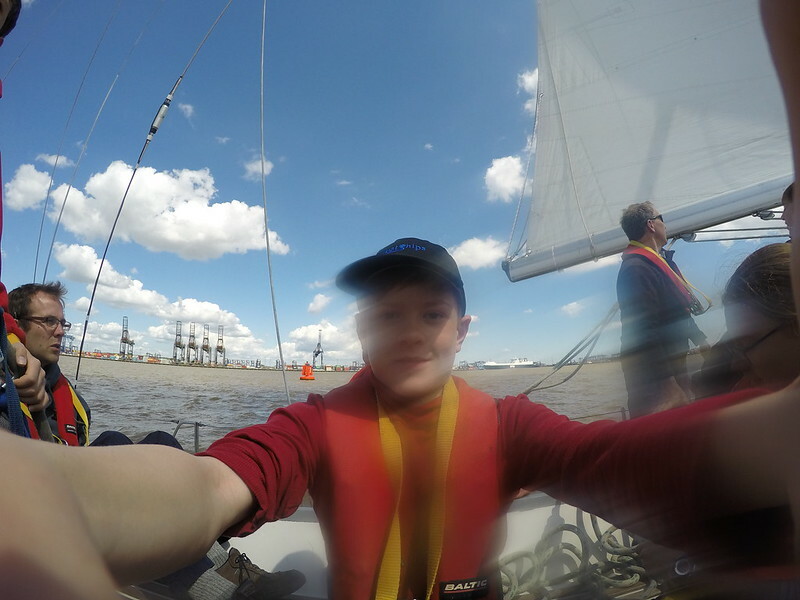 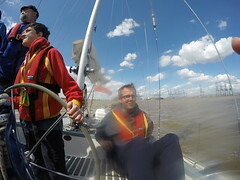 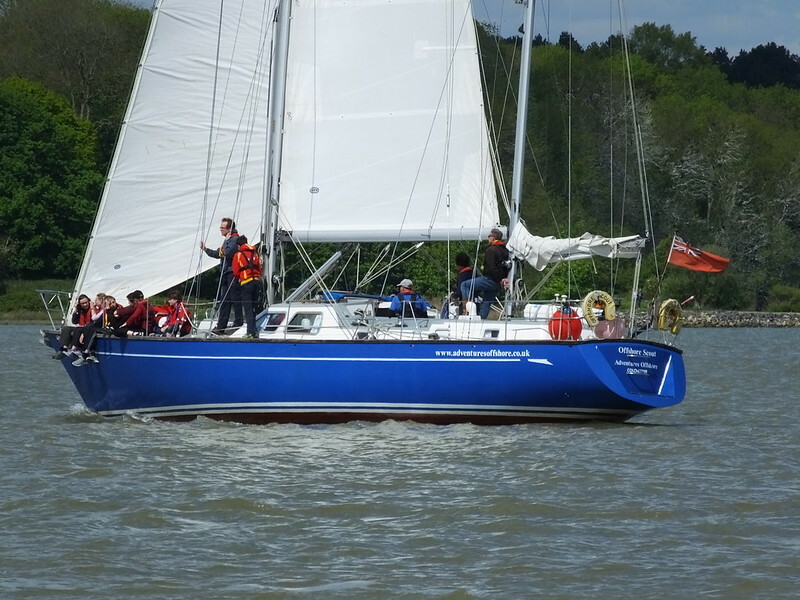 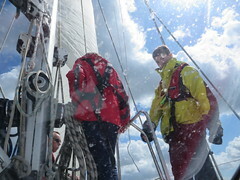 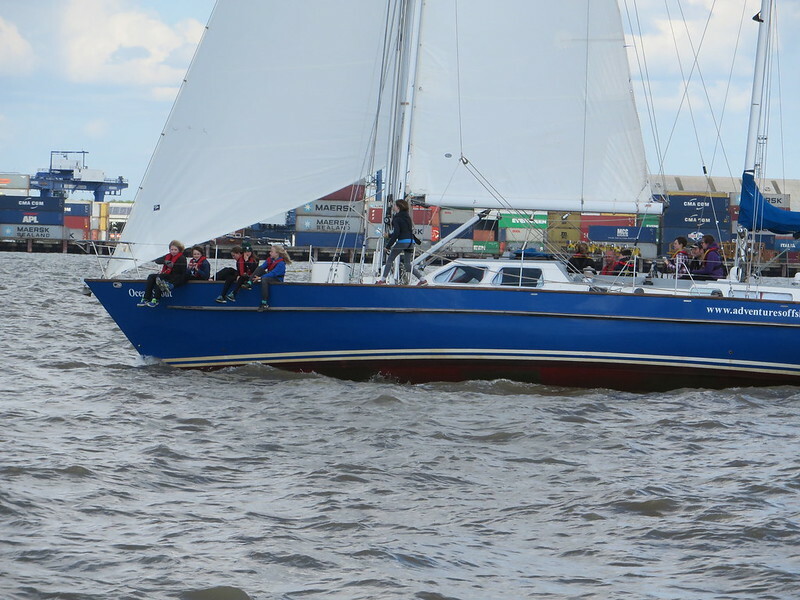 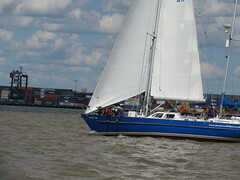 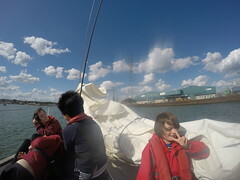 Perfect sailing conditions were provided – plenty of sunshine and a Force 3-4 breeze. 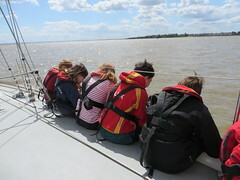 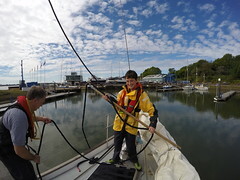 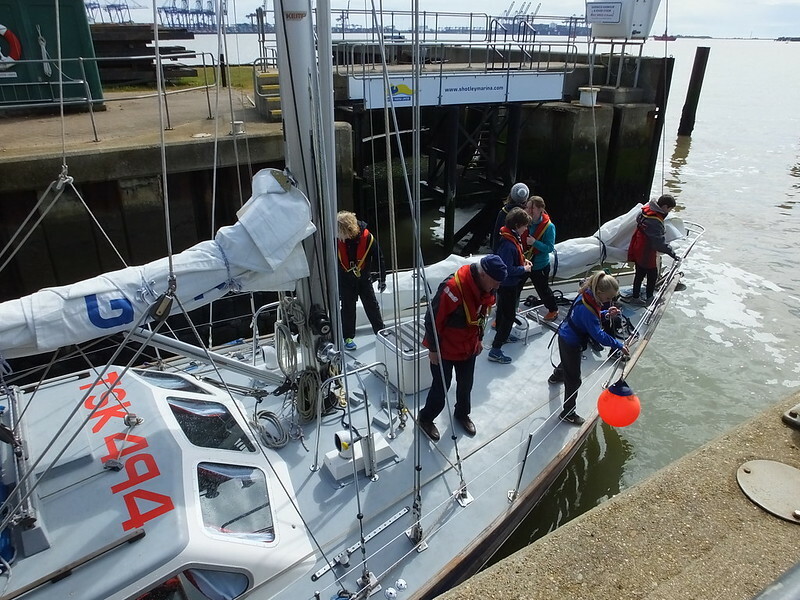 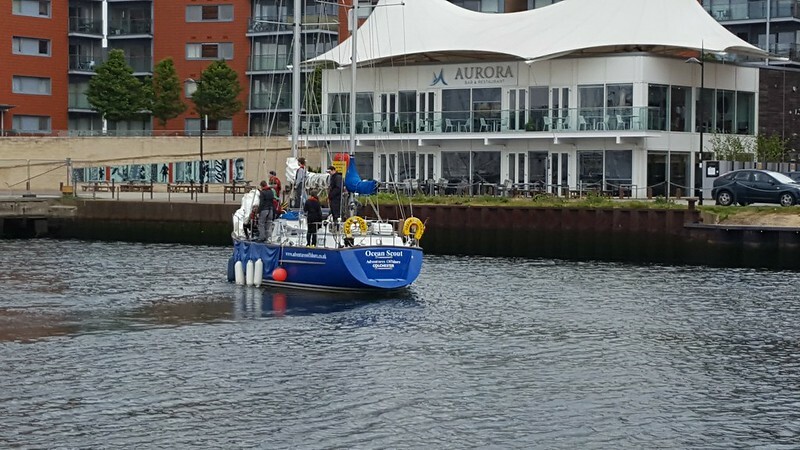 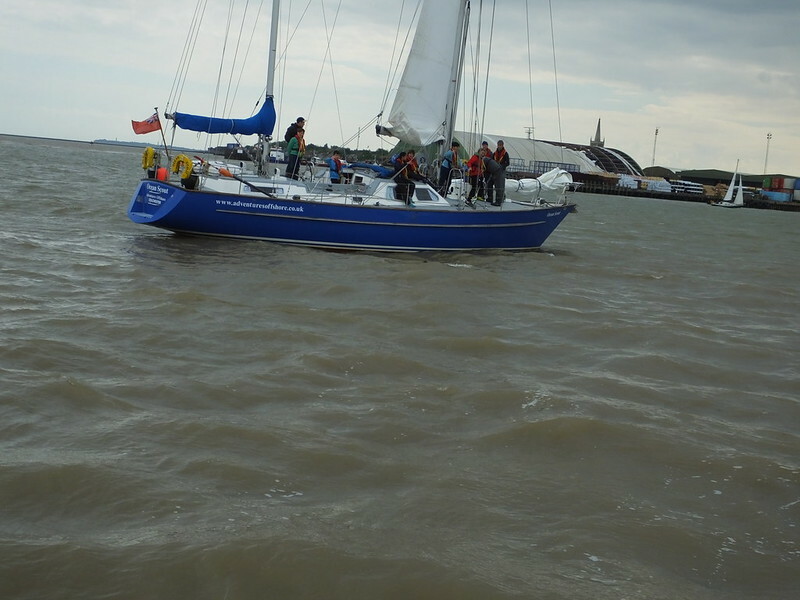 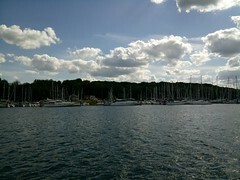 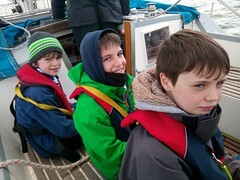 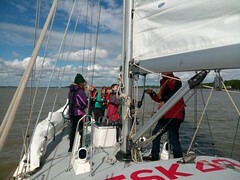 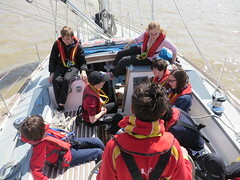 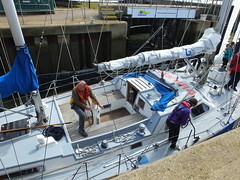 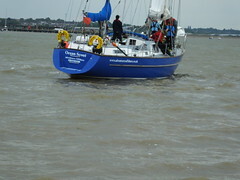 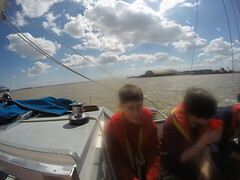 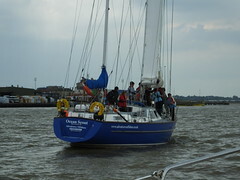 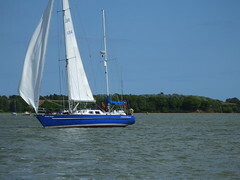 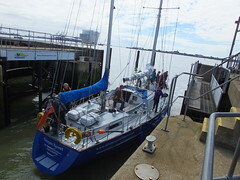 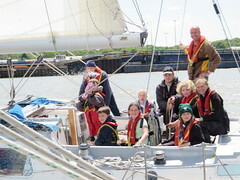 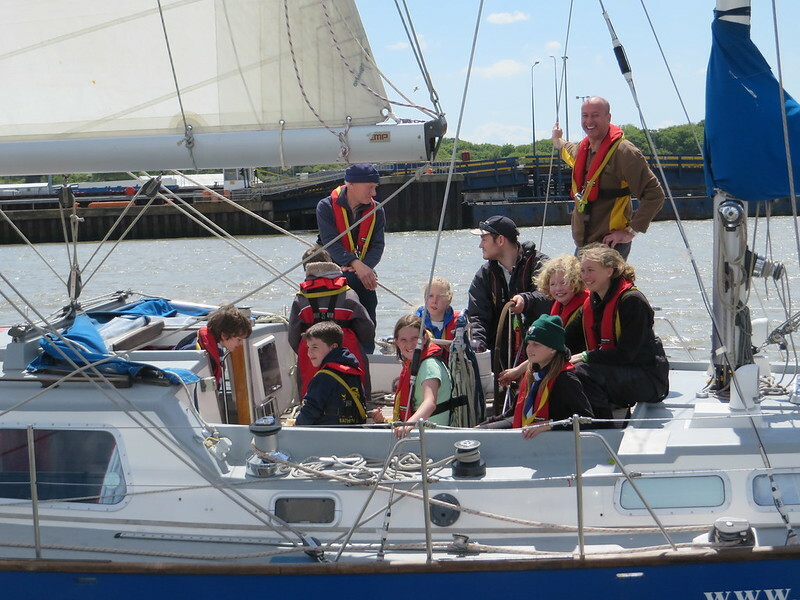 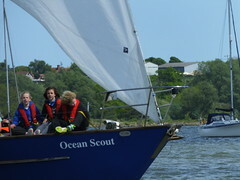 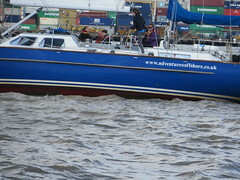 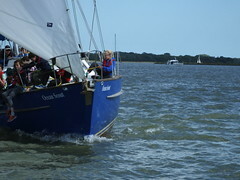 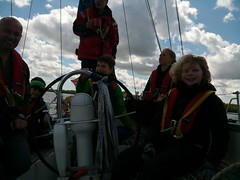 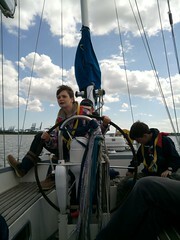 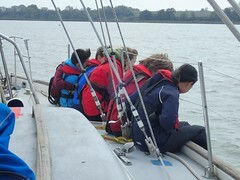 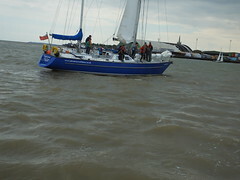 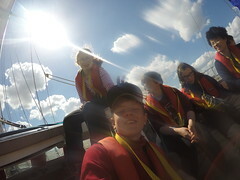 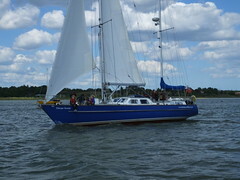 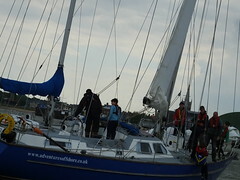 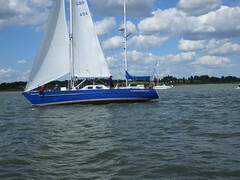 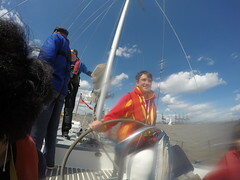 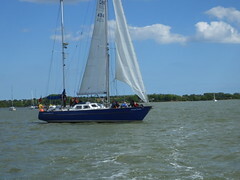 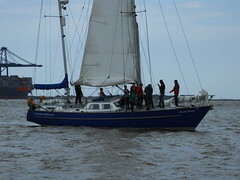 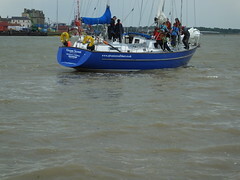 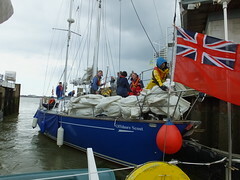 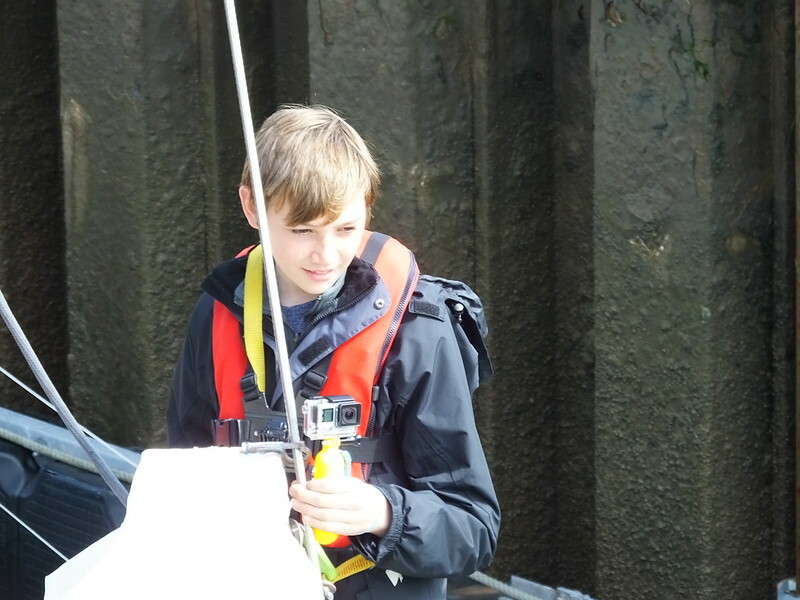 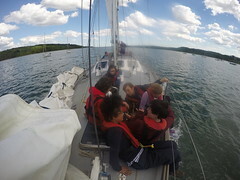 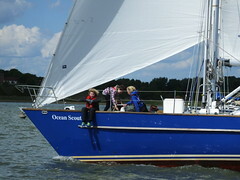 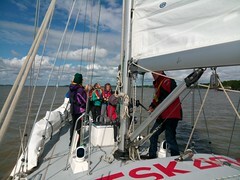 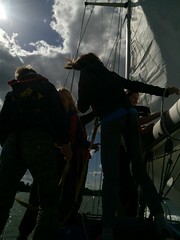 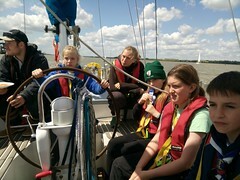 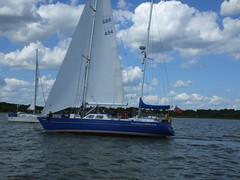 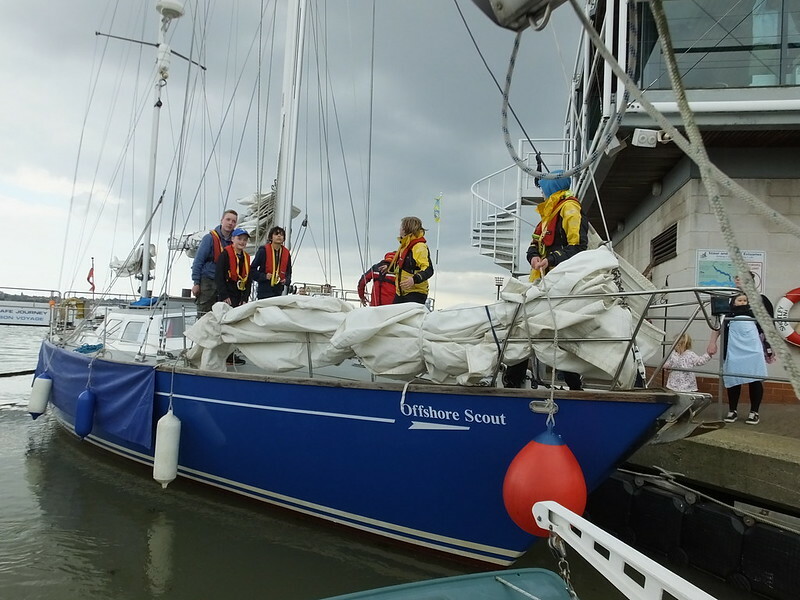 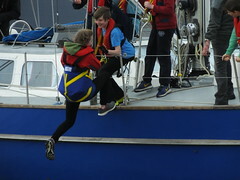 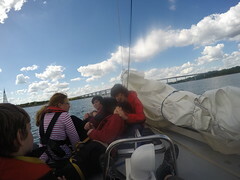 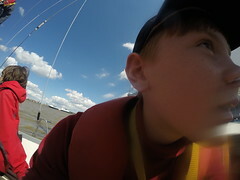 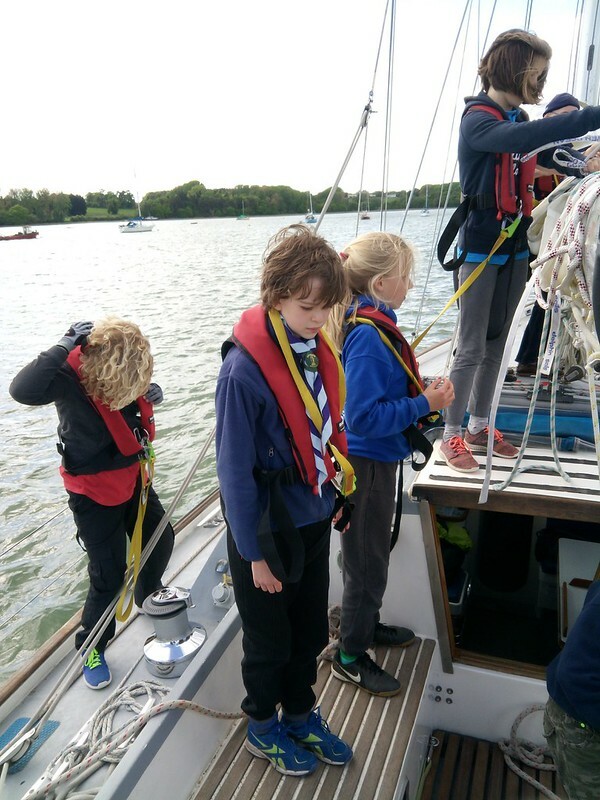 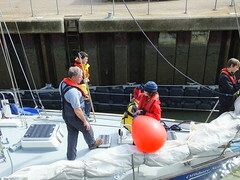 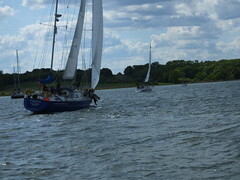 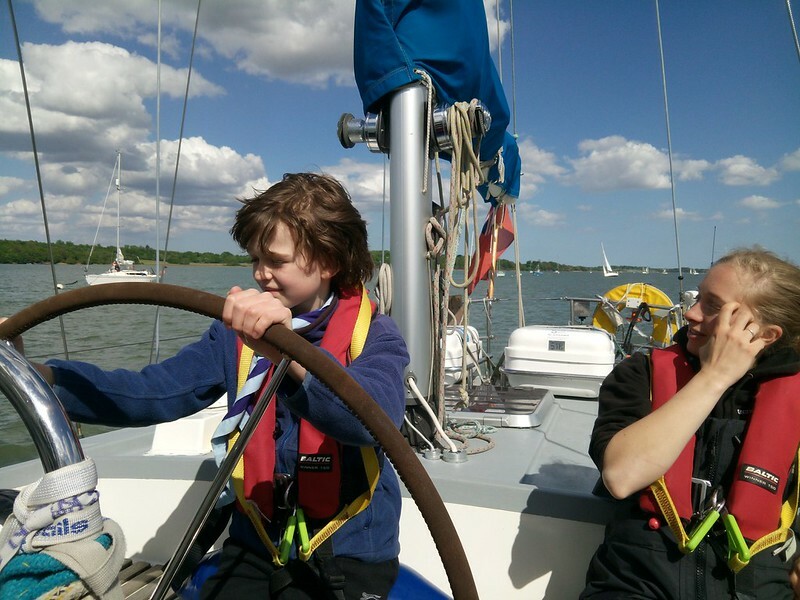 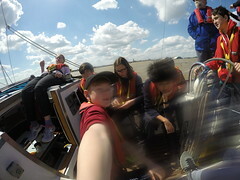 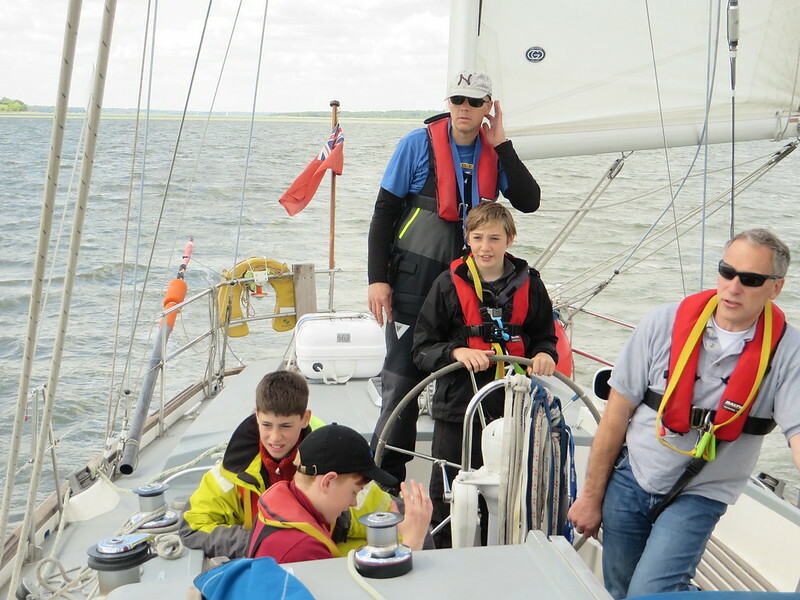 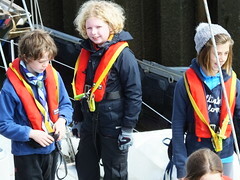 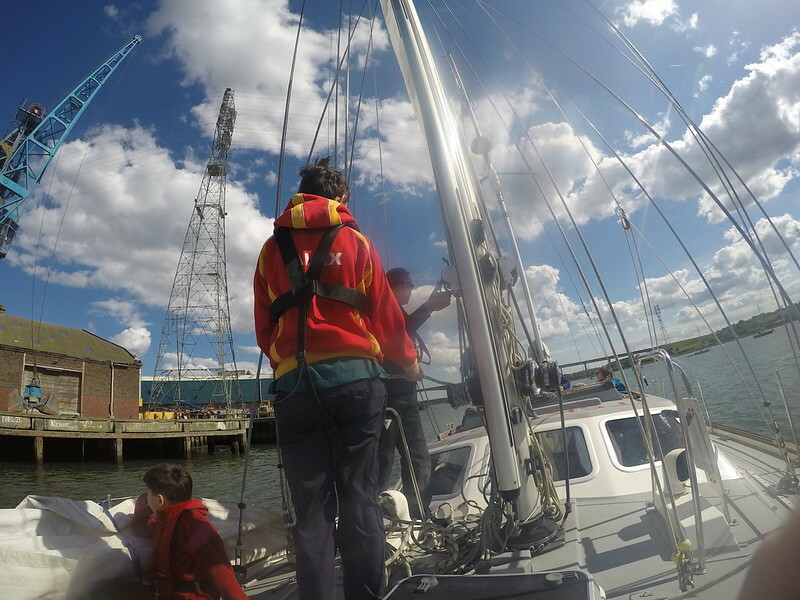 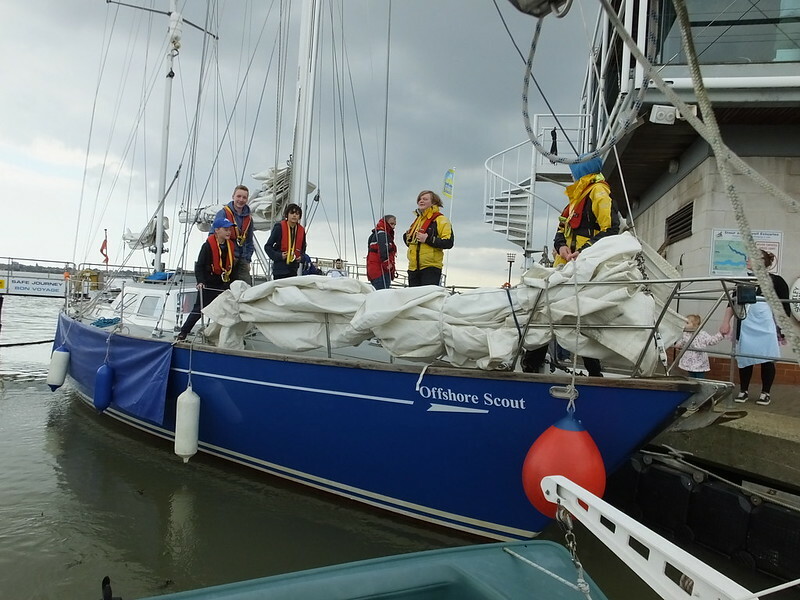 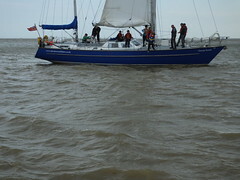 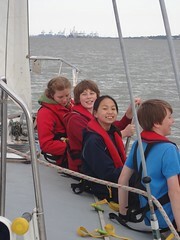 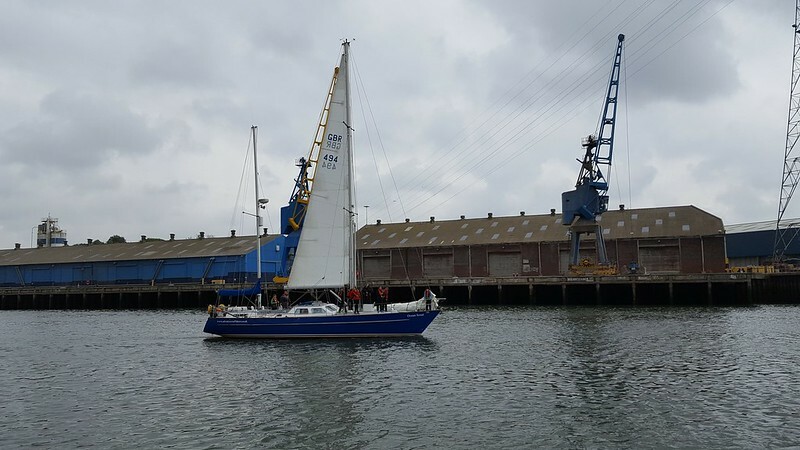 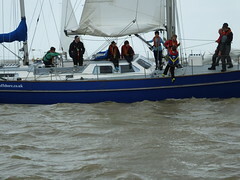 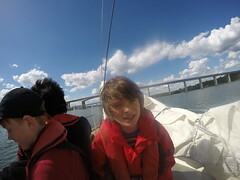 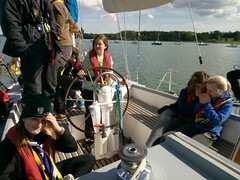 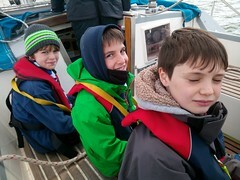 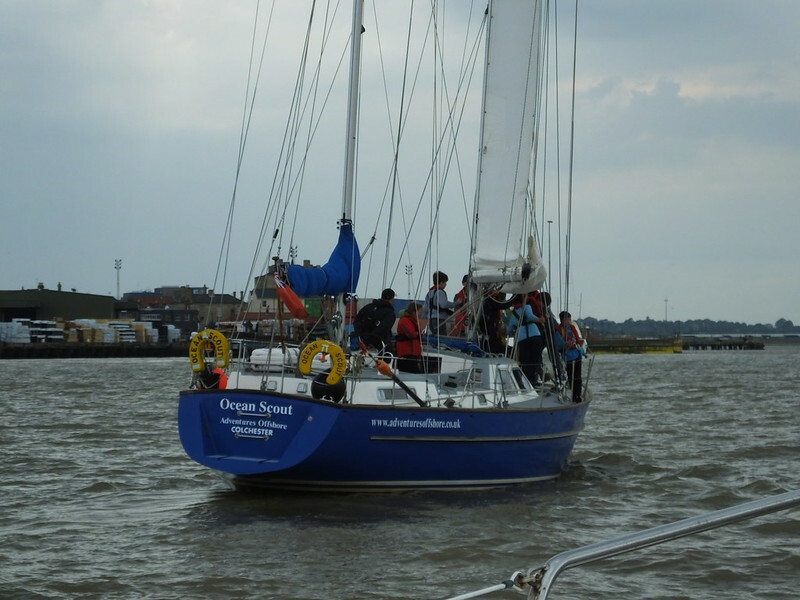 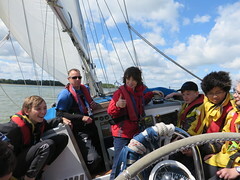 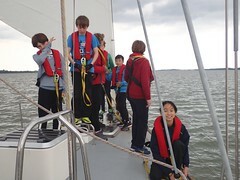 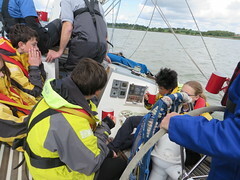 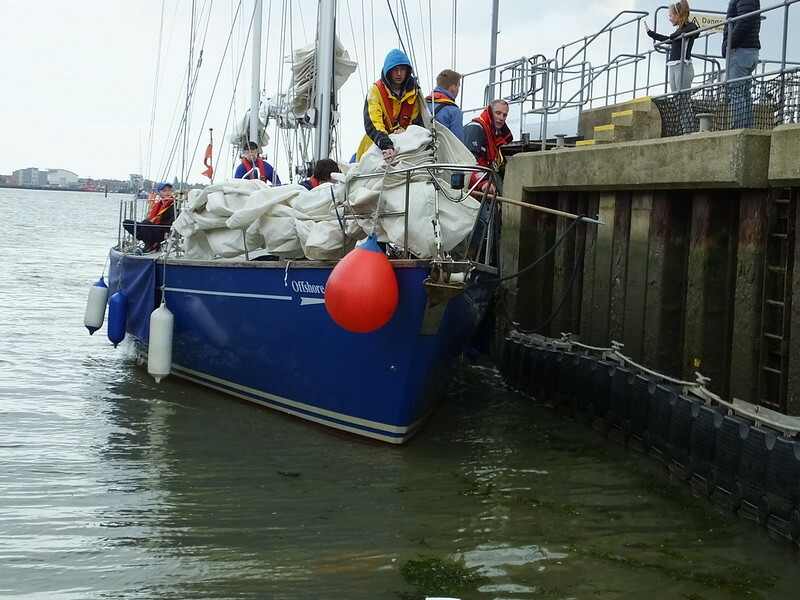 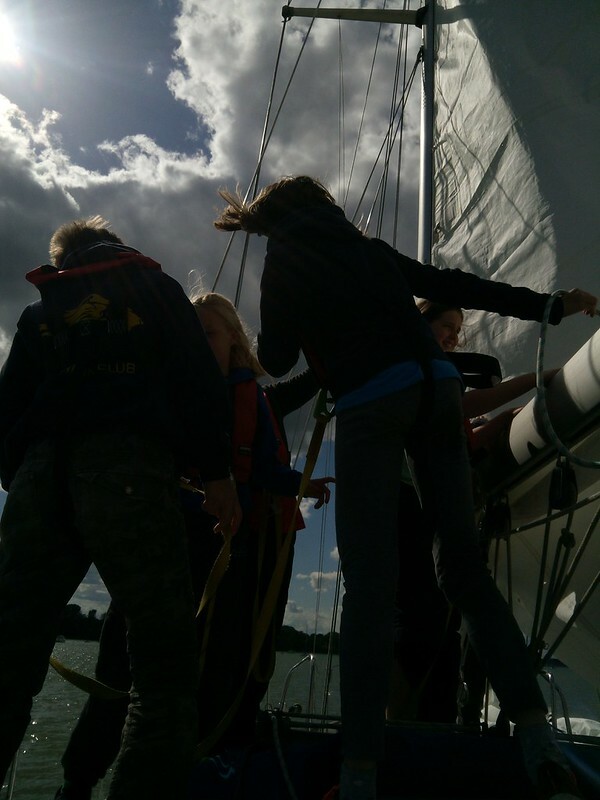 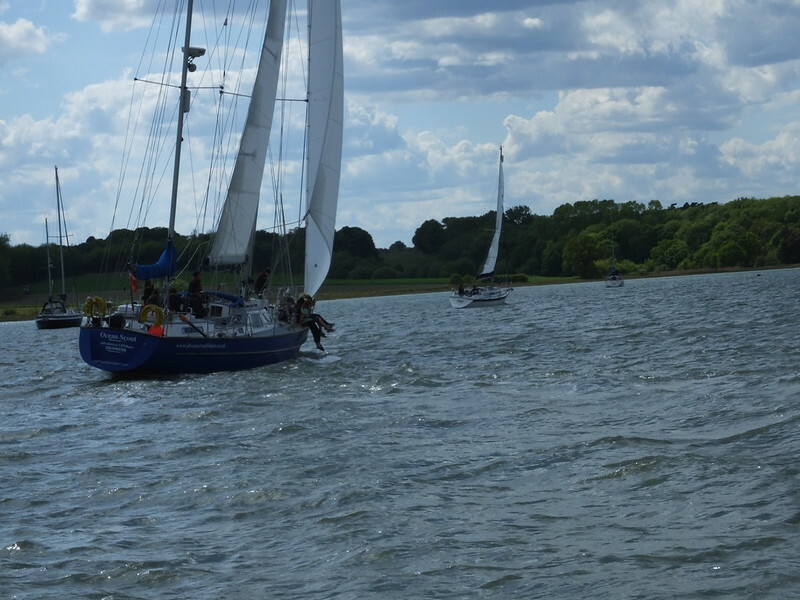 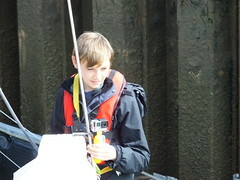 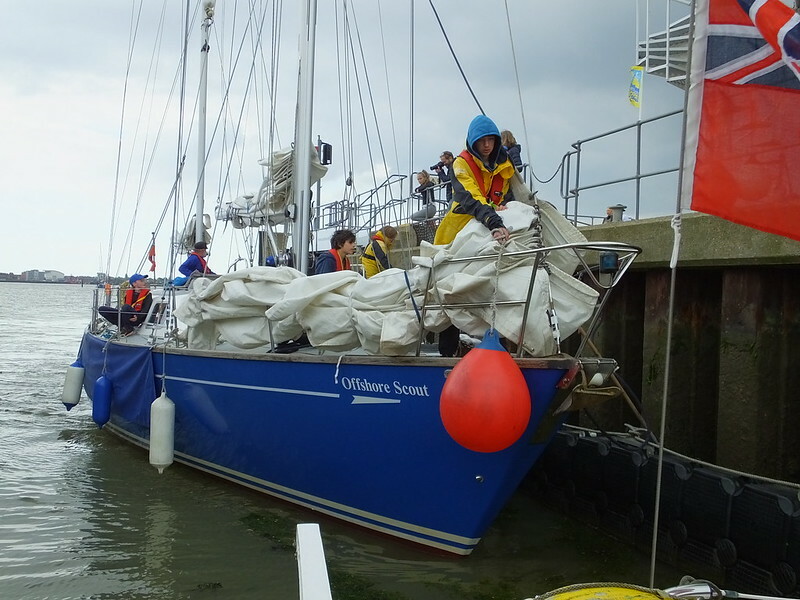 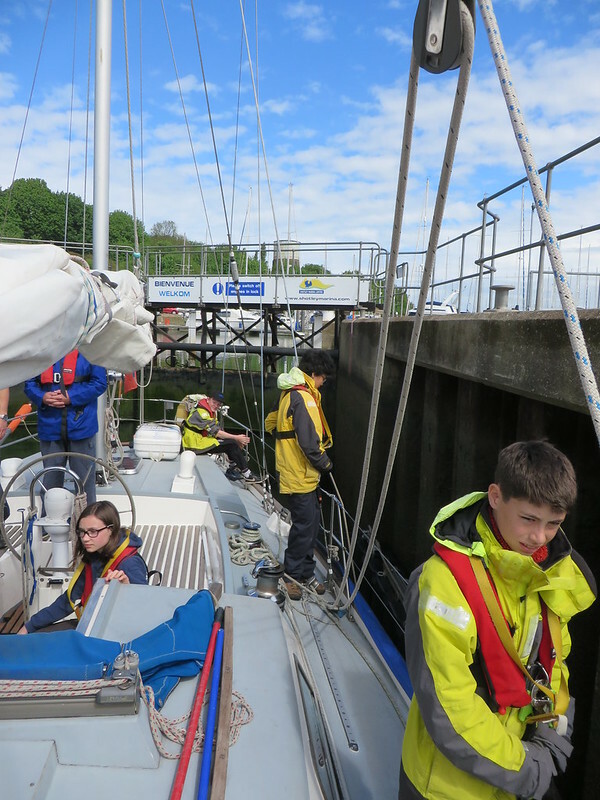 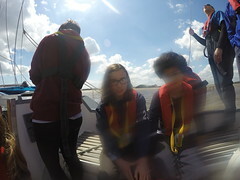 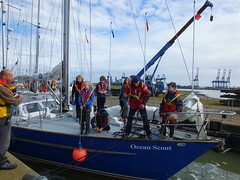 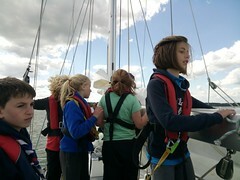 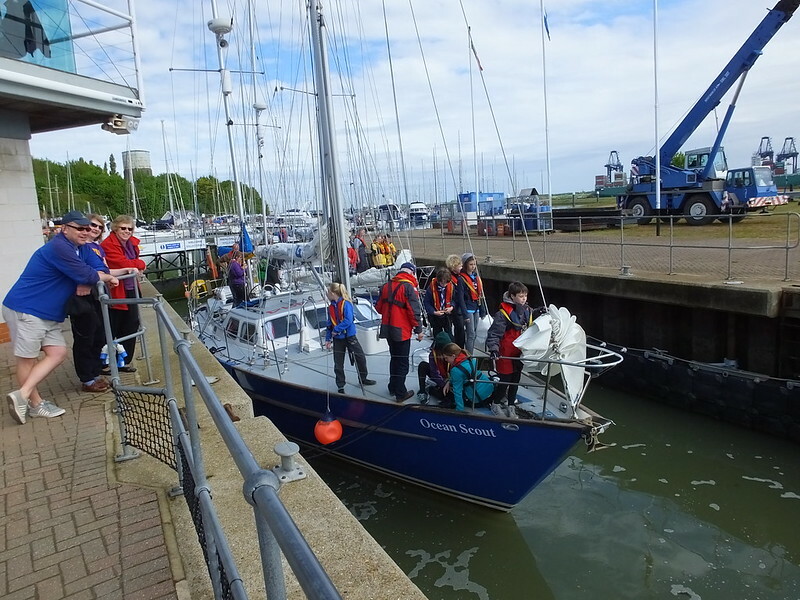 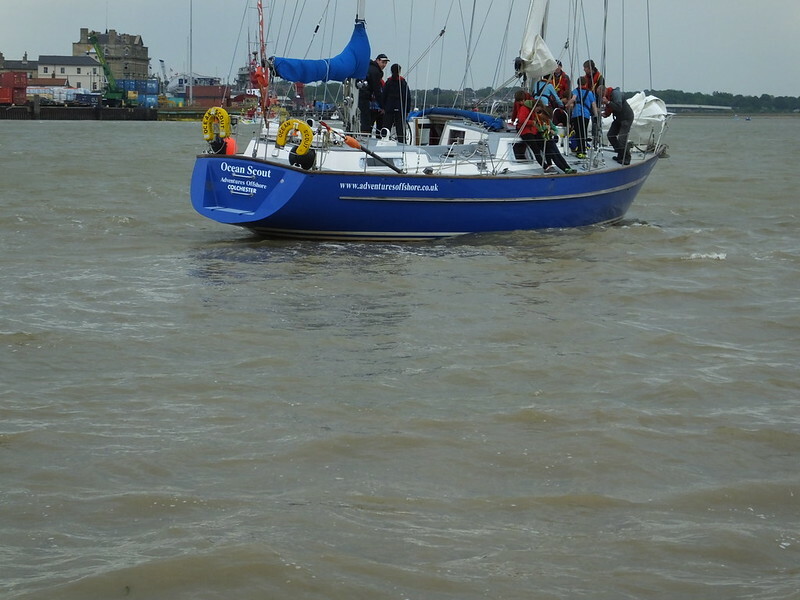 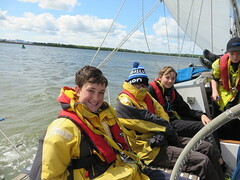 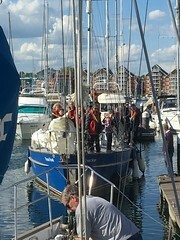 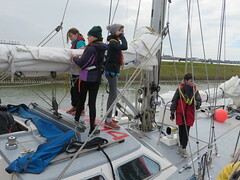 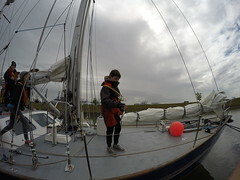 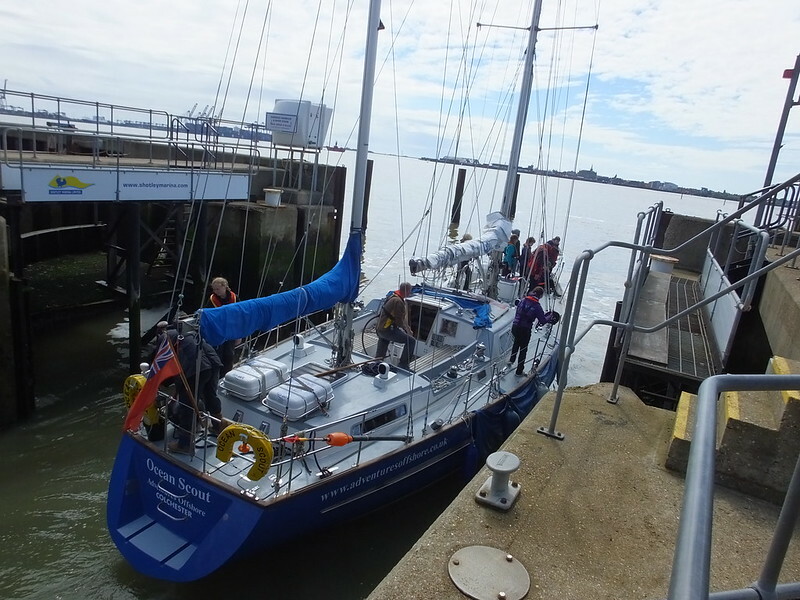 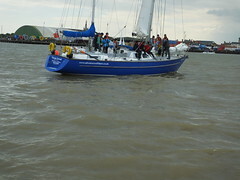 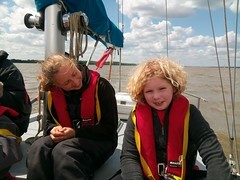 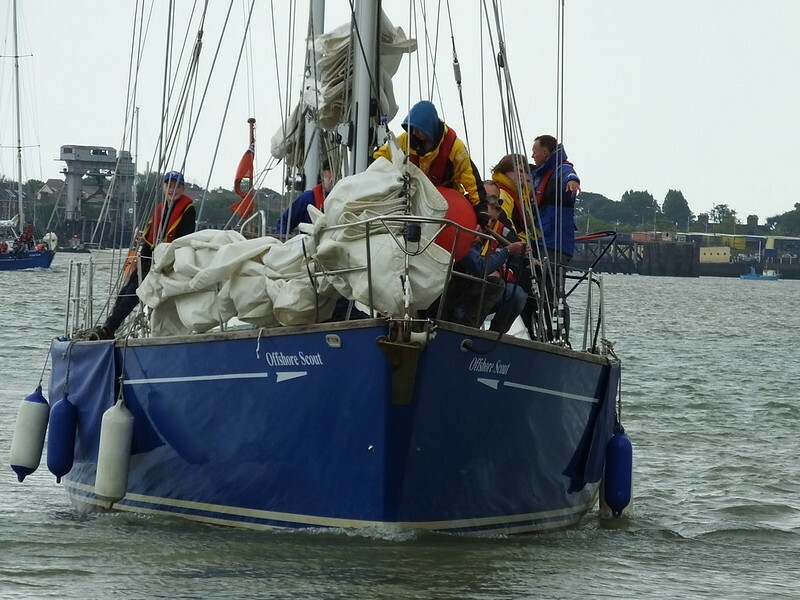 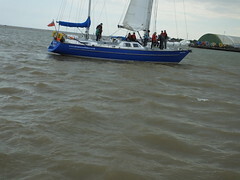 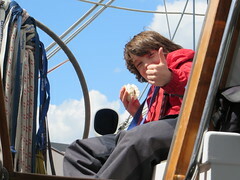 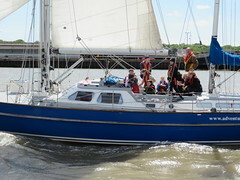 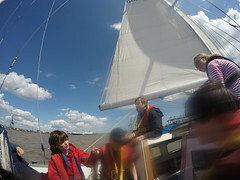 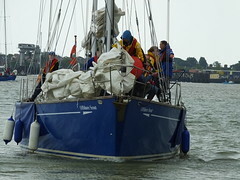 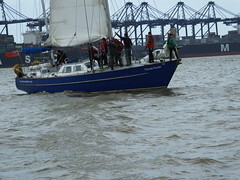 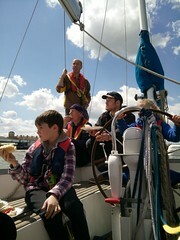 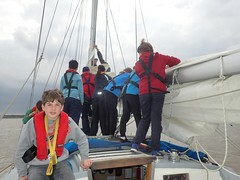 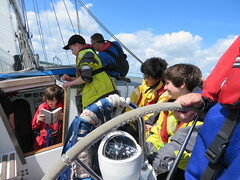 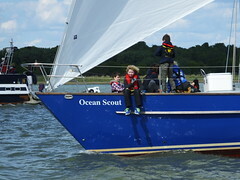 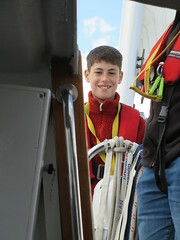 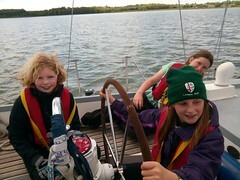 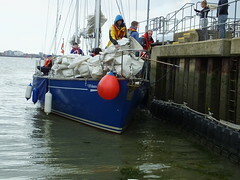 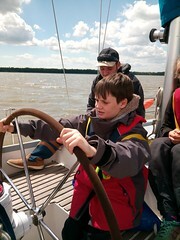 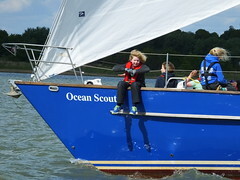 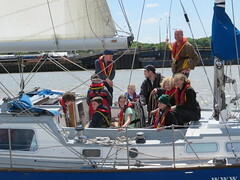 Locking out from the marina, the scouts got their first taste of freedom, with a fast sail up and down the River Stour. 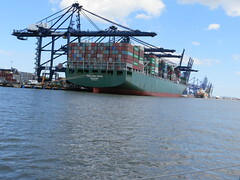 A little later, they ventured out past Harwich and the cranes of Felixstowe docks, where the open sea provided slightly bumpier water. 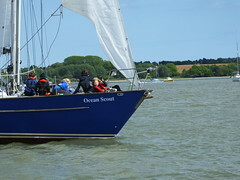 Returning to the Orwell and heading for home, the boats found themselves in a photo-shoot (the strange chap taking photos from another boat turned out to be the GSL’s father). 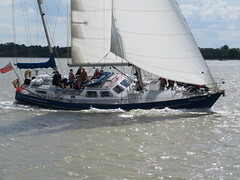 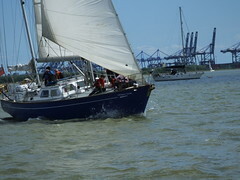 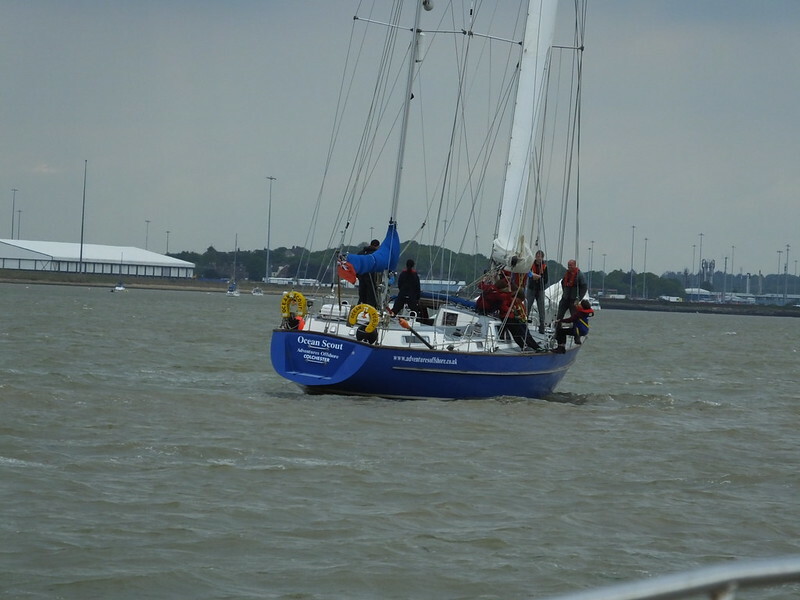 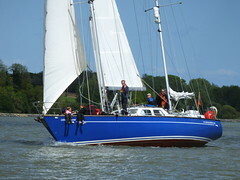 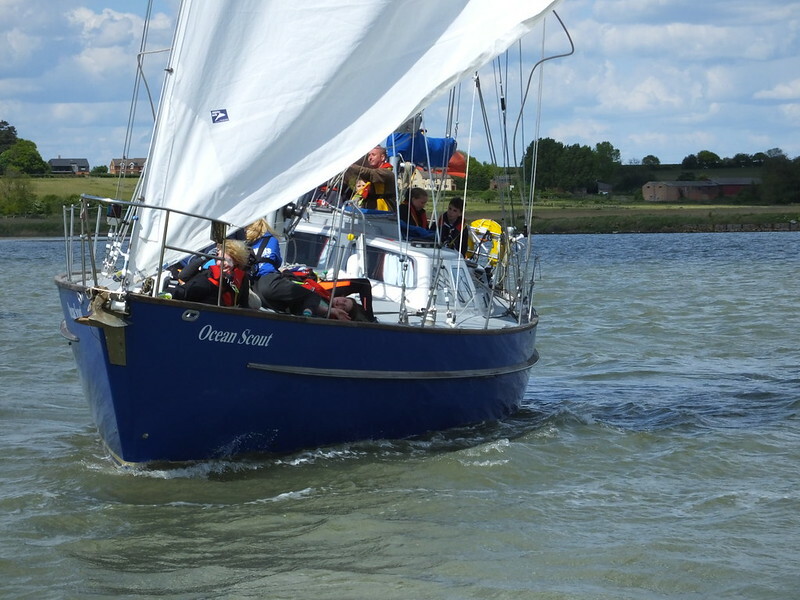 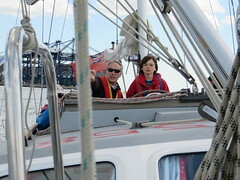 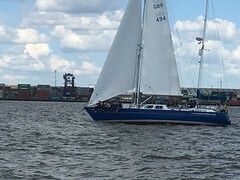 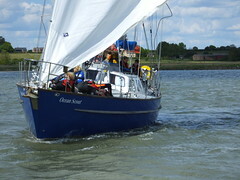 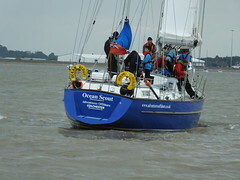 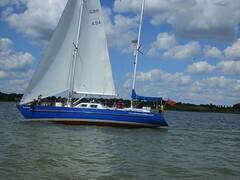 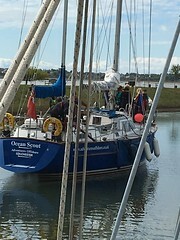 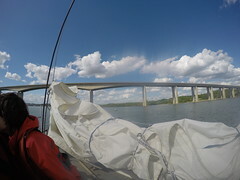 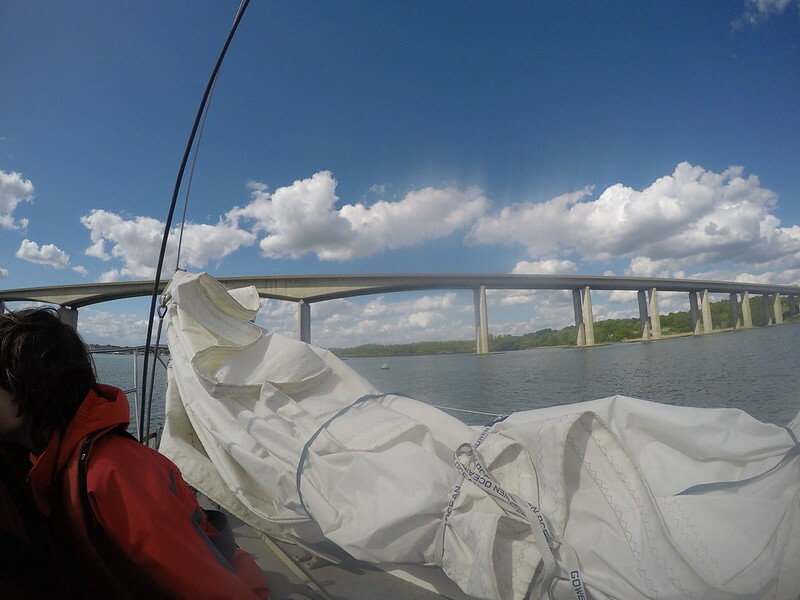 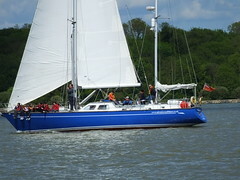 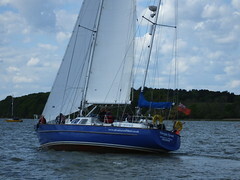 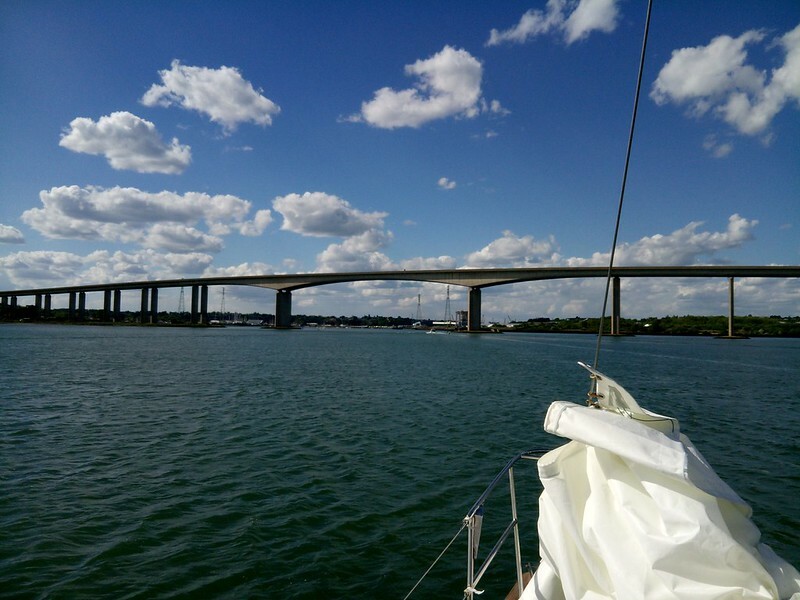 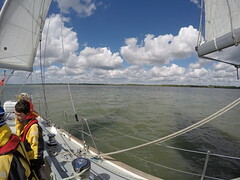 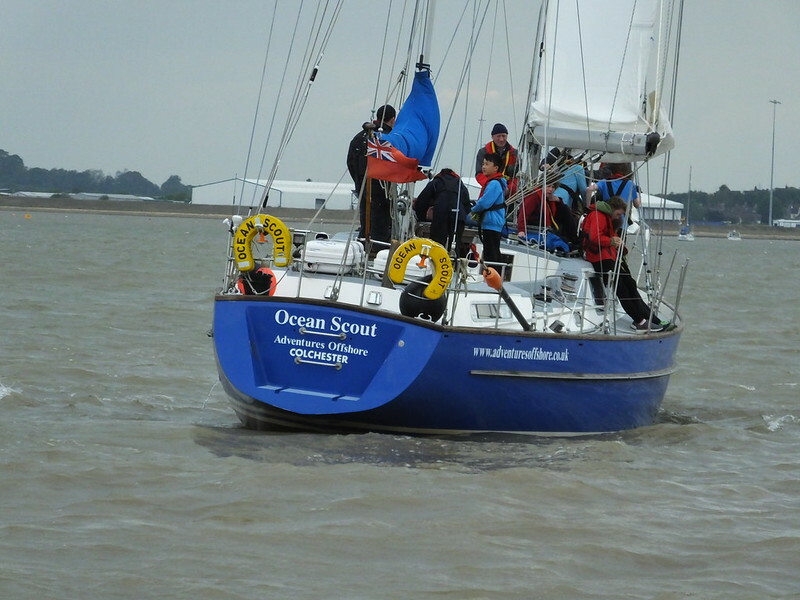 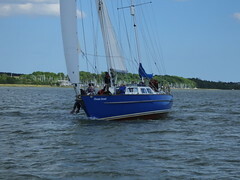 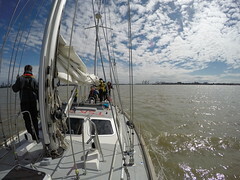 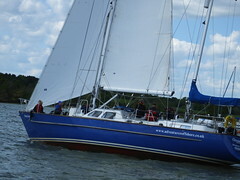 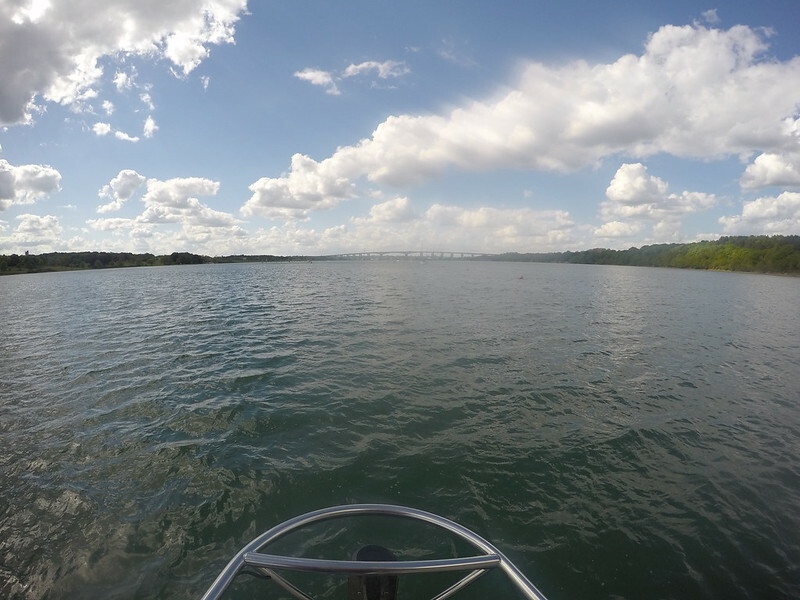 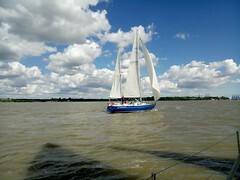 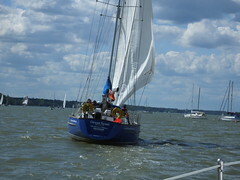 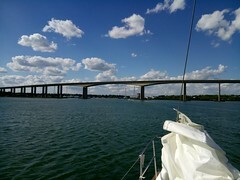 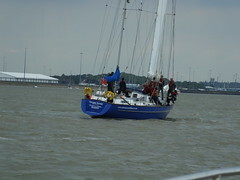 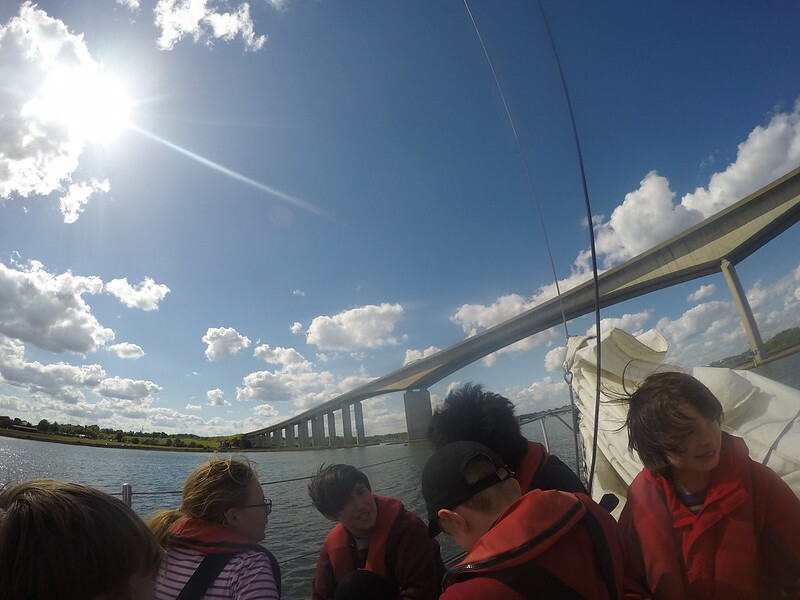 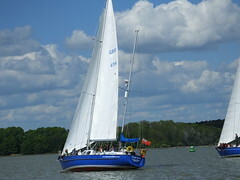 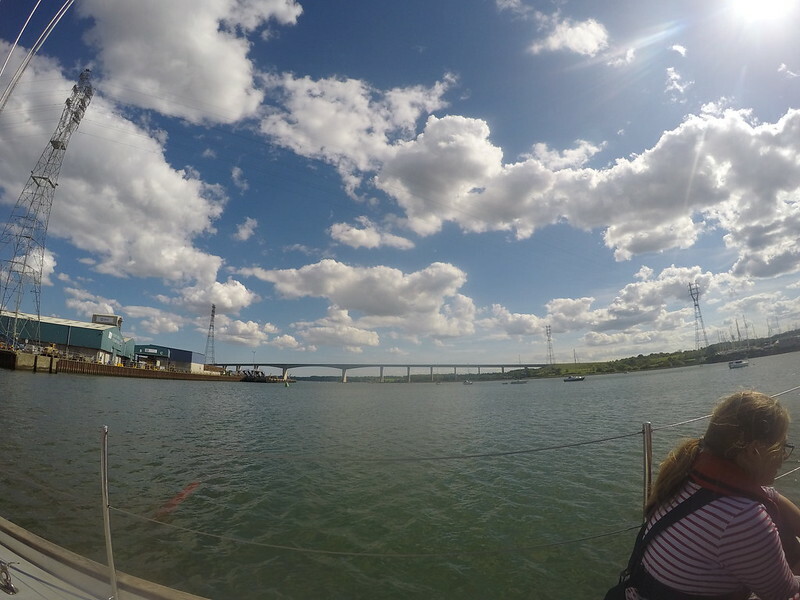 The appearance of the Orwell Bridge signalled the approach of Ipswich and the end of the voyage. 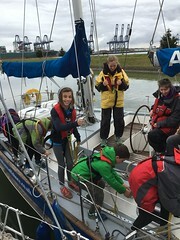 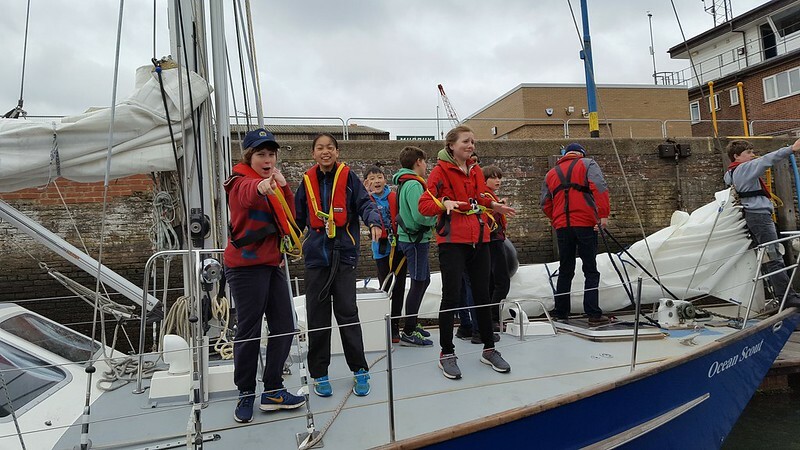 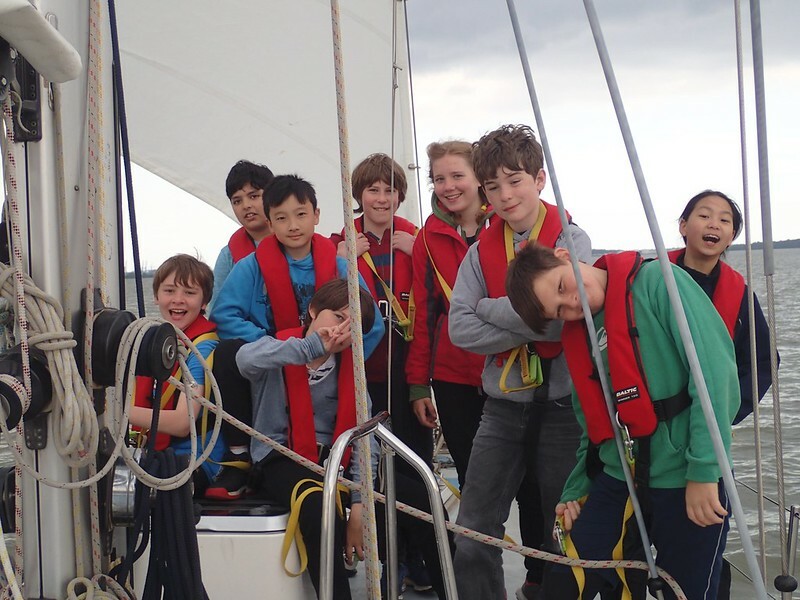 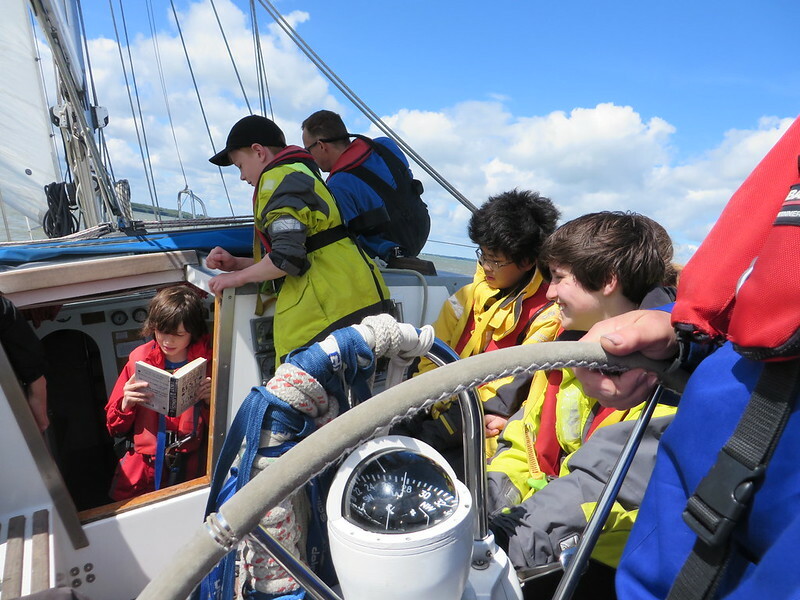 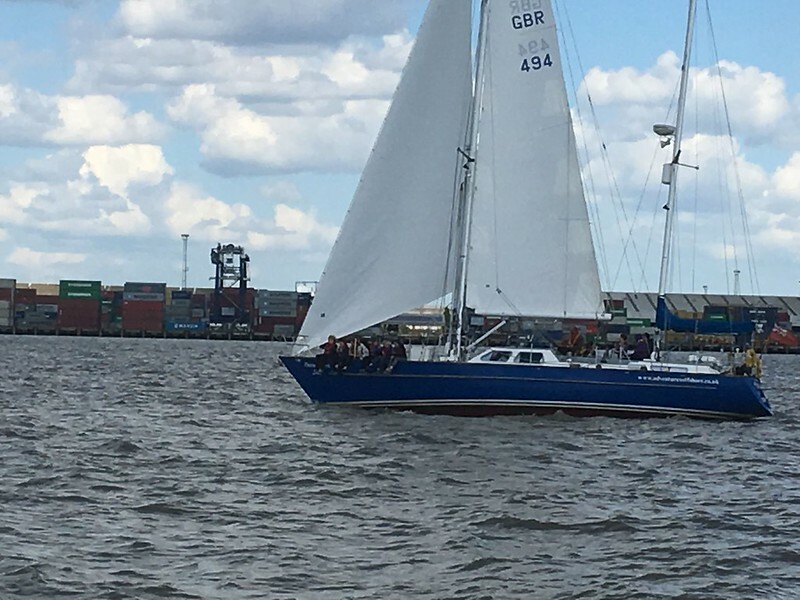 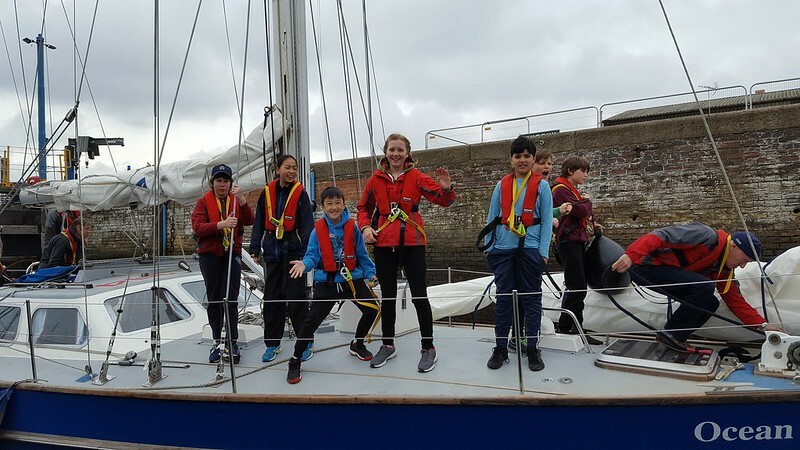 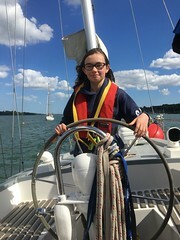 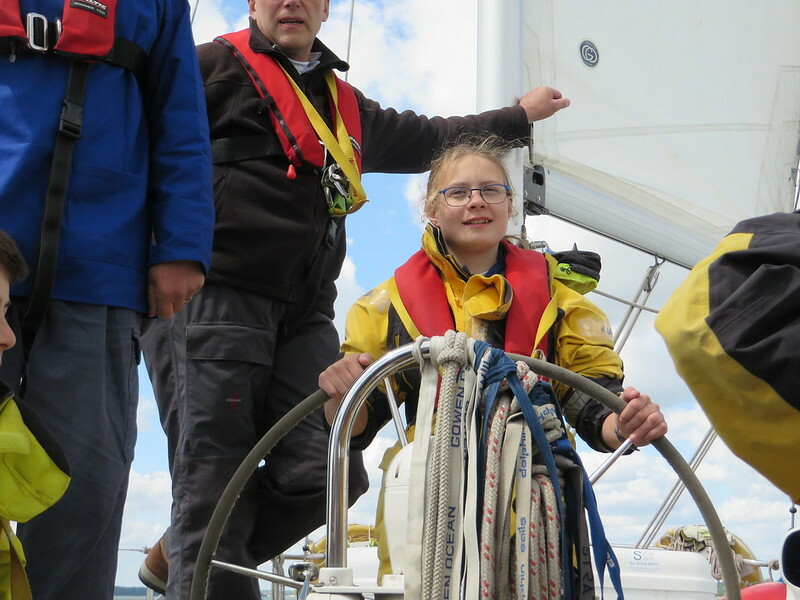 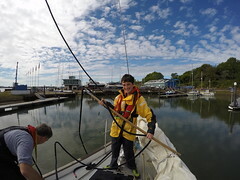 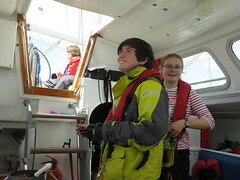 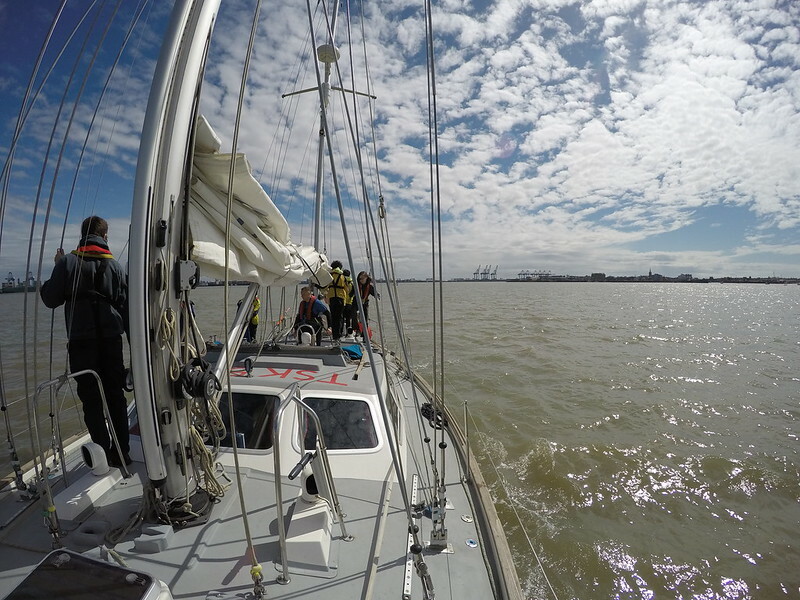 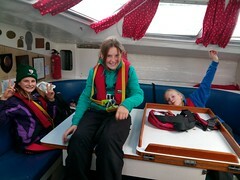 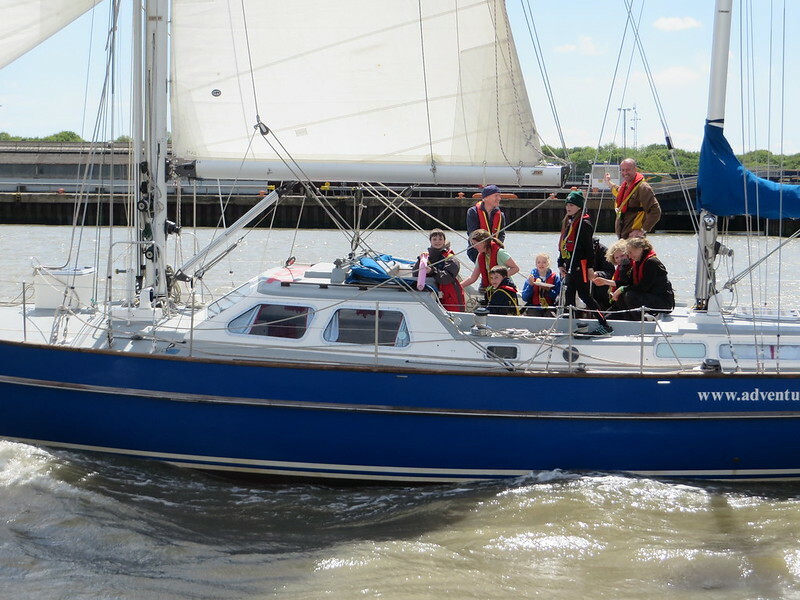 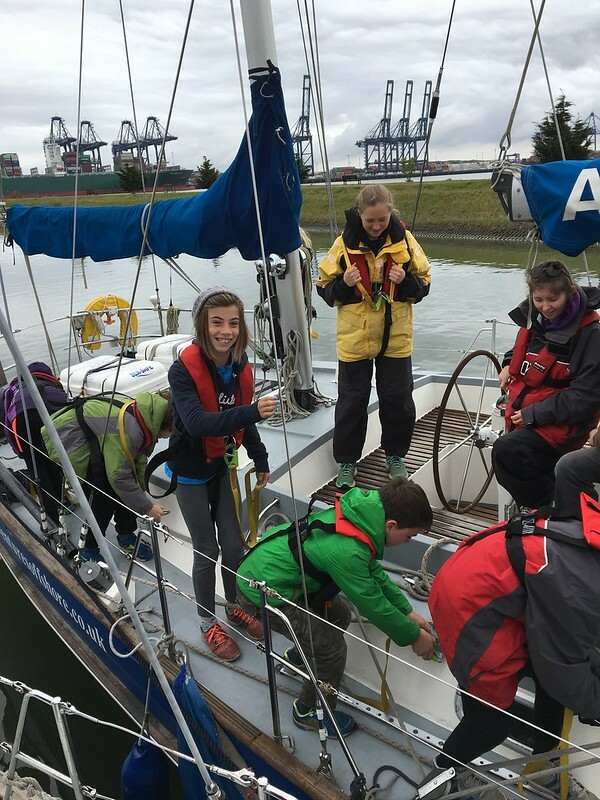 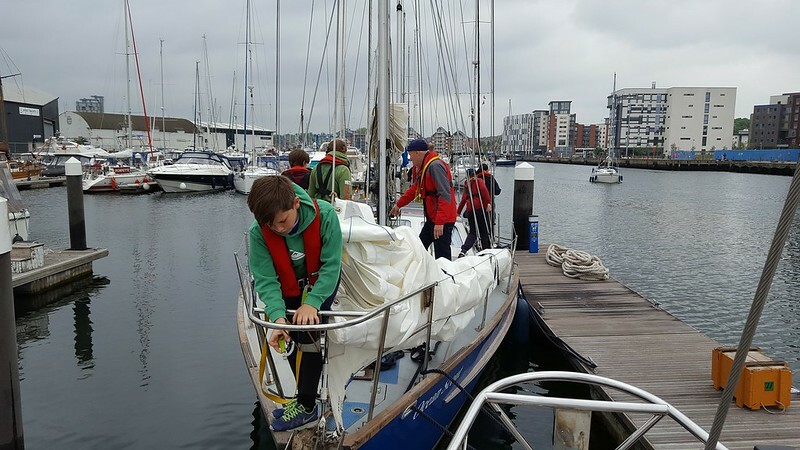 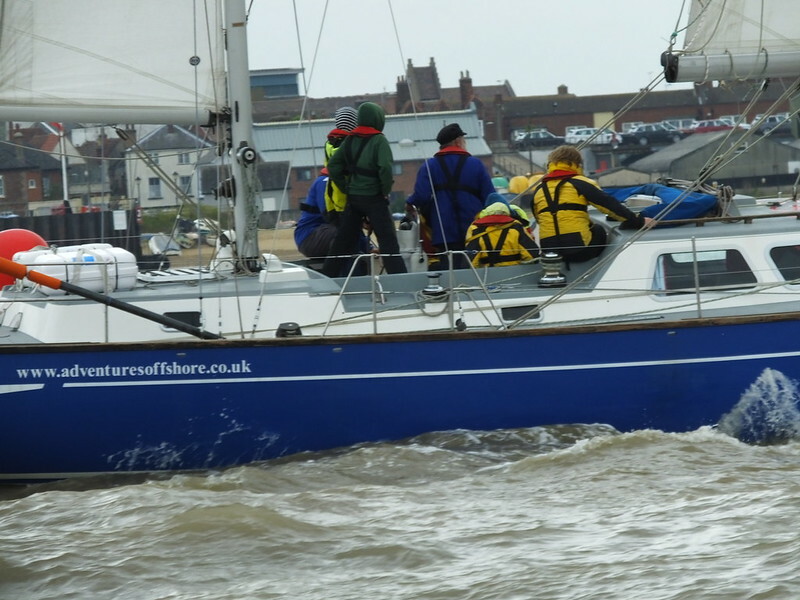 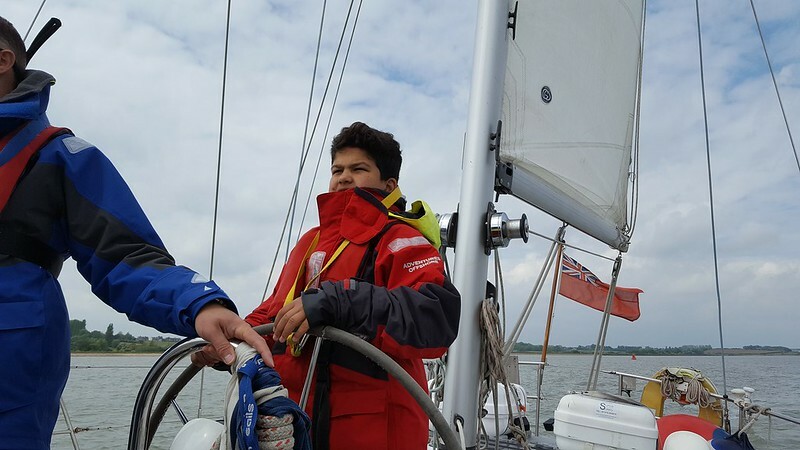 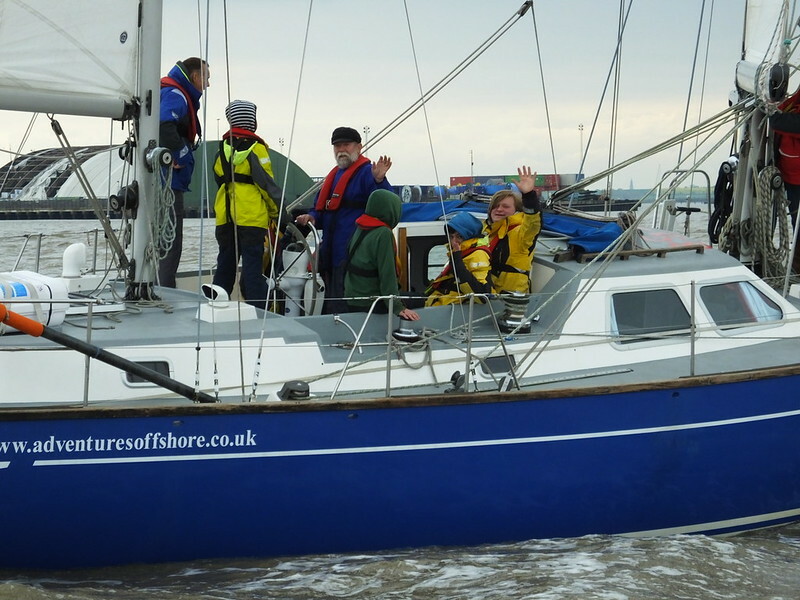 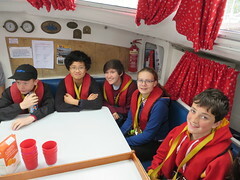 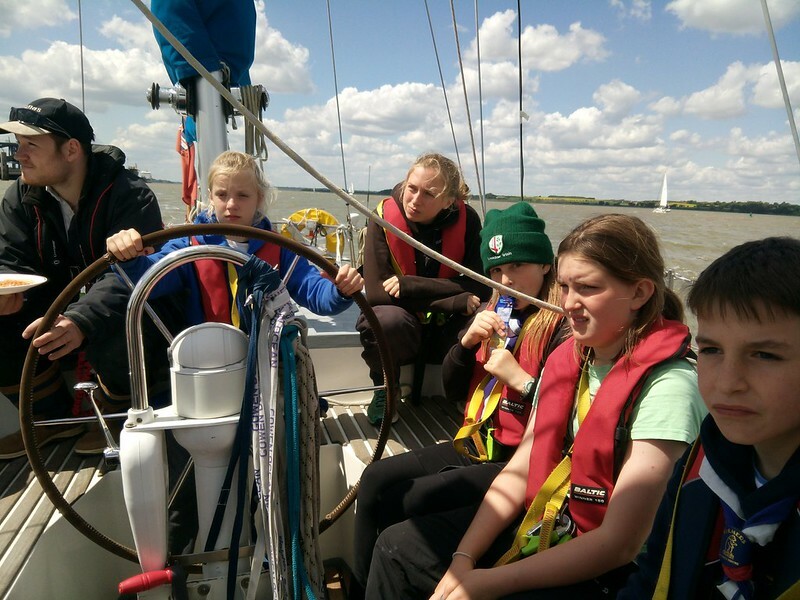 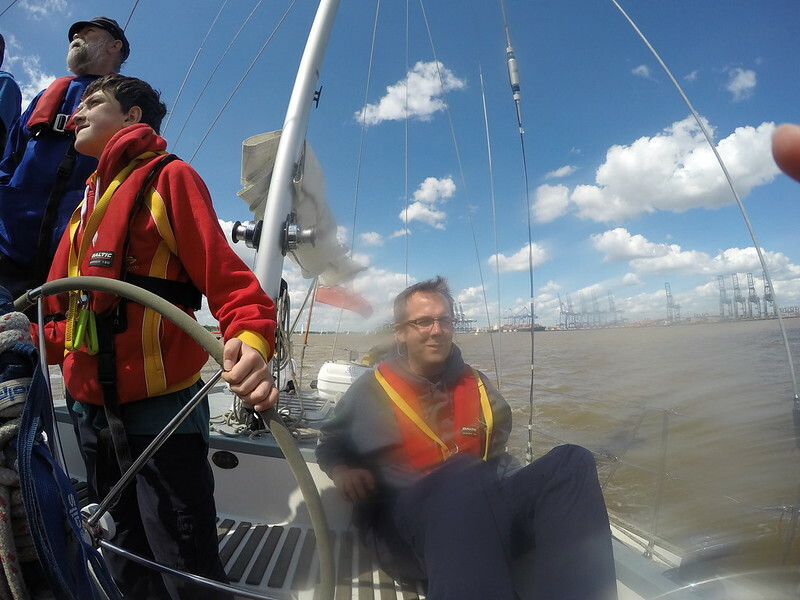 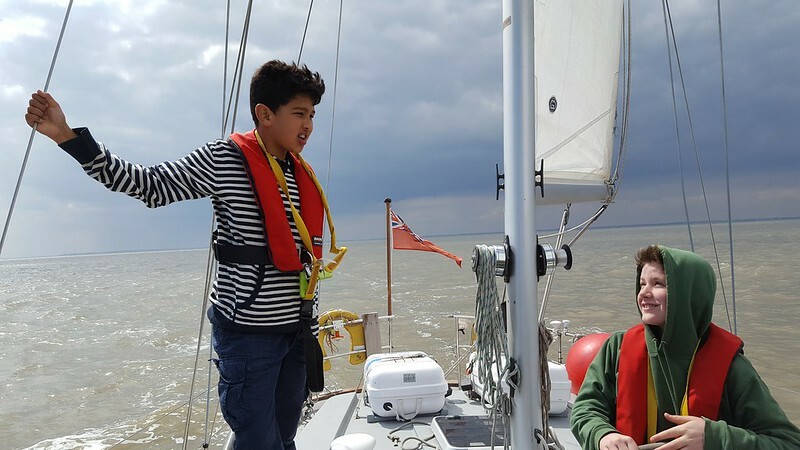 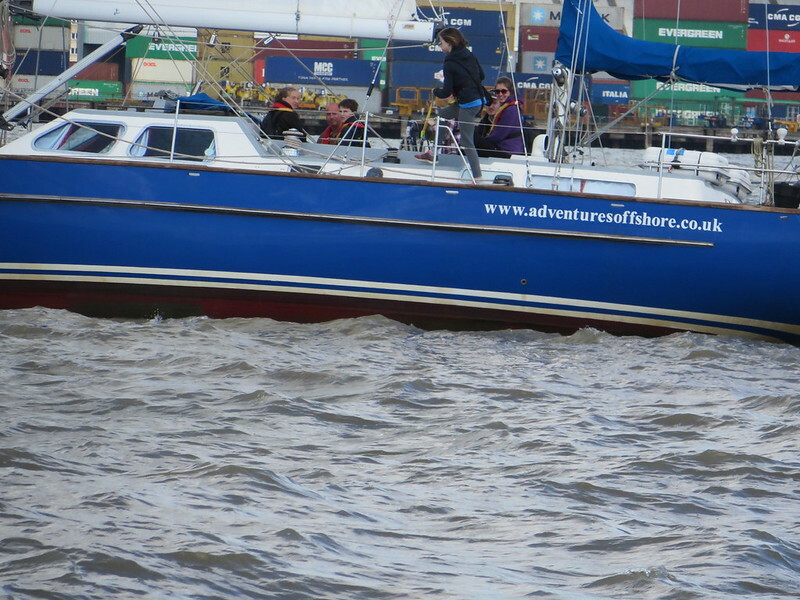 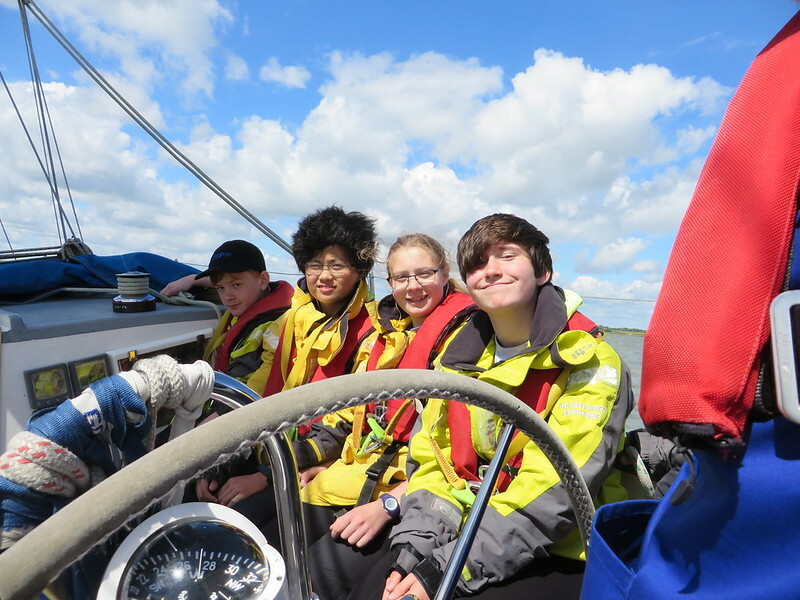 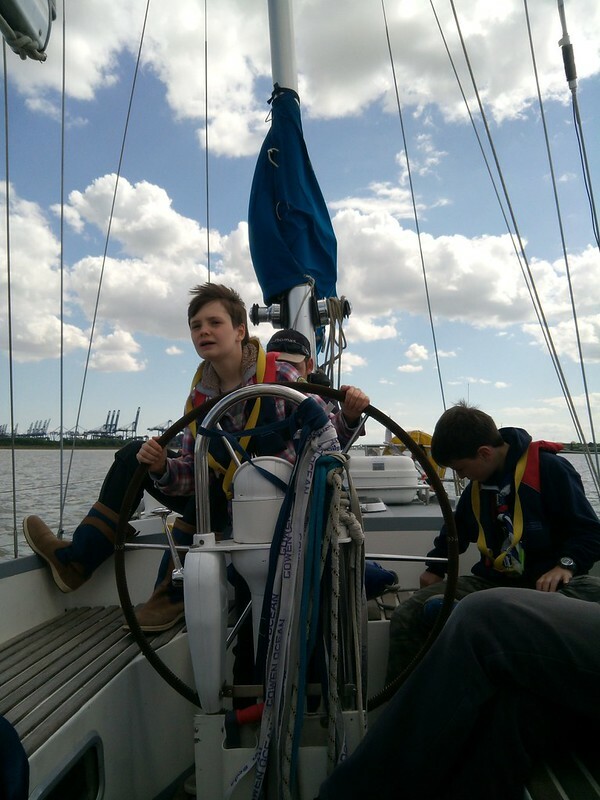 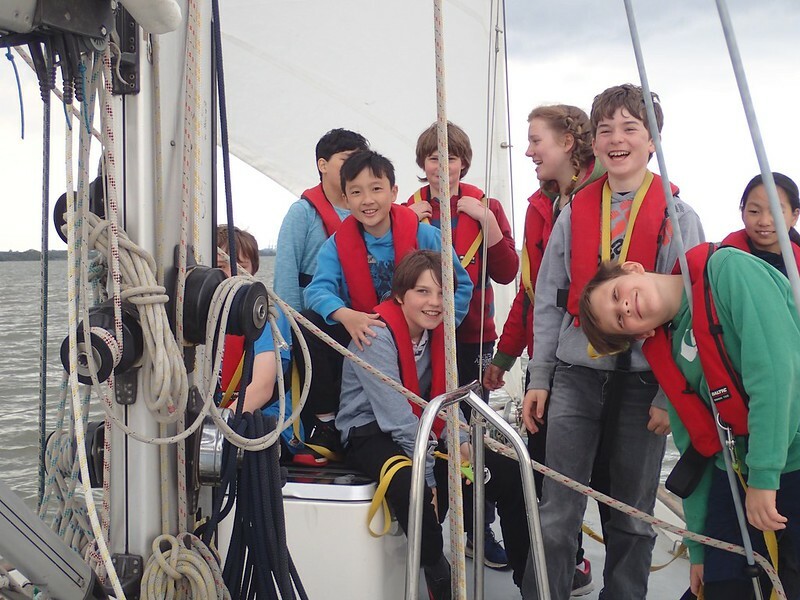 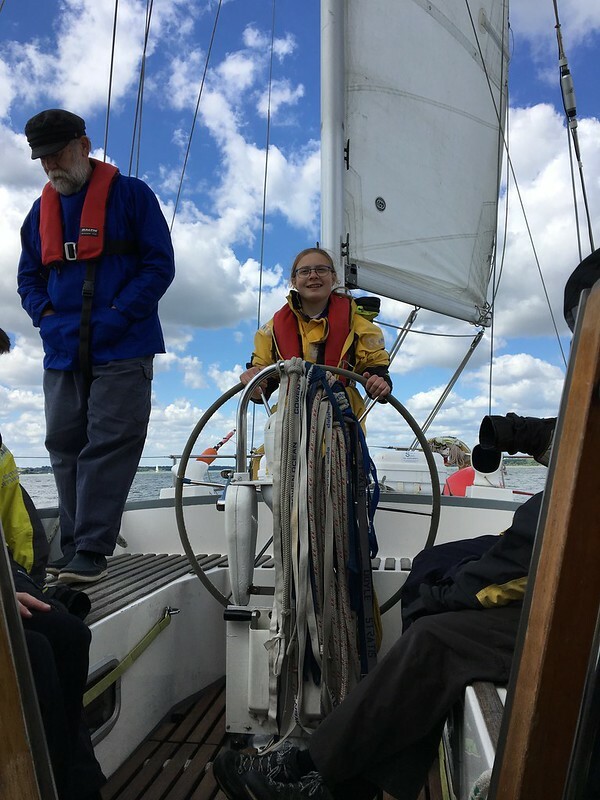 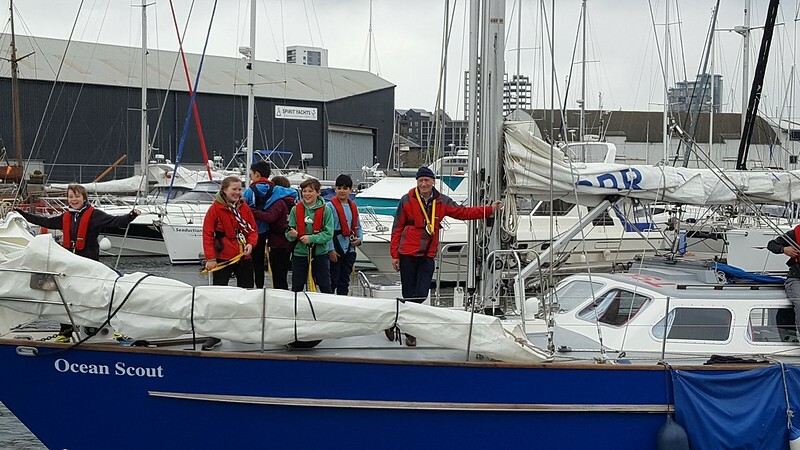 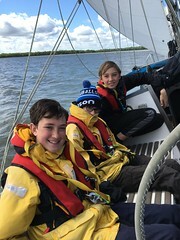 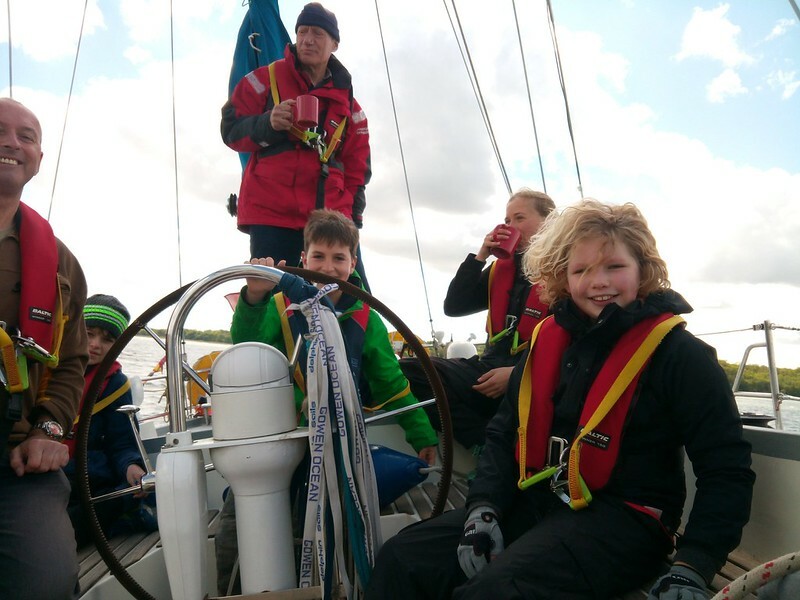 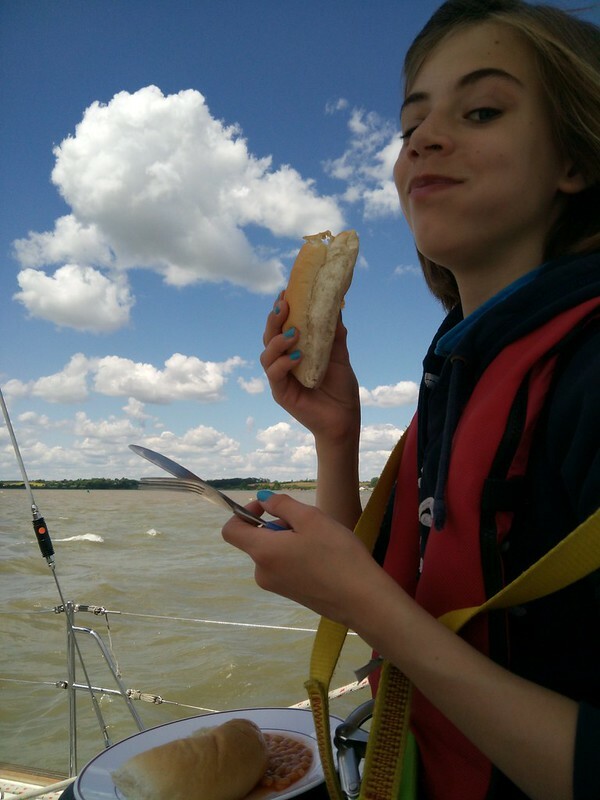 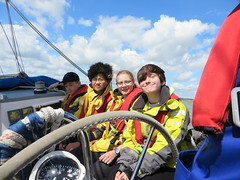 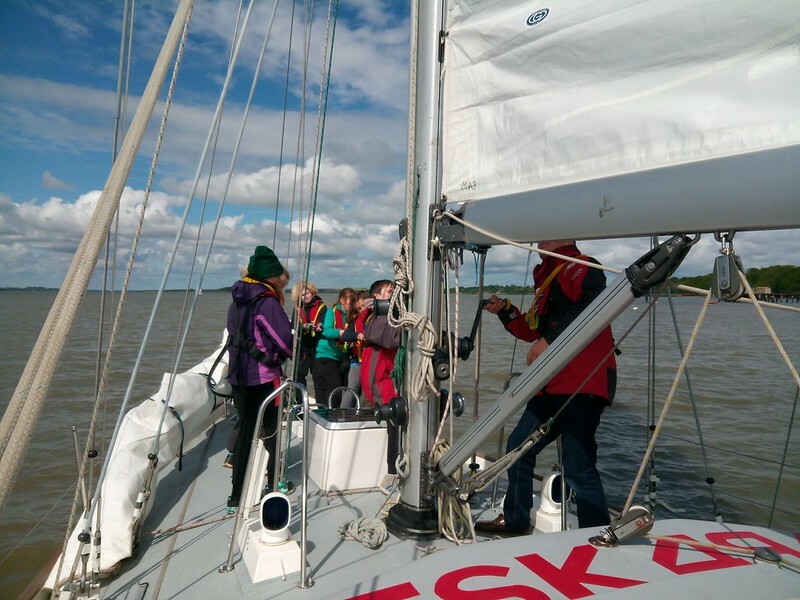 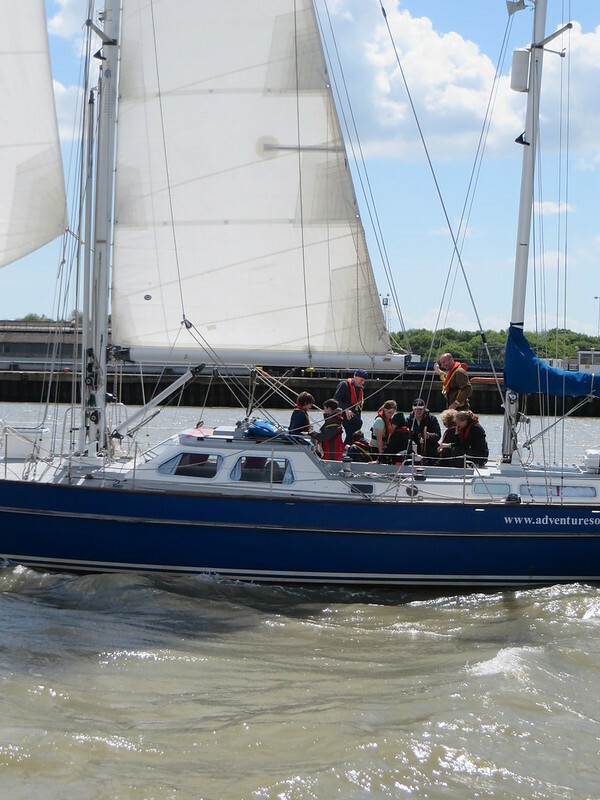 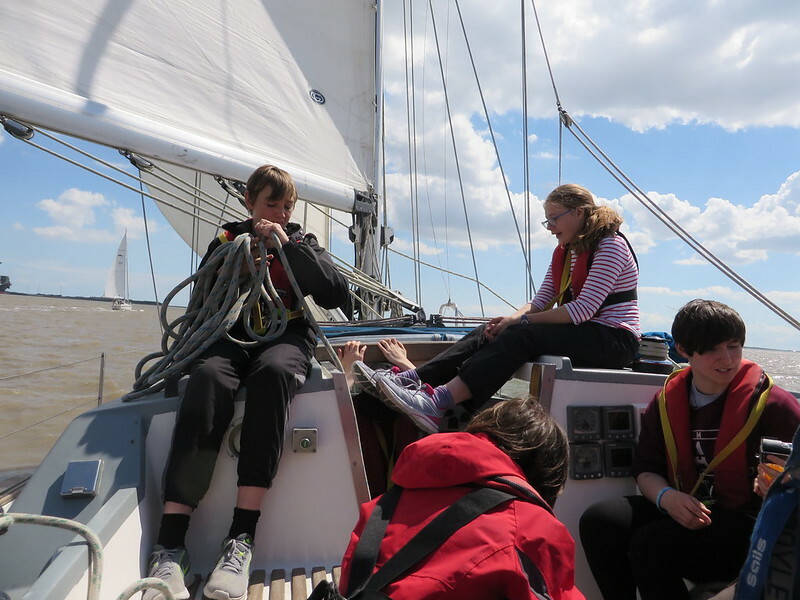 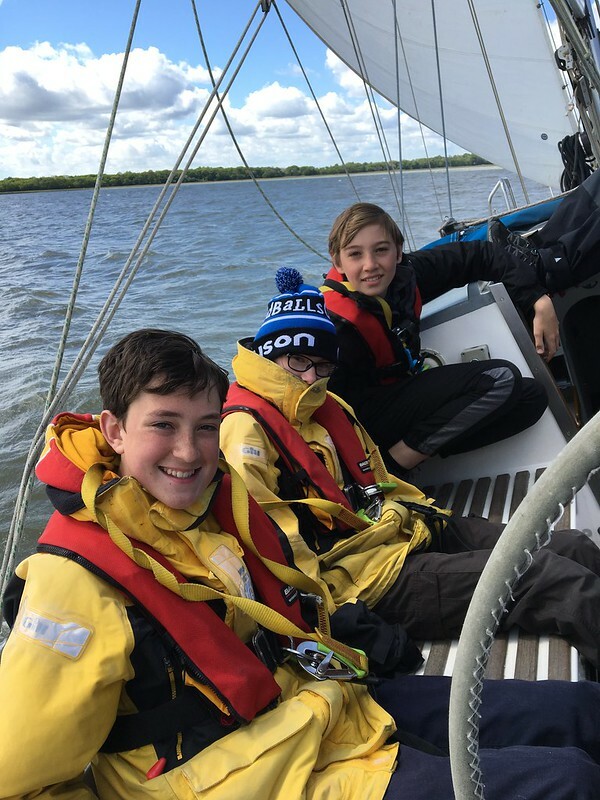 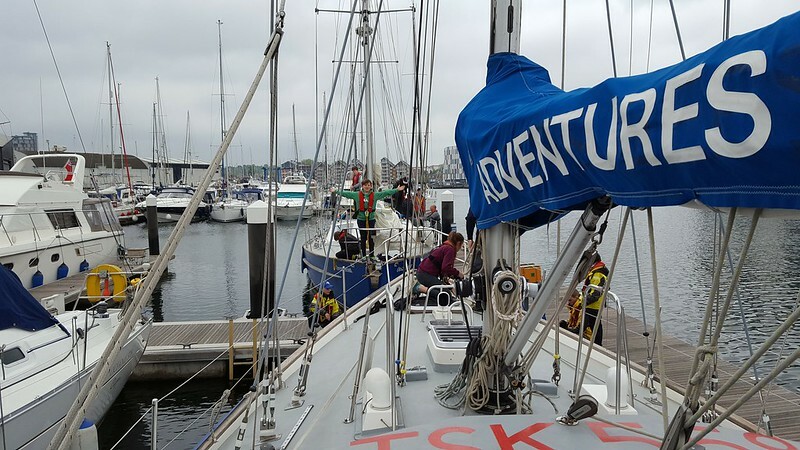 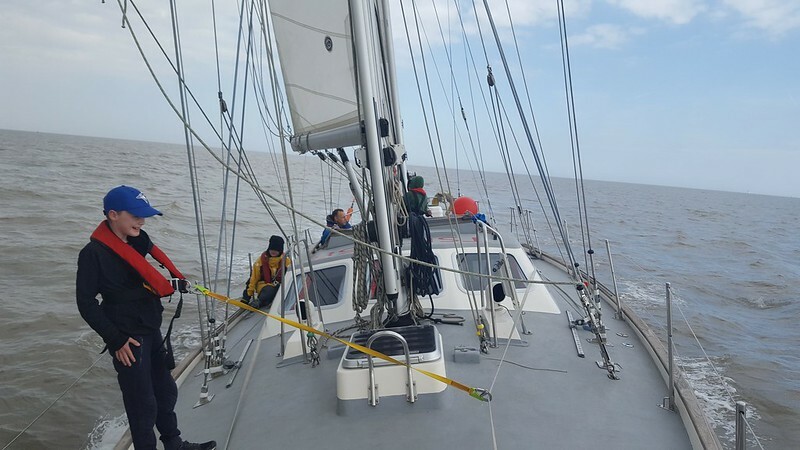 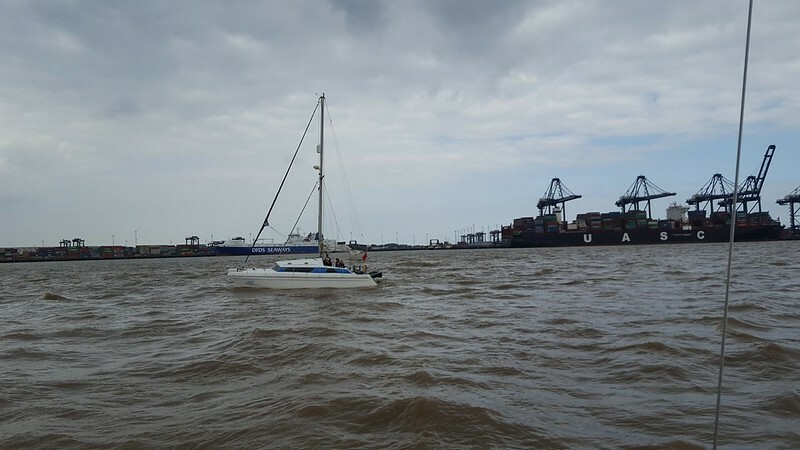 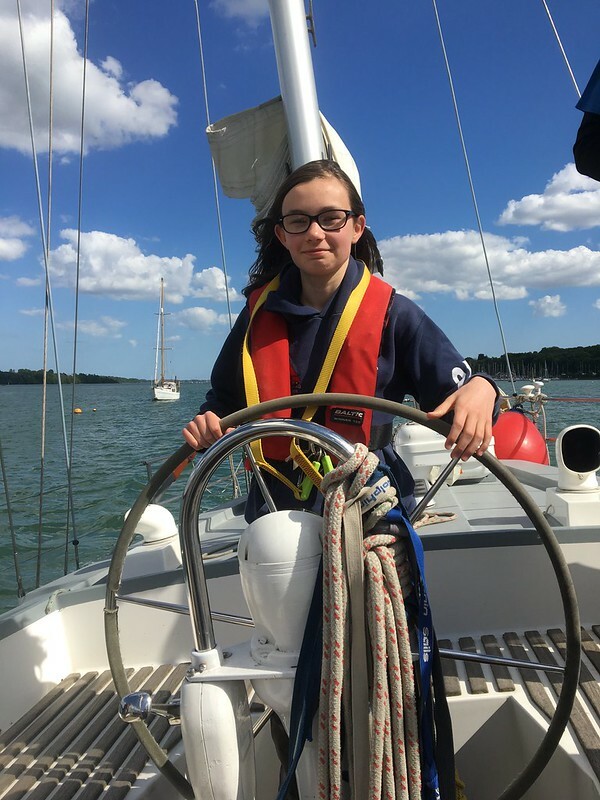 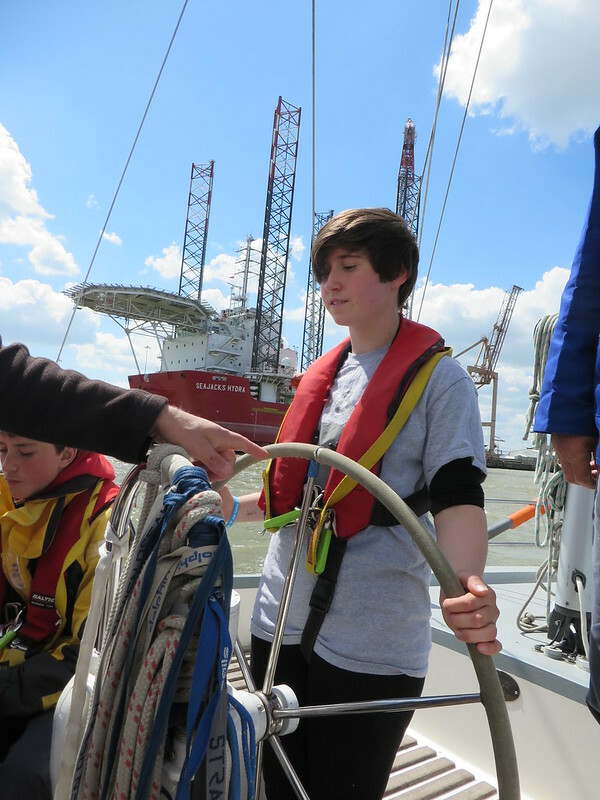 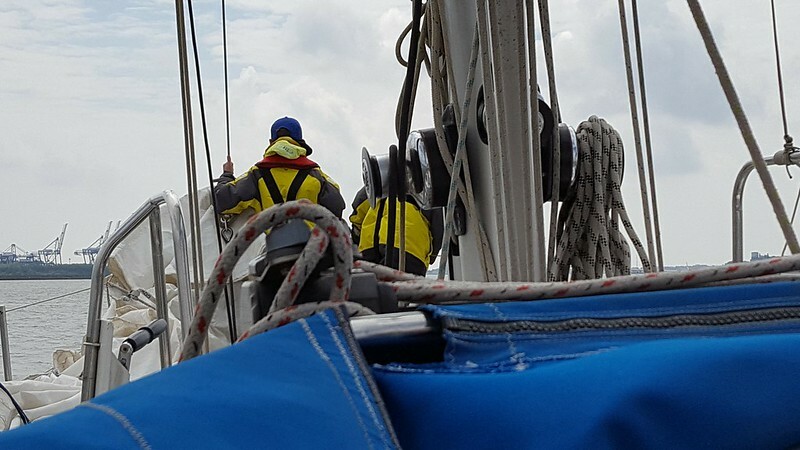 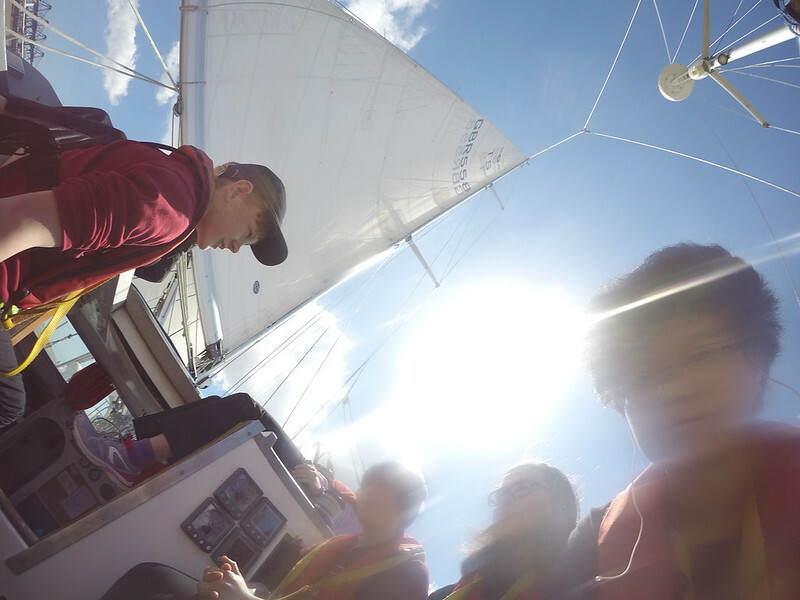 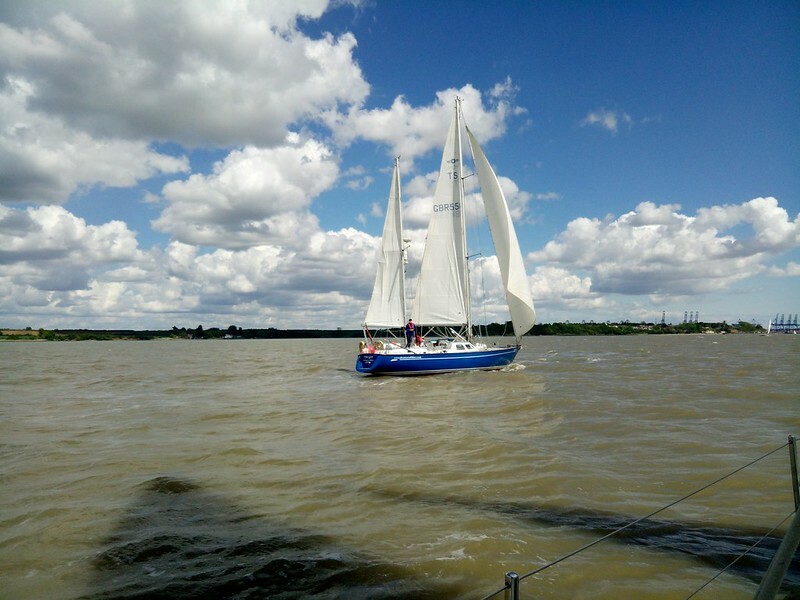 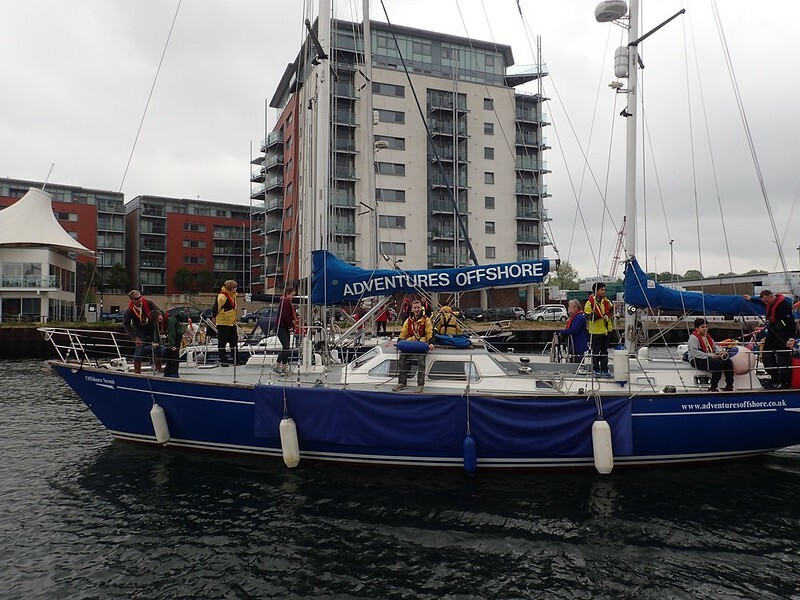 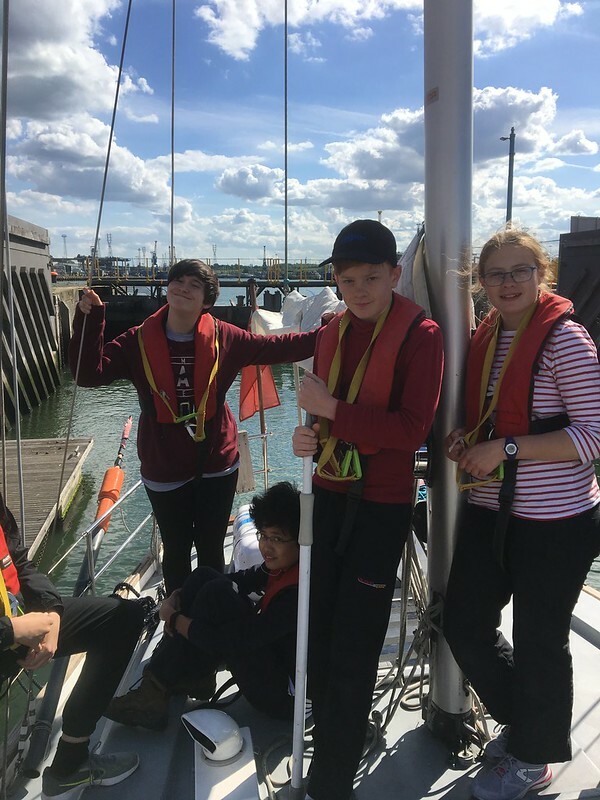 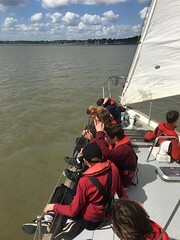 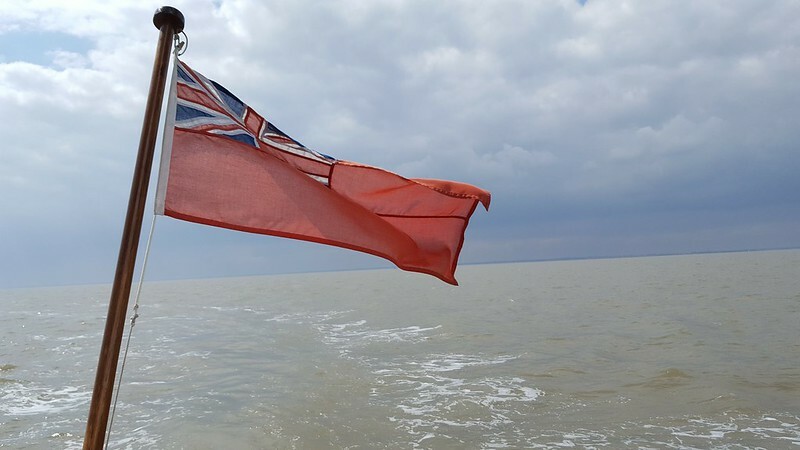 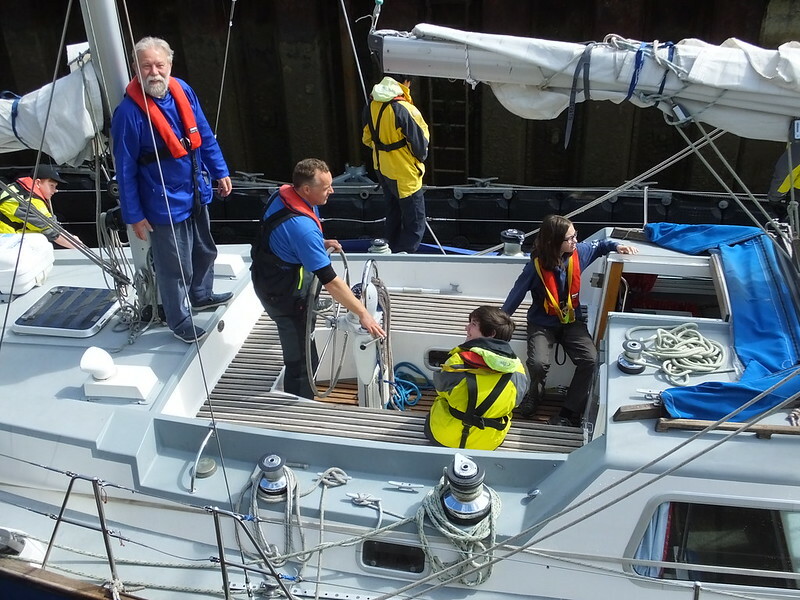 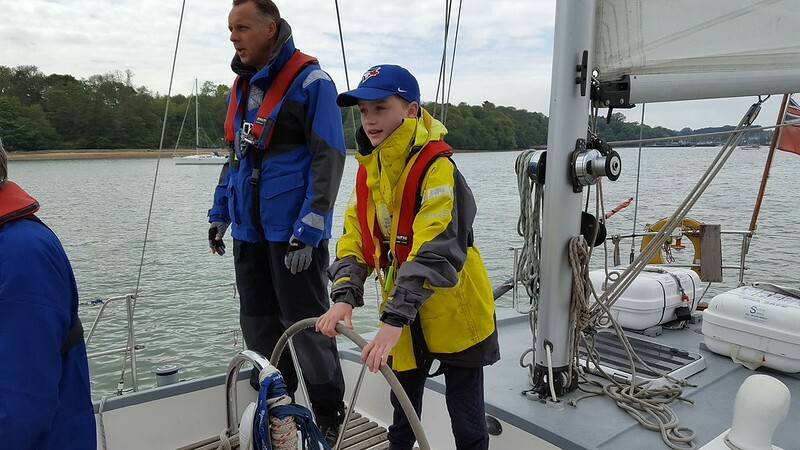 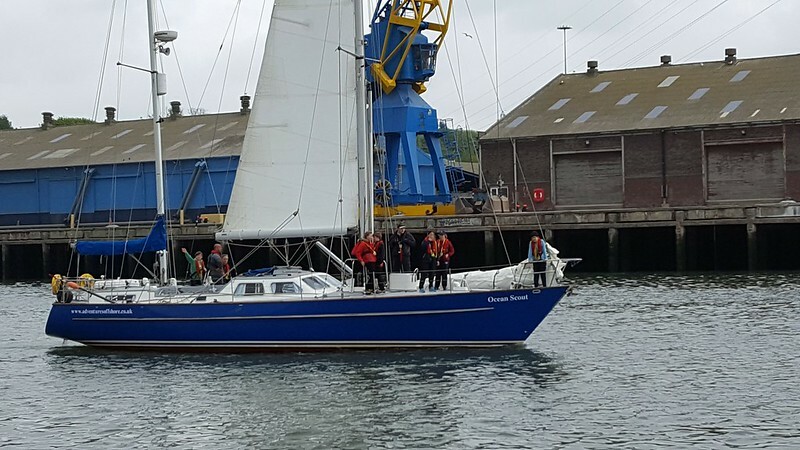 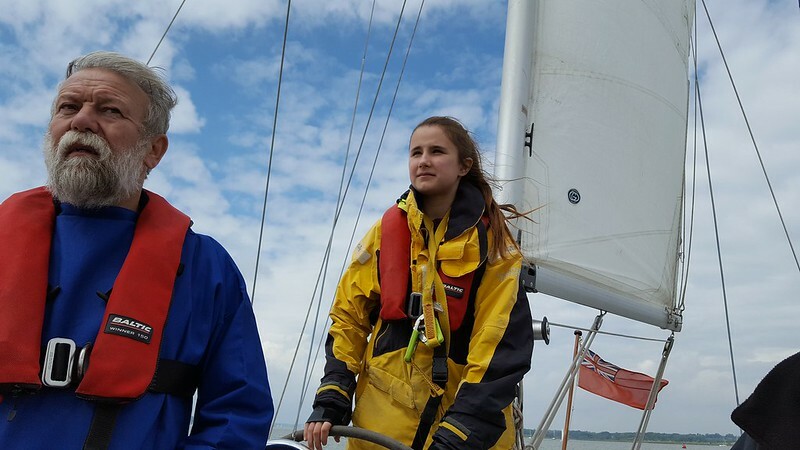 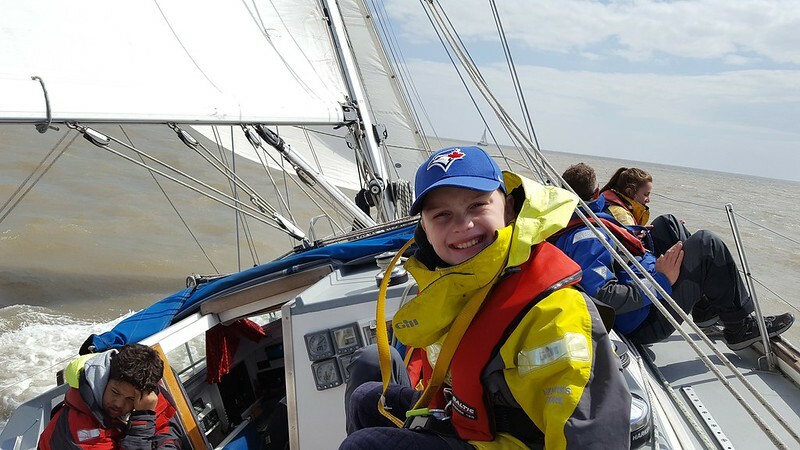 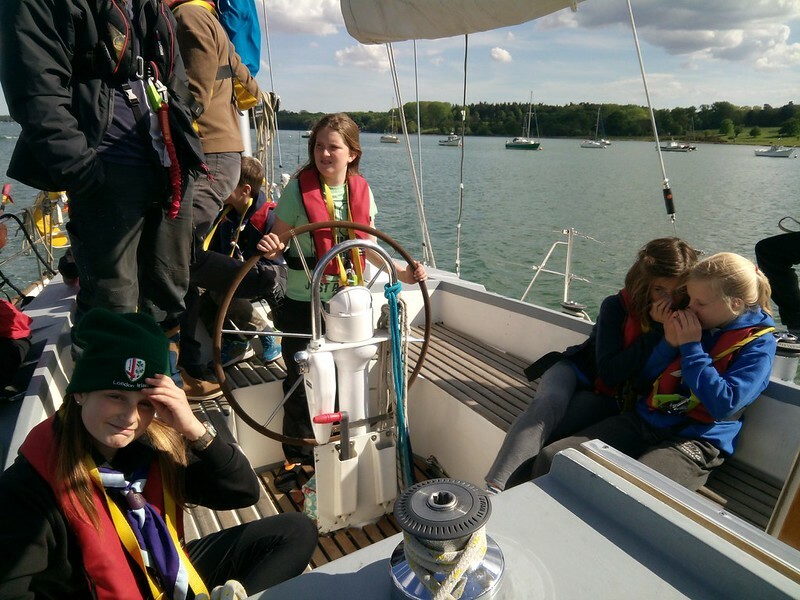 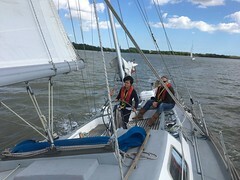 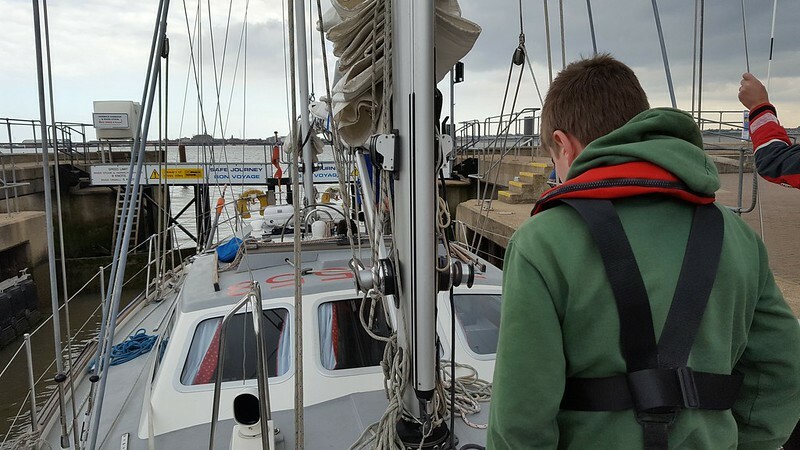 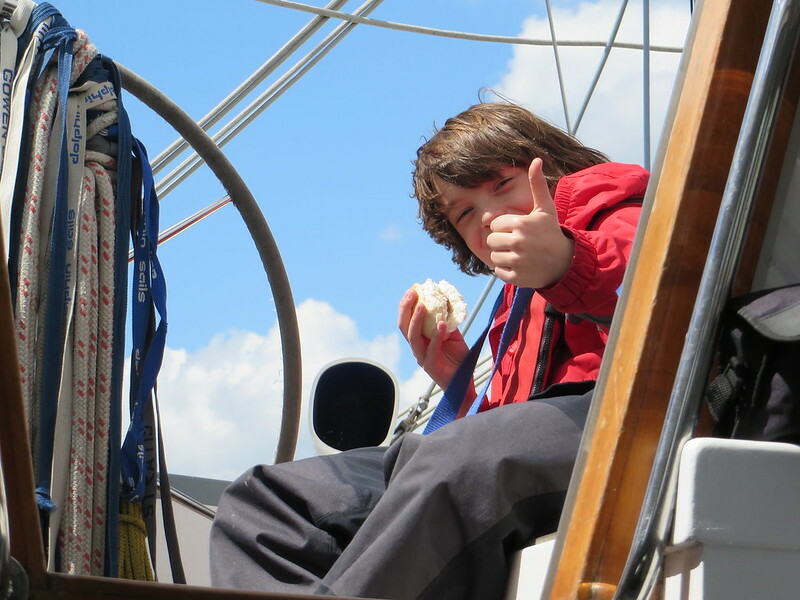 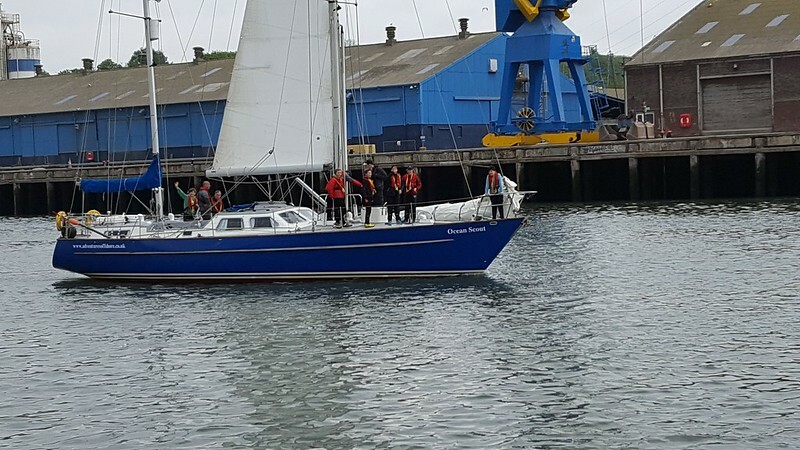 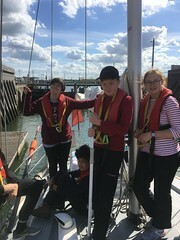 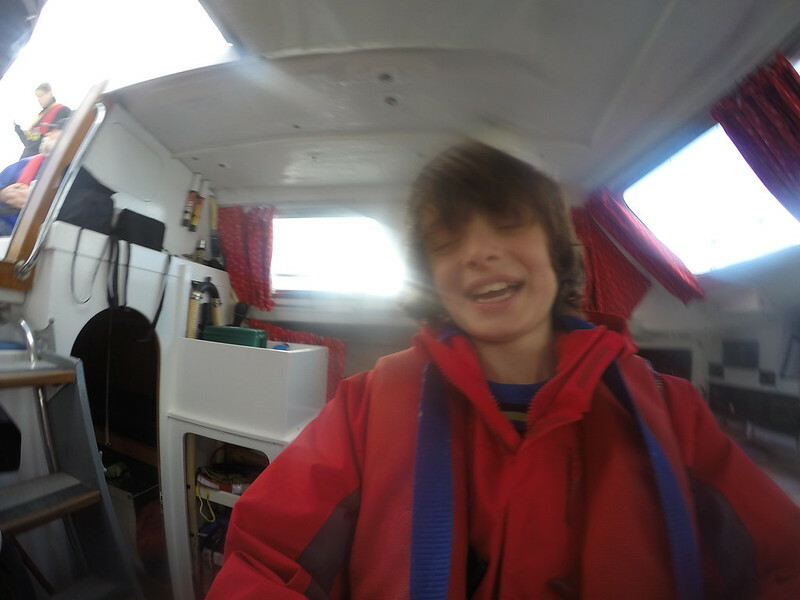 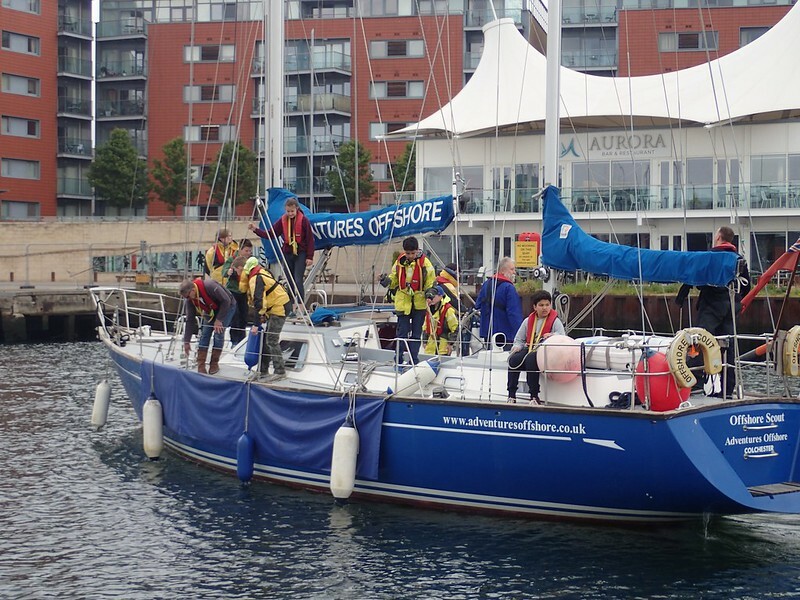 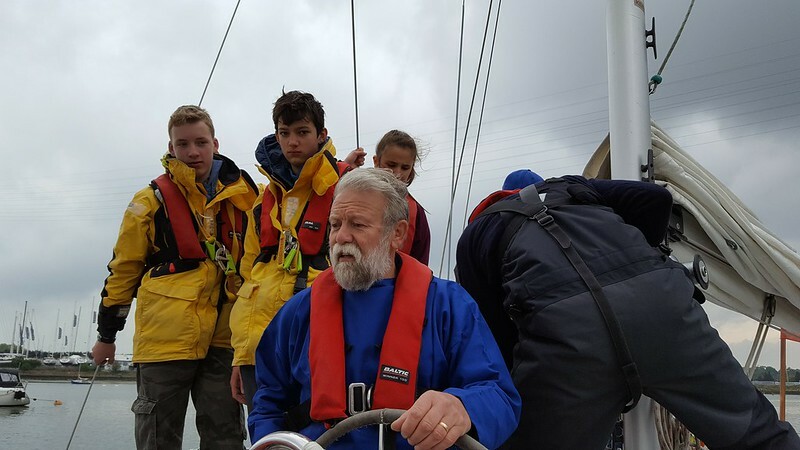 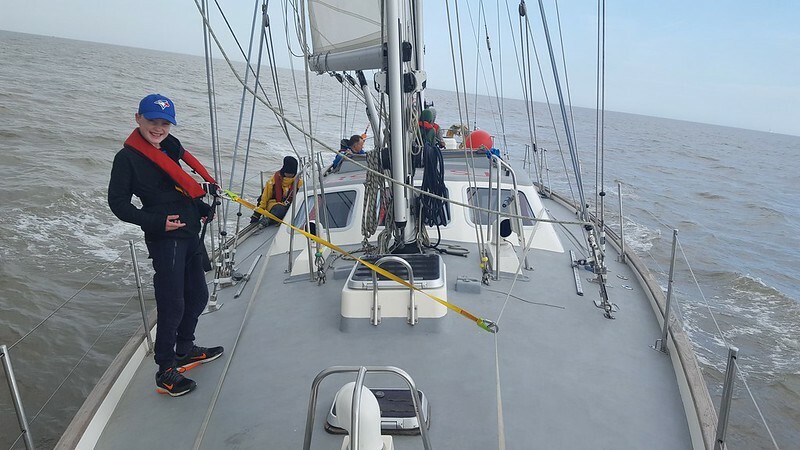 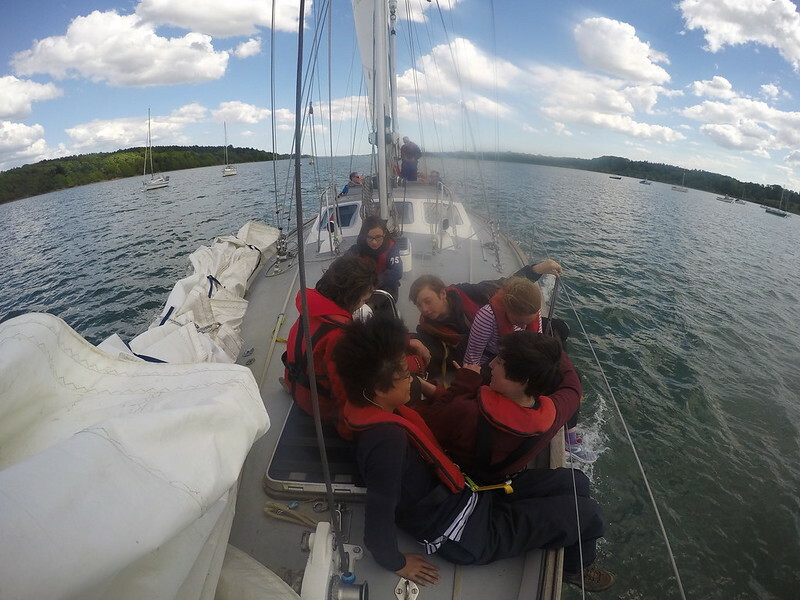 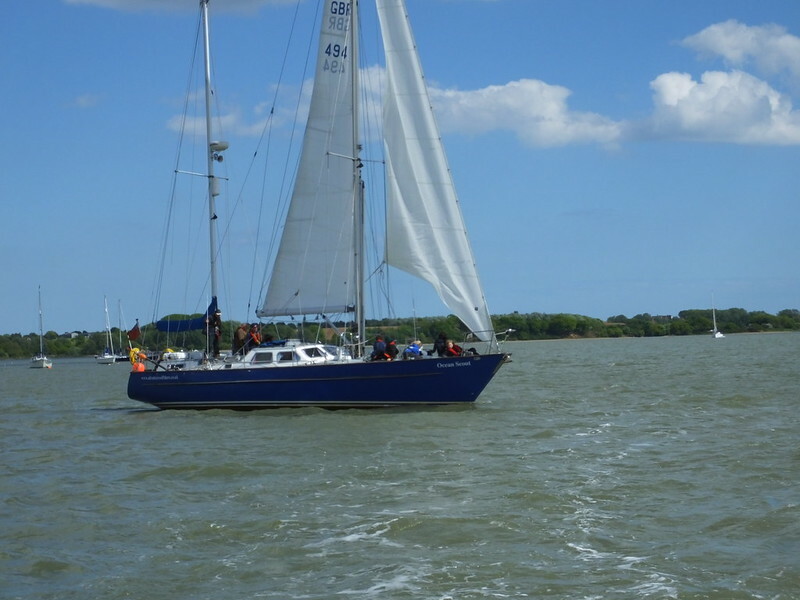 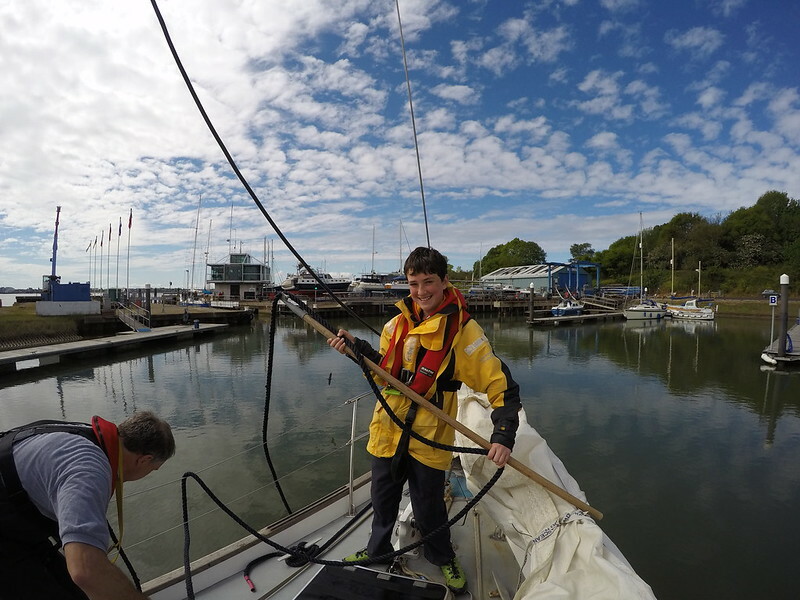 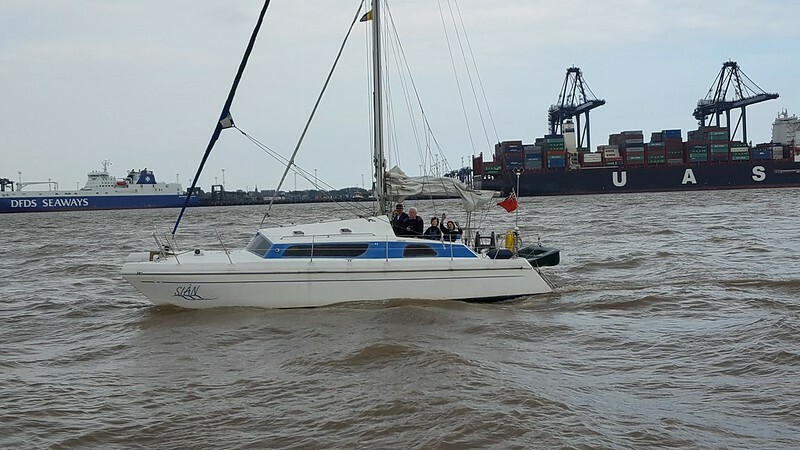 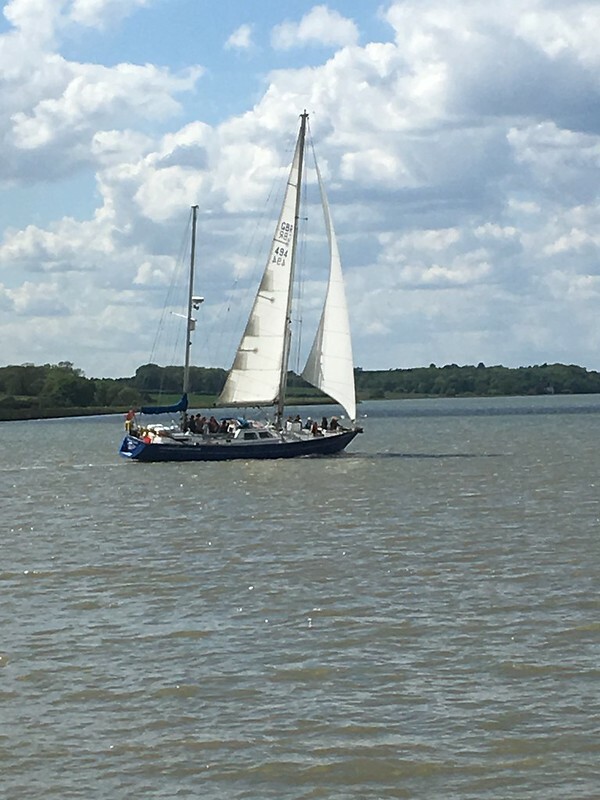 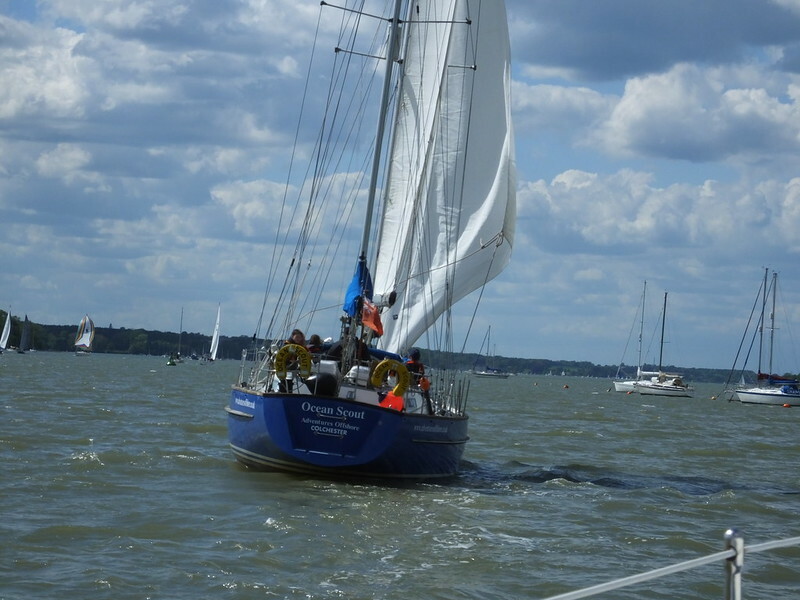 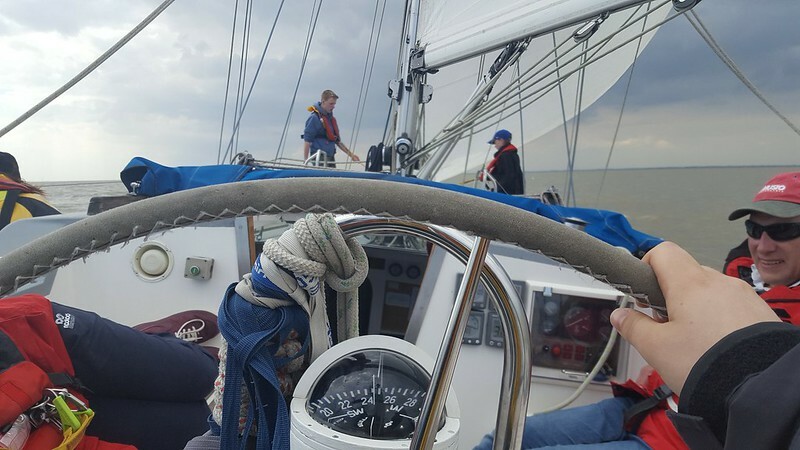 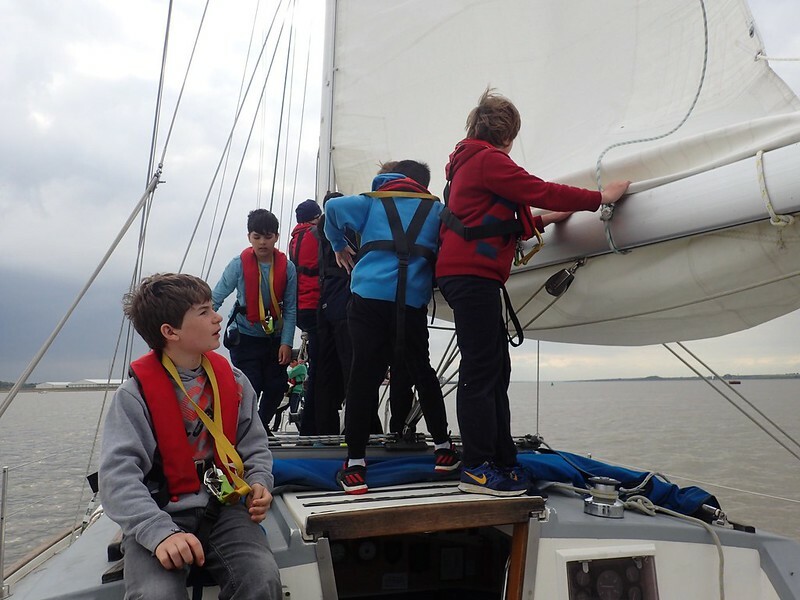 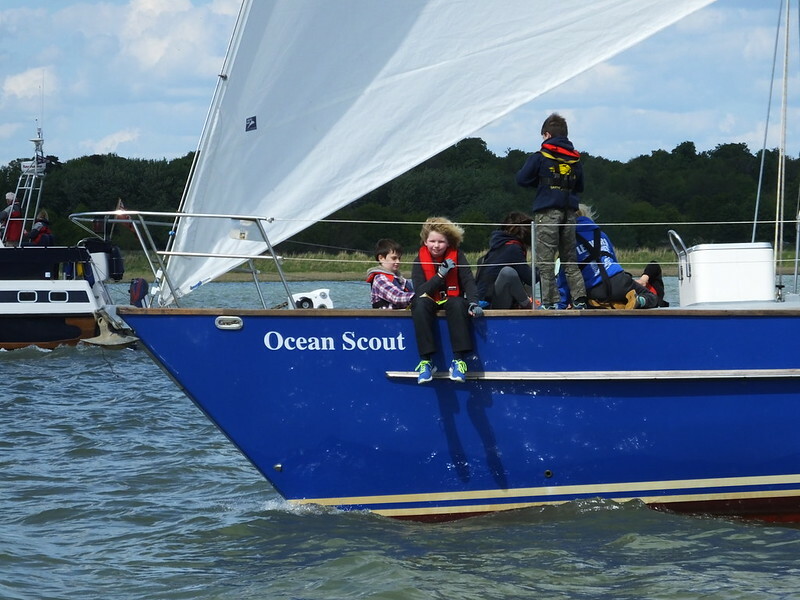 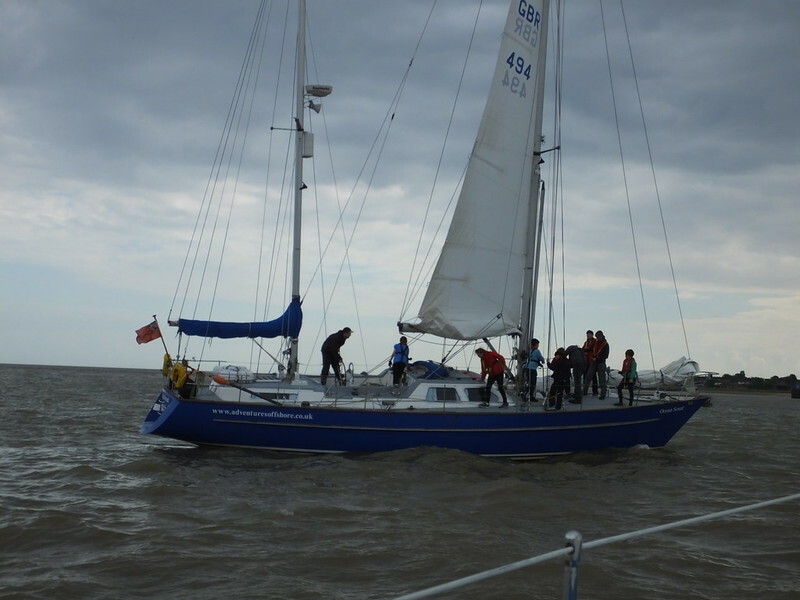 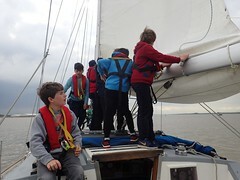 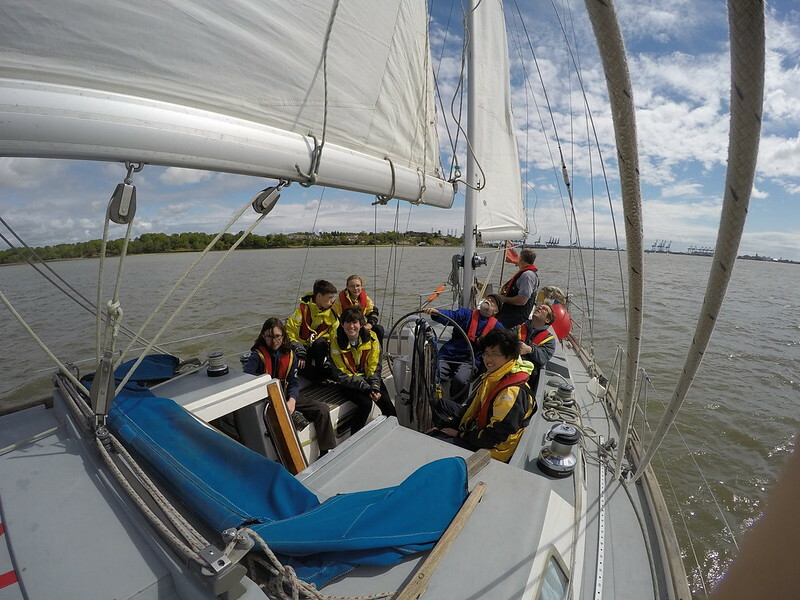 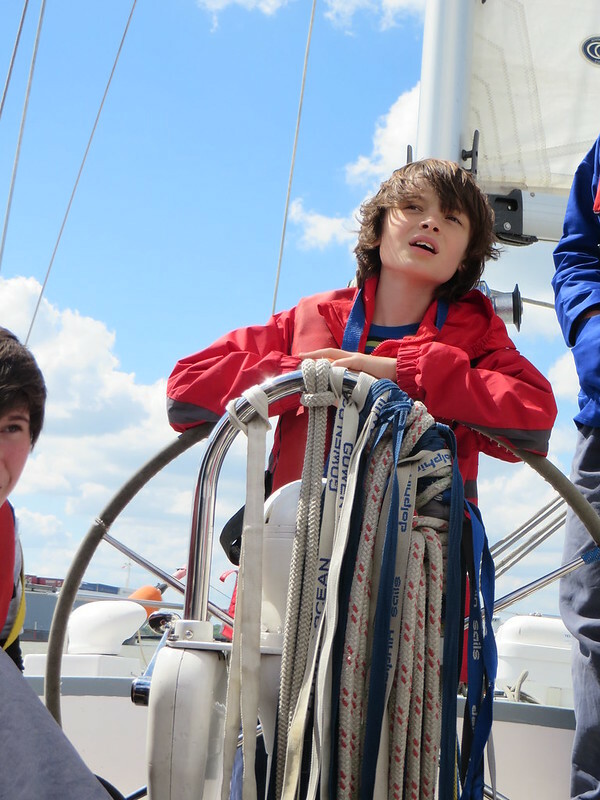 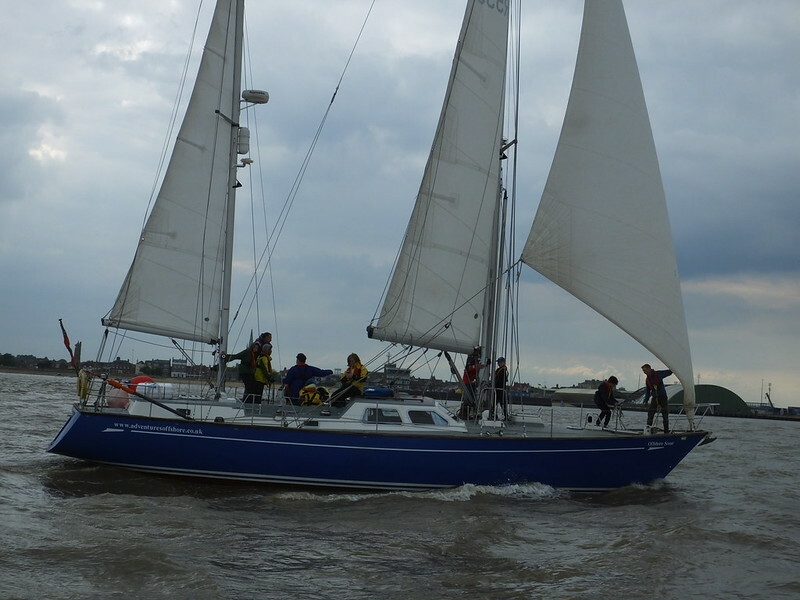 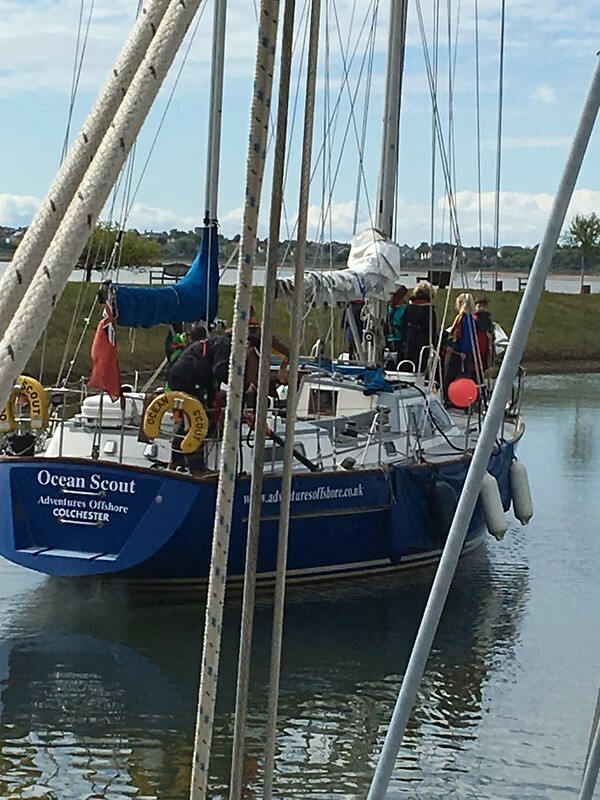 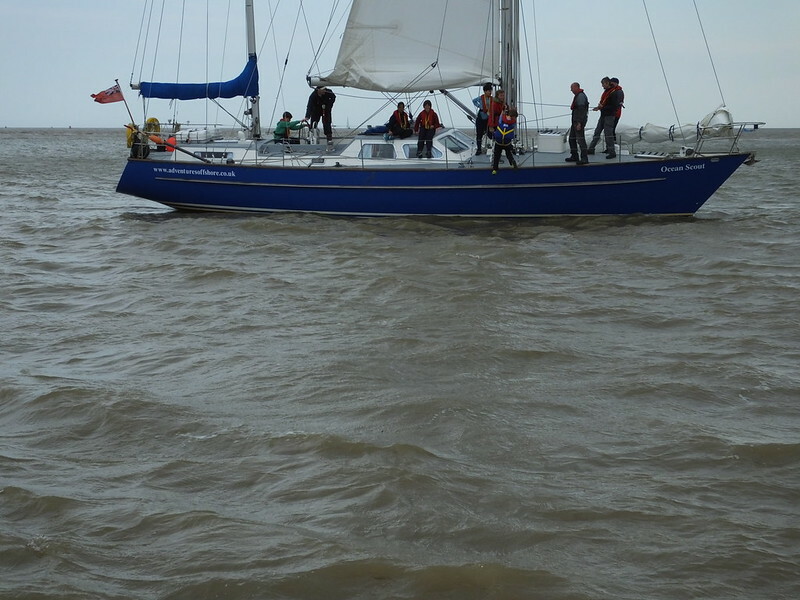 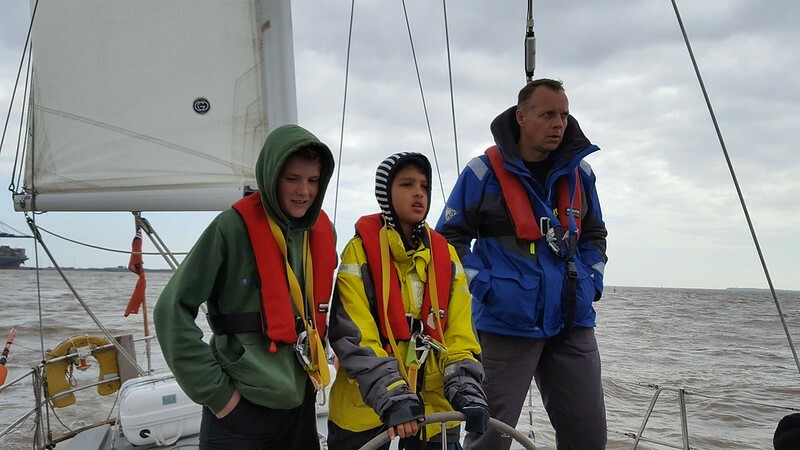 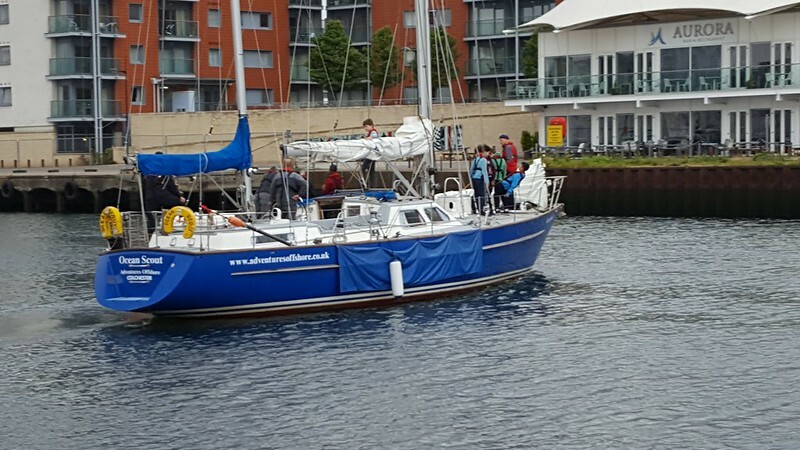 A huge thank you to the skippers and mates of Adventures Offshore for this fantastic introduction to ‘big-boat’ sailing for our novice sea-farers! 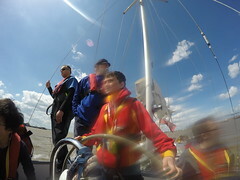 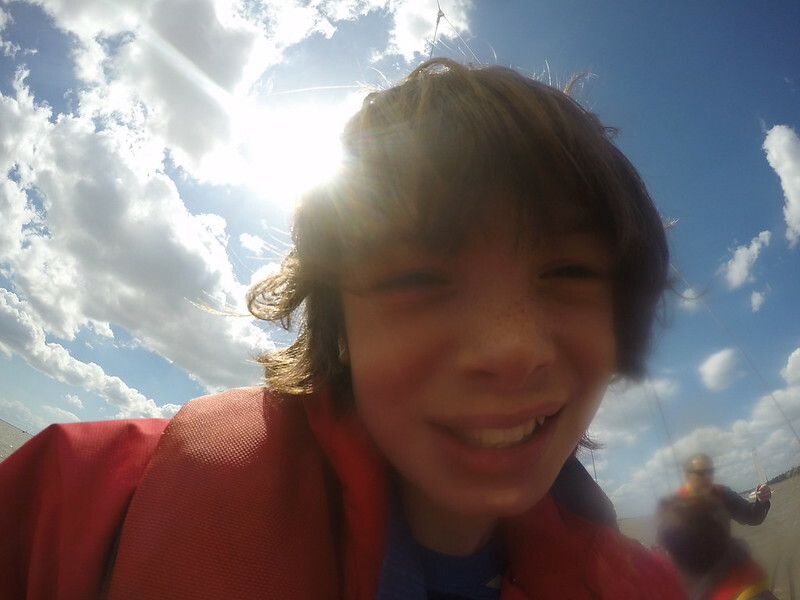 This entry was posted in Featured, Scouts News by Colin Sills. Bookmark the permalink.